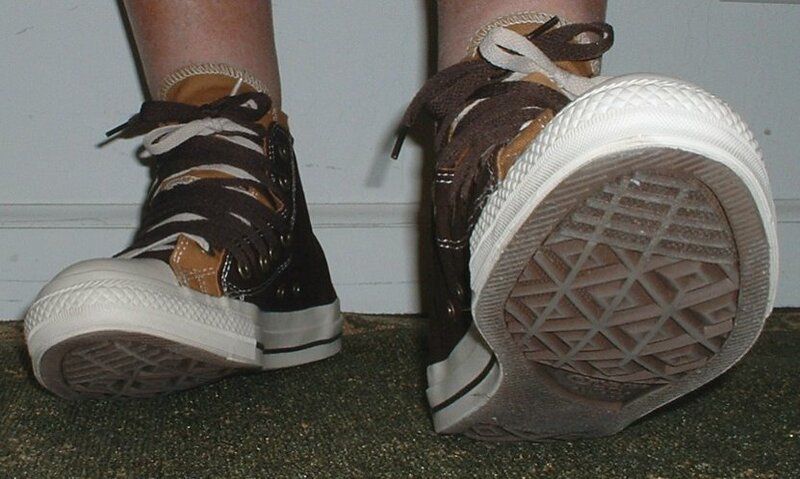 Photo gallery of various pairs of double upper high top chucks. 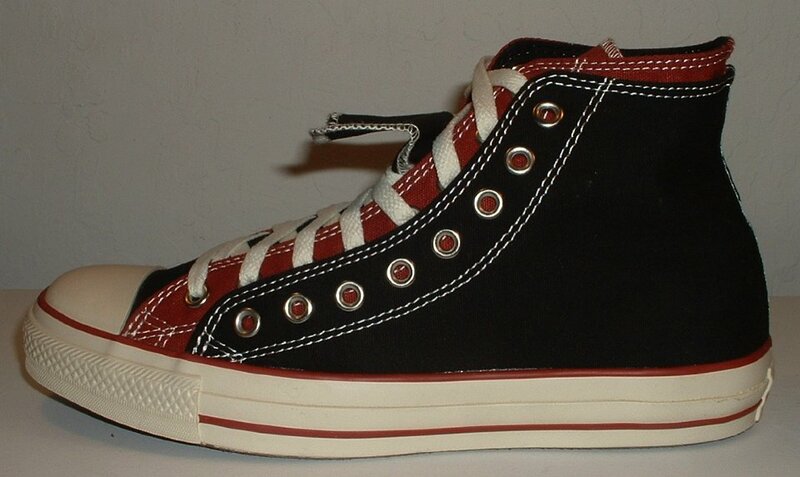 1 Double Upper High Top Chucks Inside patch view of a right black and brick red double upper high top. 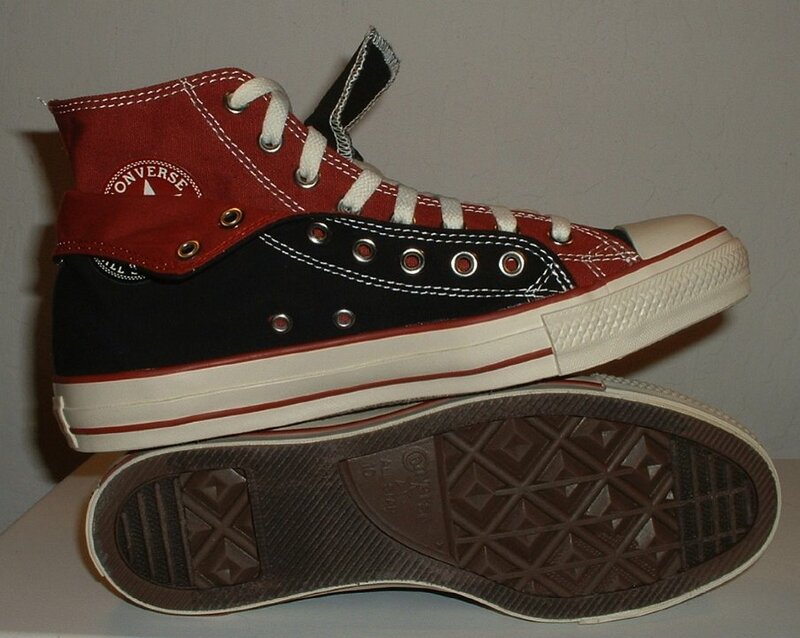 2 Double Upper High Top Chucks Outside view of a right black and brick red double upper high top. 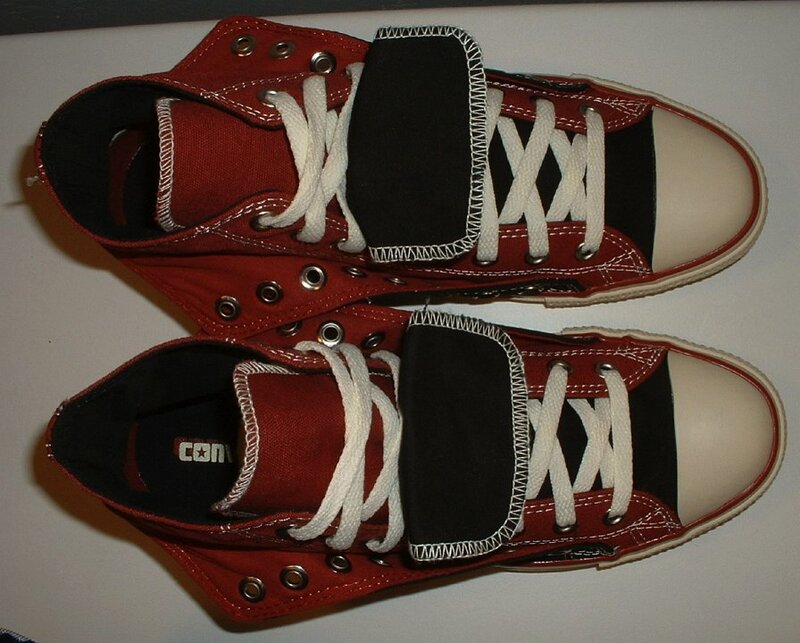 3 Double Upper High Top Chucks Inside patch view of a left black and brick red double upper high top. 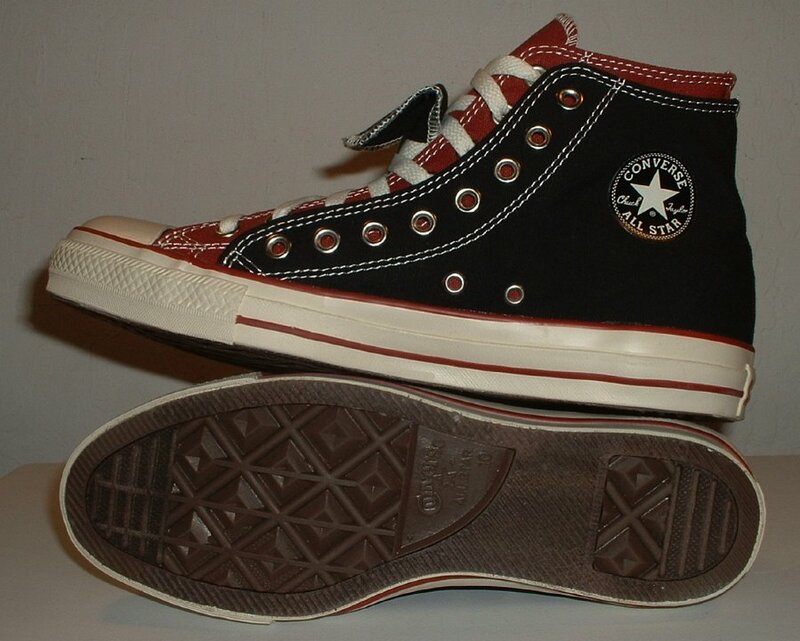 4 Double Upper High Top Chucks Outside view of a left black and brick red double upper high top. 5 Double Upper High Top Chucks Rear view of black and brick red double upper high tops. 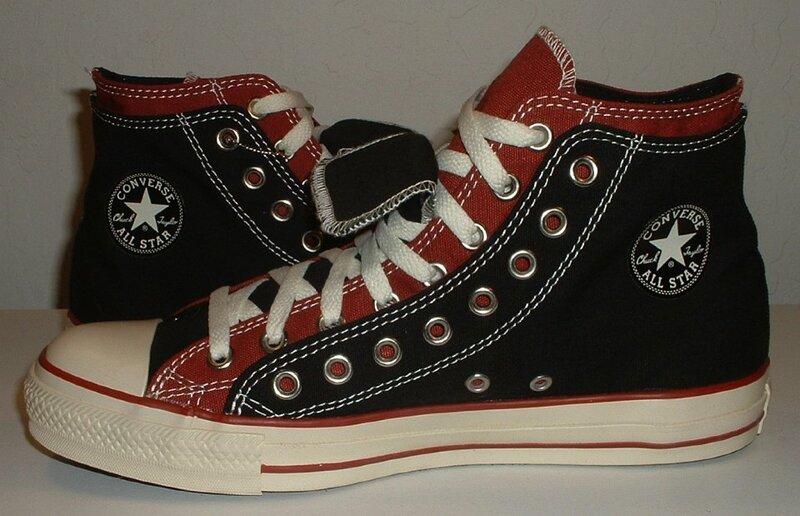 6 Double Upper High Top Chucks Angled rear view of black and brick red double upper high tops. 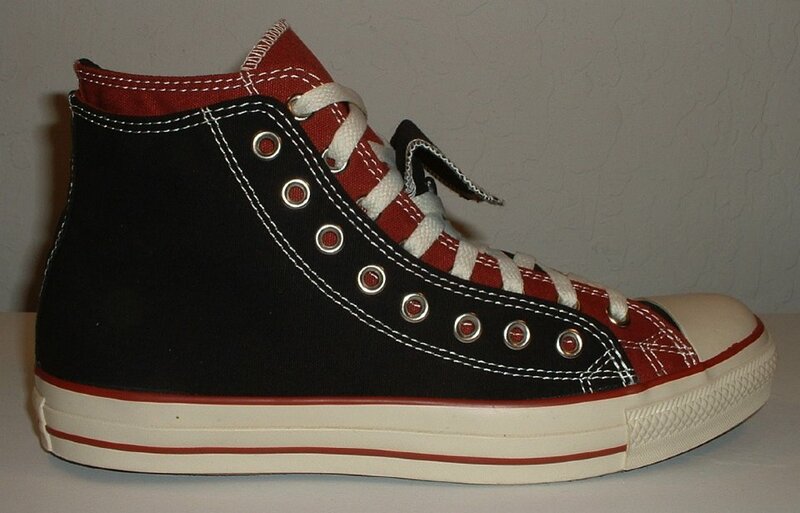 7 Double Upper High Top Chucks Angled side view of black and brick red double upper high tops. 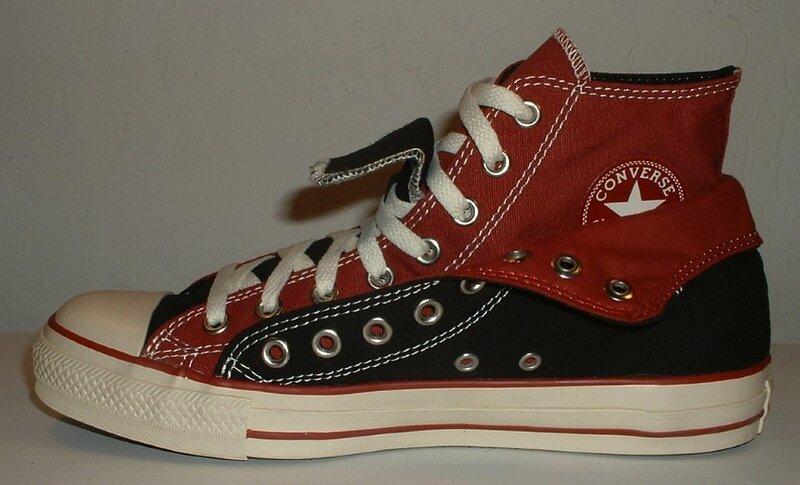 8 Double Upper High Top Chucks Front view of black and brick red double upper high tops. 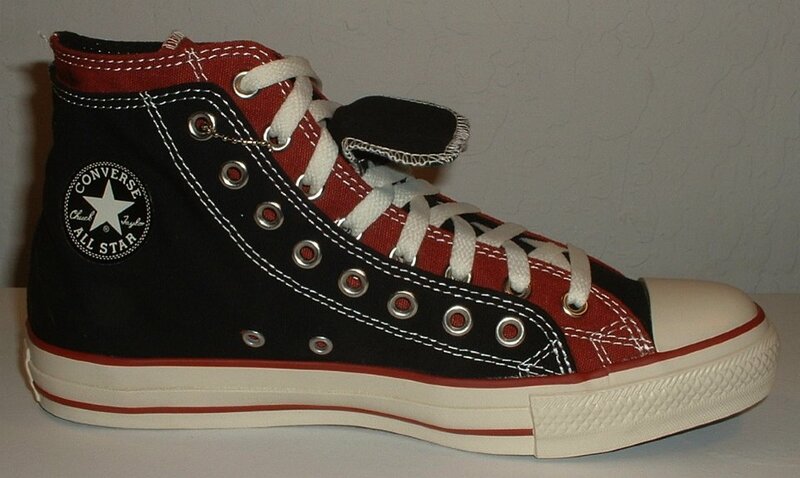 9 Double Upper High Top Chucks Angled front view of black and brick red double upper high tops. 10 Double Upper High Top Chucks Top view of black and brick red double upper high tops. 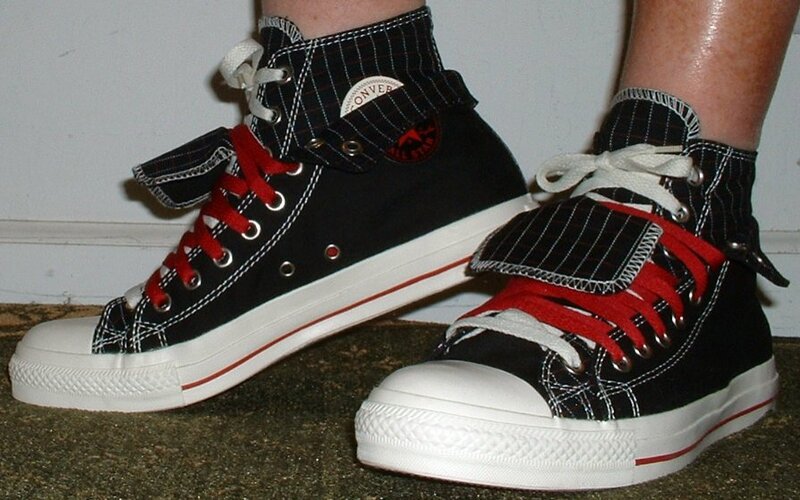 11 Double Upper High Top Chucks Inside patch views of black and brick red double upper high tops. 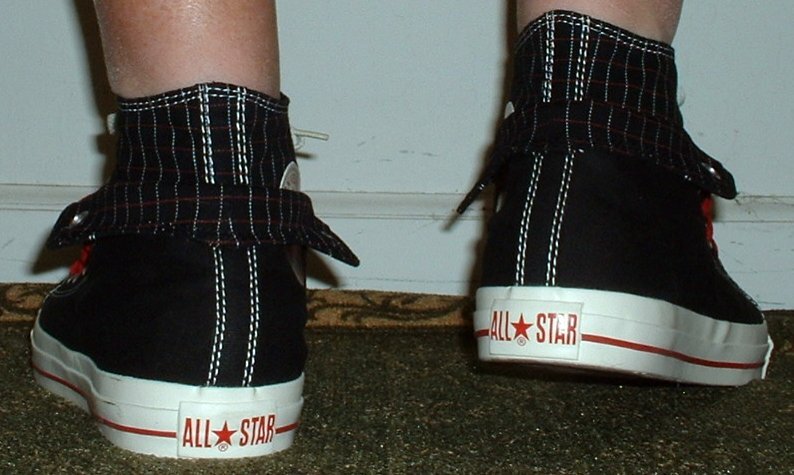 12 Double Upper High Top Chucks Outside views of black and brick red double upper high tops. 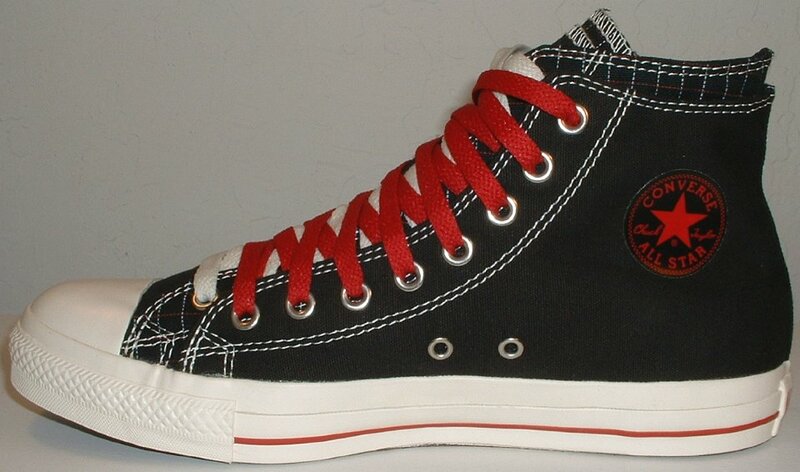 13 Double Upper High Top Chucks Inside patch and sole views of black and brick red double upper high tops. 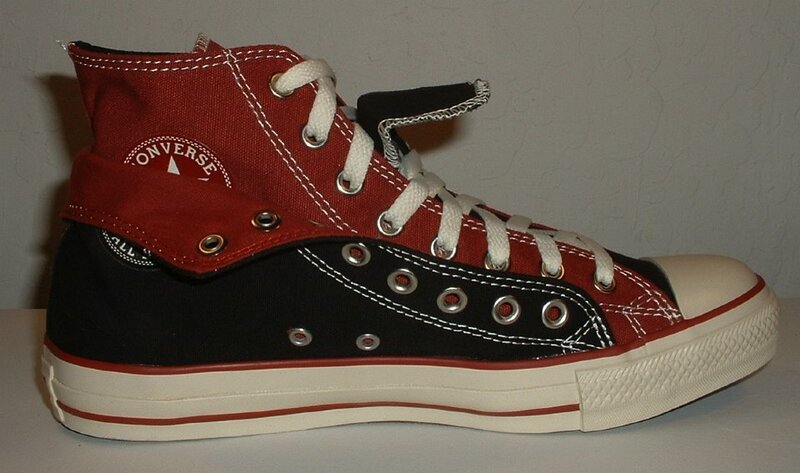 14 Double Upper High Top Chucks Inside patch view of a folded down left black and brick red double upper high top. 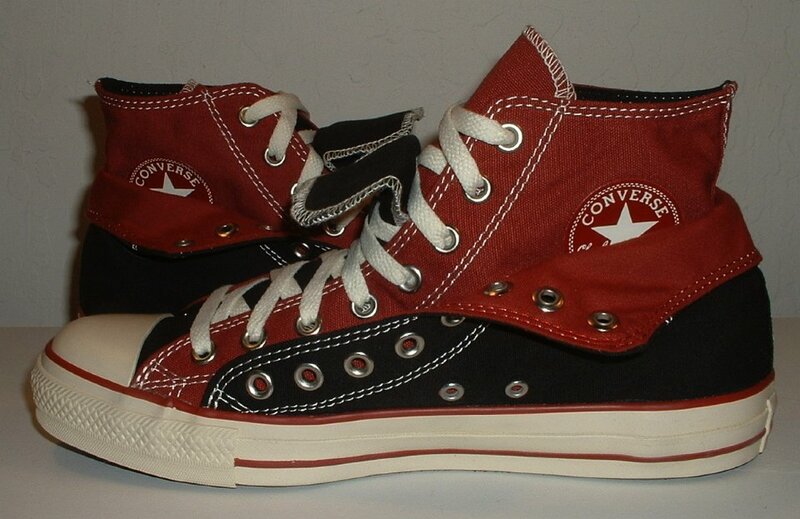 15 Double Upper High Top Chucks Outside view of a folded down left black and brick red double upper high top. 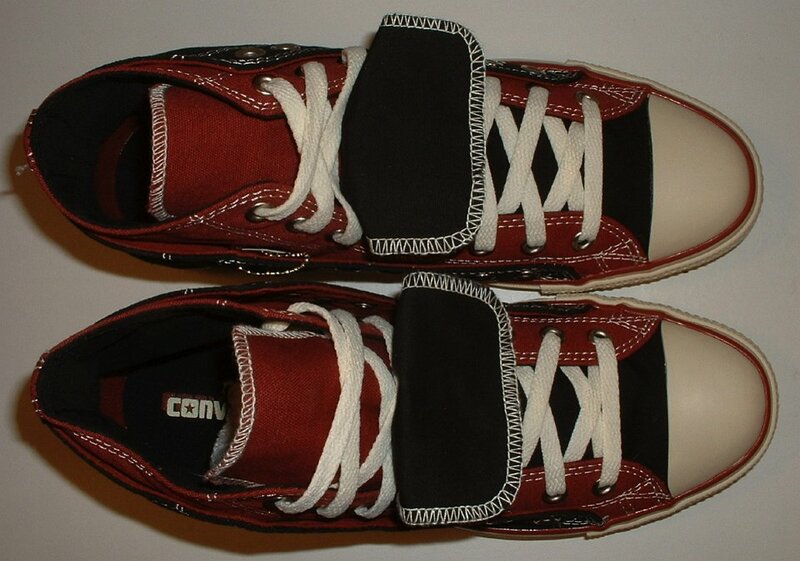 16 Double Upper High Top Chucks Inside patch view of a folded down right black and brick red double upper high top. 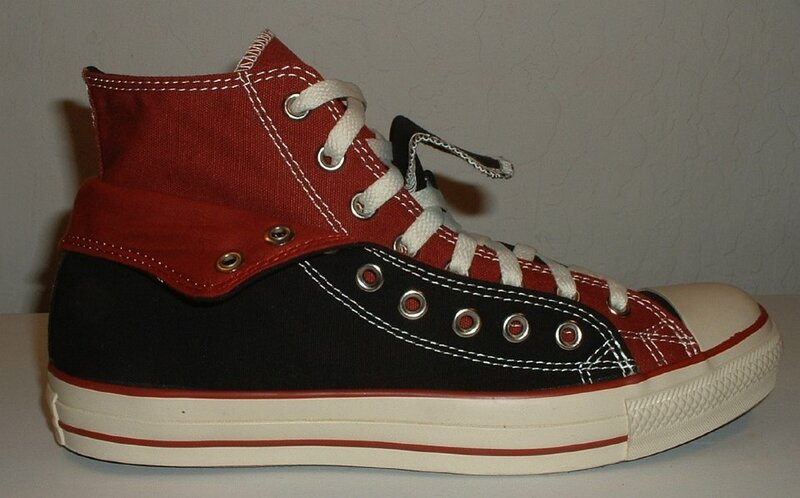 17 Double Upper High Top Chucks Outside view of a folded down right black and brick red double upper high top. 18 Double Upper High Top Chucks Rear view of folded down black and brick red double upper high tops. 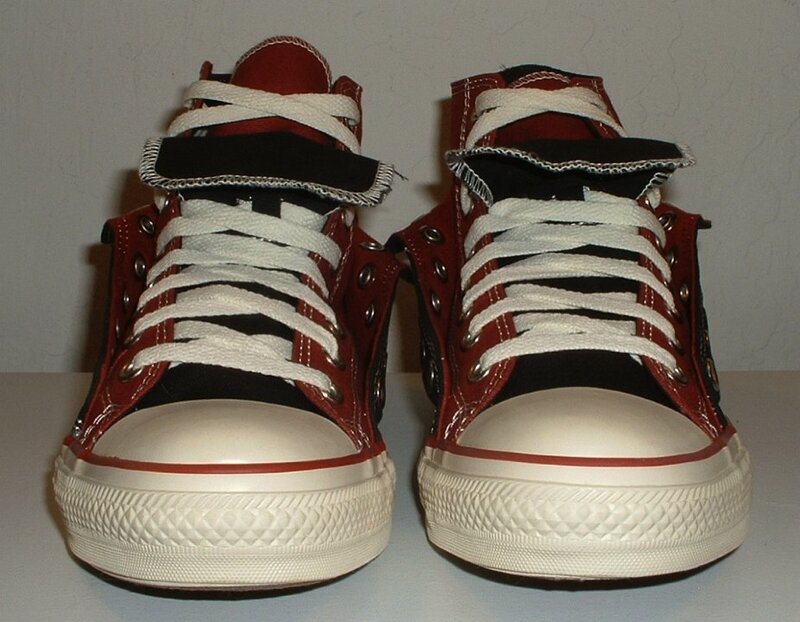 19 Double Upper High Top Chucks Angled rear view of folded down black and brick red double upper high tops. 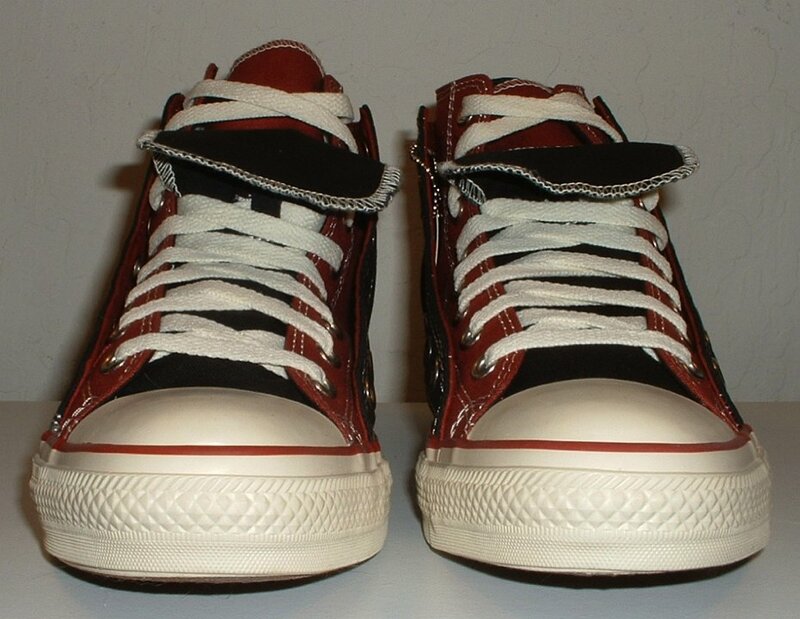 20 Double Upper High Top Chucks Angled side view of folded down black and brick red double upper high tops. 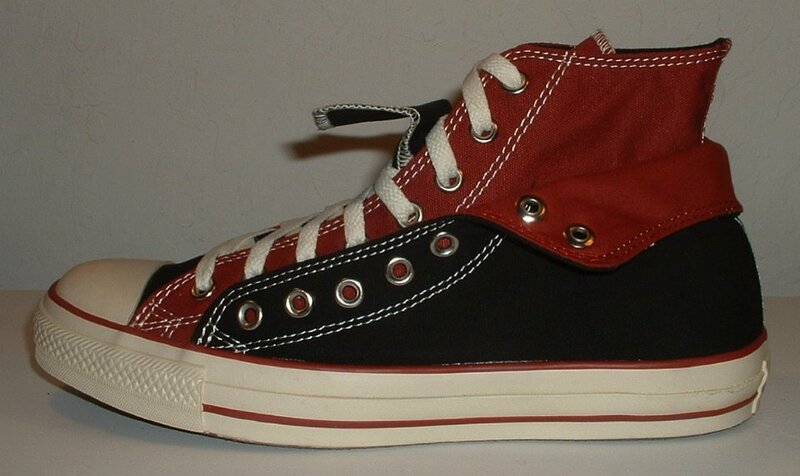 21 Double Upper High Top Chucks Front view of folded down black and brick red double upper high tops. 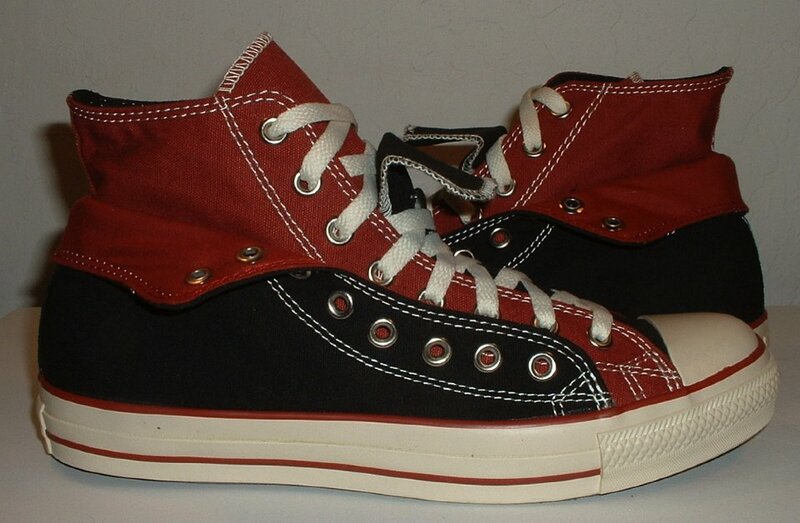 22 Double Upper High Top Chucks Angled front view of folded down black and brick red double upper high tops. 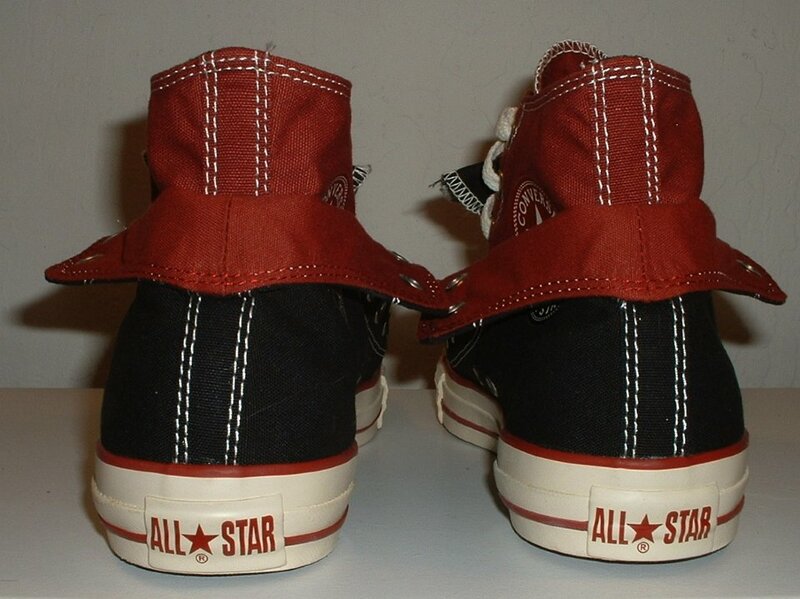 23 Double Upper High Top Chucks Top view of folded down black and brick red double upper high tops. 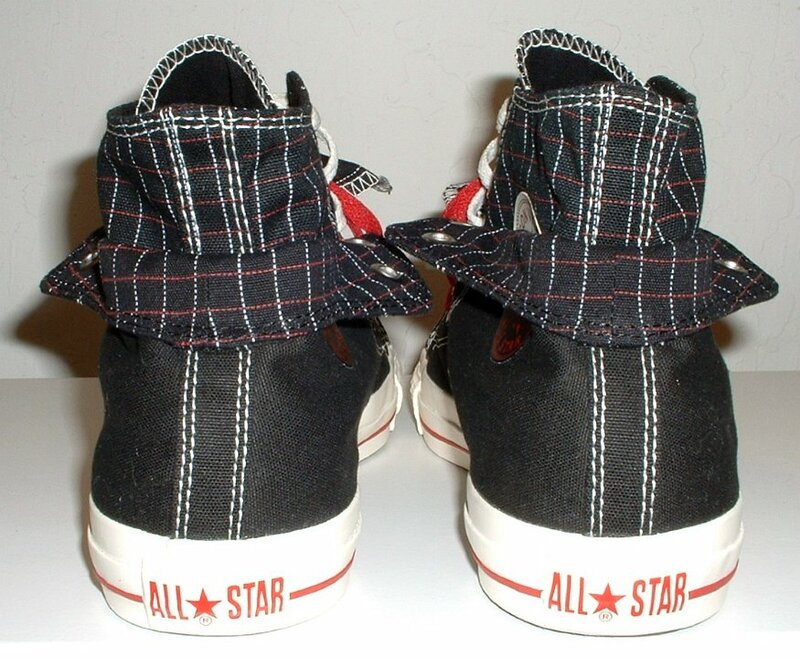 24 Double Upper High Top Chucks Inside patch views of folded down black and brick red double upper high tops. 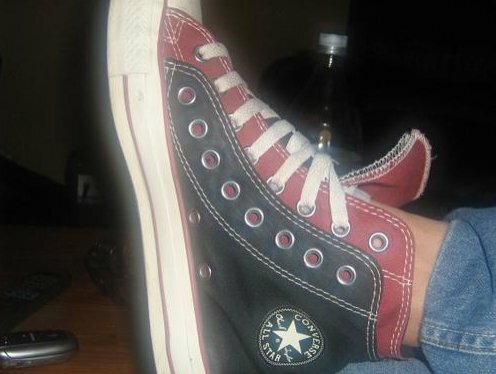 25 Double Upper High Top Chucks Outside views of folded down black and brick red double upper high tops. 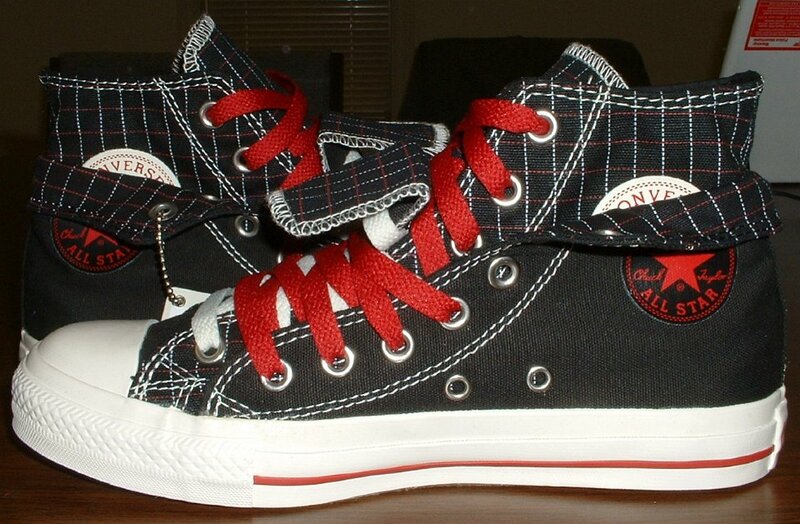 26 Double Upper High Top Chucks Inside patch and sole views of folded down black and brick red double upper high tops. 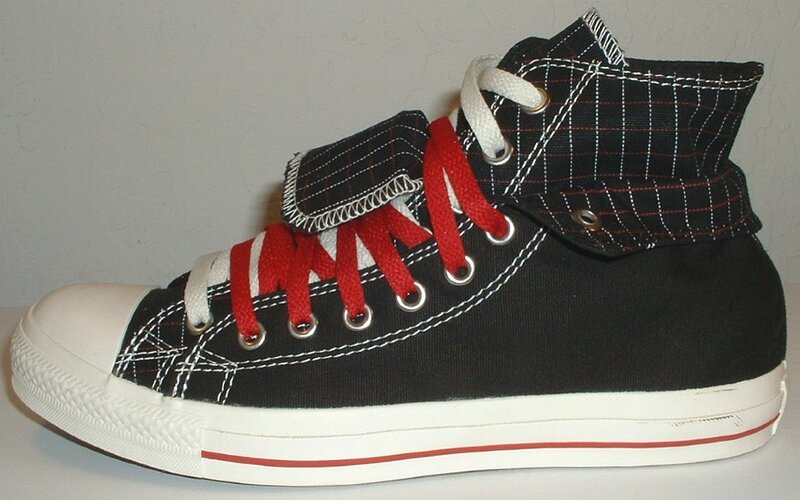 27 Double Upper High Top Chucks Wearing black and brick red double upper high top chucks. 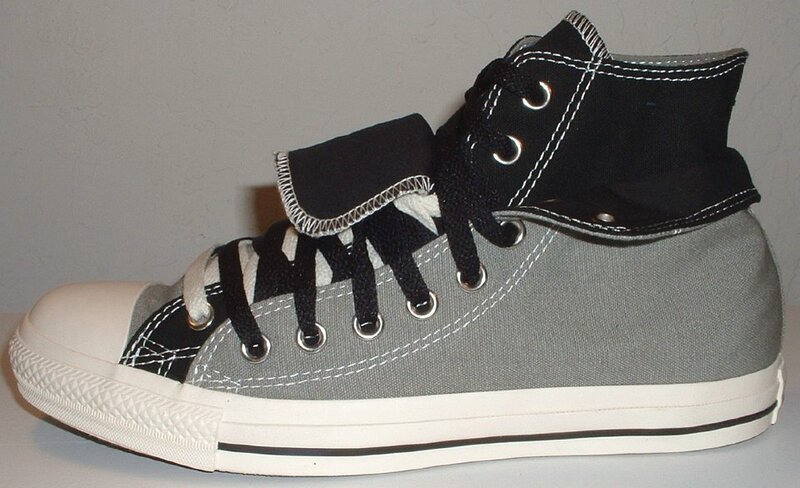 28 Double Upper High Top Chucks Photo of black and grey double upper high top chucks with their box. 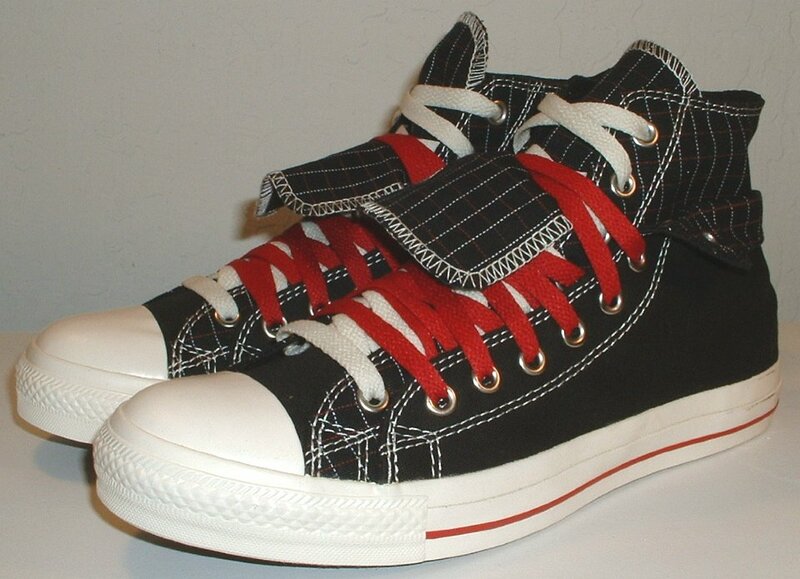 29 Double Upper High Top Chucks Outside view of a right black, red, and white double upper high top, with the outer upper rolled down. 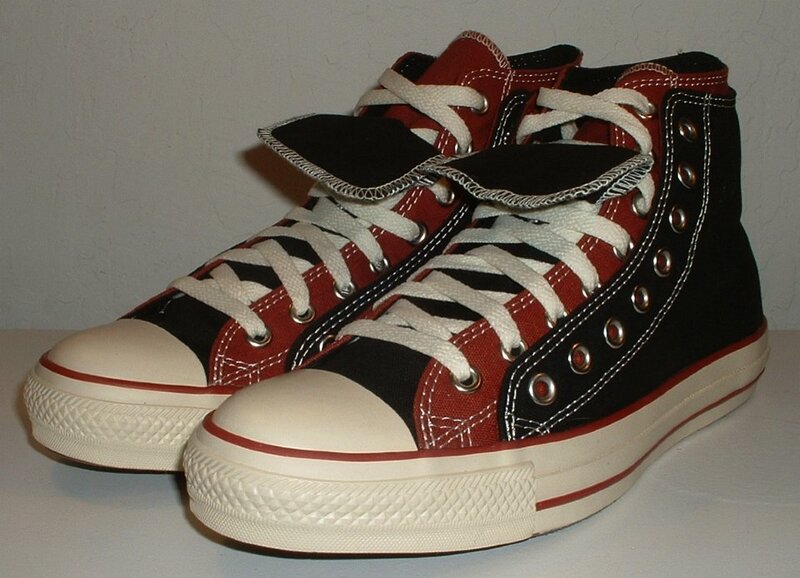 30 Double Upper High Top Chucks Outside view of a left black, red, and white double upper high top, with the outer upper rolled down. 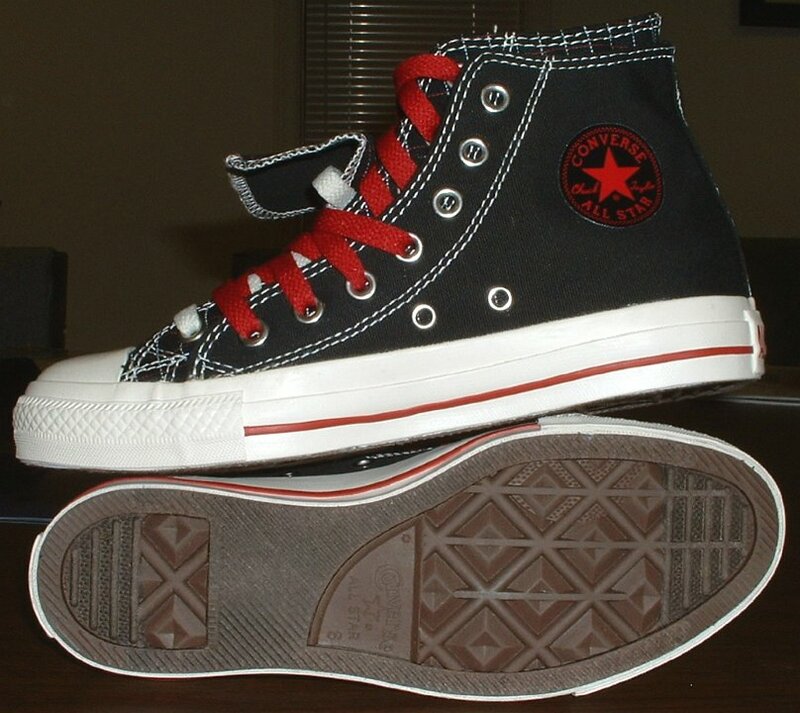 31 Double Upper High Top Chucks Inside patch view of a right black, milk, and red double upper high top, with the outer upper rolled down. 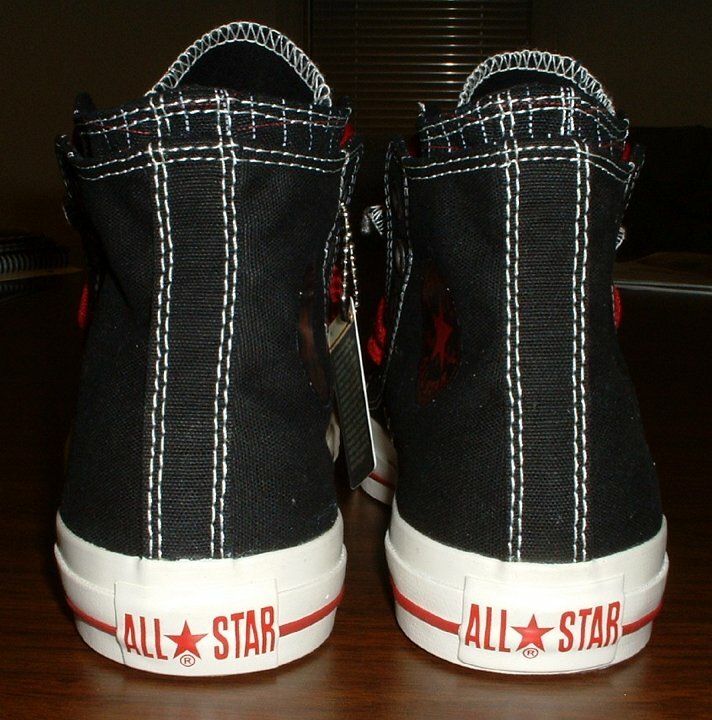 32 Double Upper High Top Chucks Inside patch view of a left black, red, and milk double upper high top, with the outer upper rolled down. 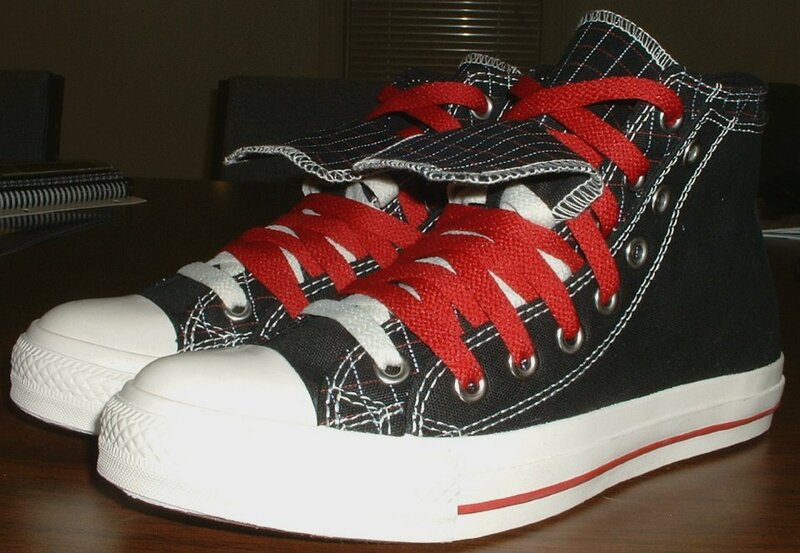 33 Double Upper High Top Chucks Top view of black, red, and milk double upper high tops, with the outer upper rolled down. 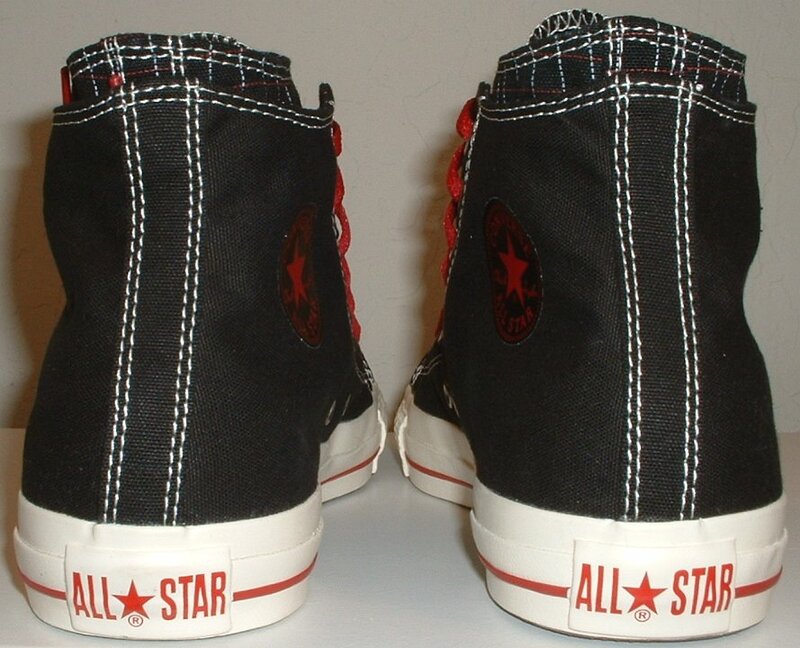 34 Double Upper High Top Chucks Inside patch views of black, red, and milk double upper high tops, with the outer uppers rolled down. 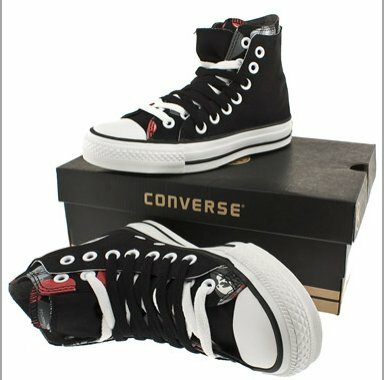 35 Double Upper High Top Chucks Angled front views of black, red, and milk double upper high tops, with the outer uppers rolled down. 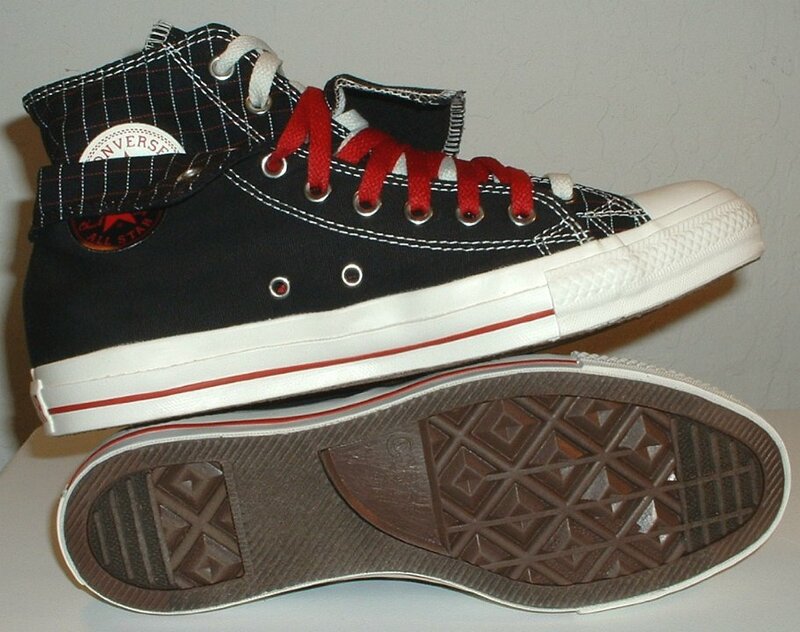 36 Double Upper High Top Chucks Rear view of black, red, and milk double upper high tops, with the outer upper rolled down. 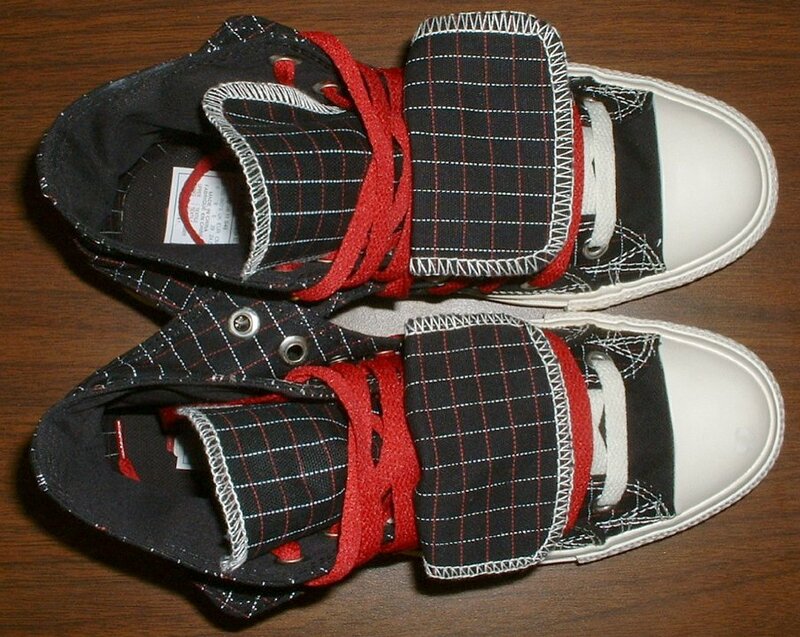 37 Double Upper High Top Chucks Angled side view of black, red, and milk double upper high tops, with the outer upper rolled down. 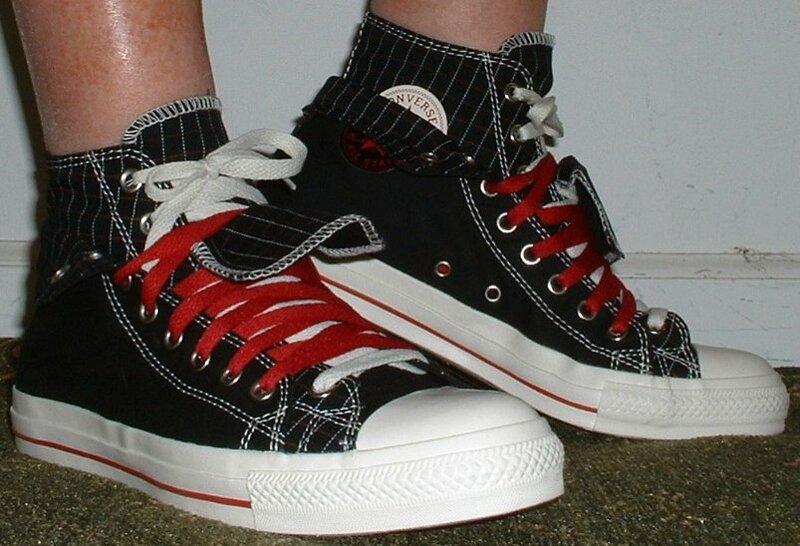 38 Double Upper High Top Chucks Inside patch and sole views of black, red, and milk double upper high tops, with the outer uppers rolled down. 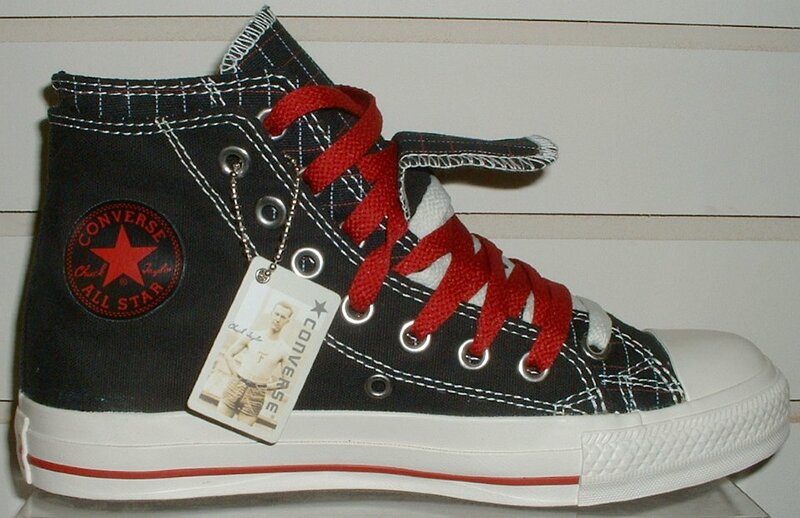 39 Double Upper High Top Chucks Inside patch view of a left black, red, and milk double upper high top, new with tag. 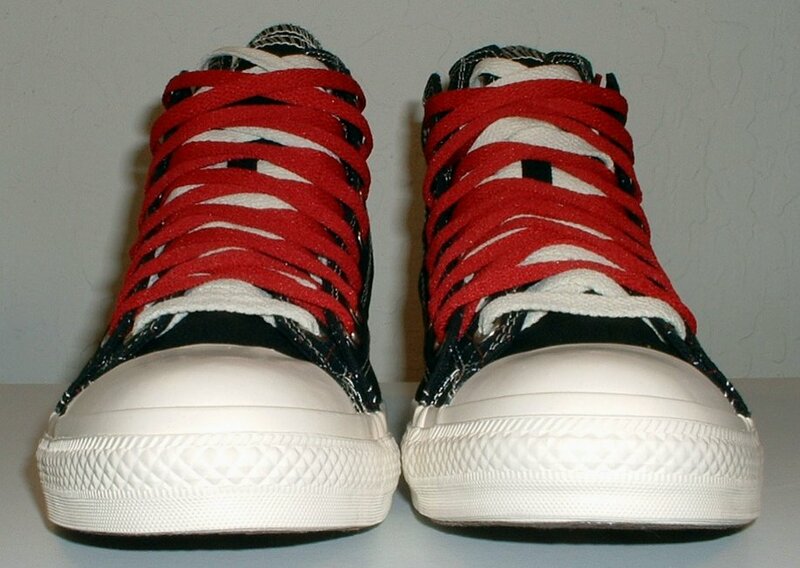 40 Double Upper High Top Chucks Inside patch view of a right black, red, and milk double upper high top. 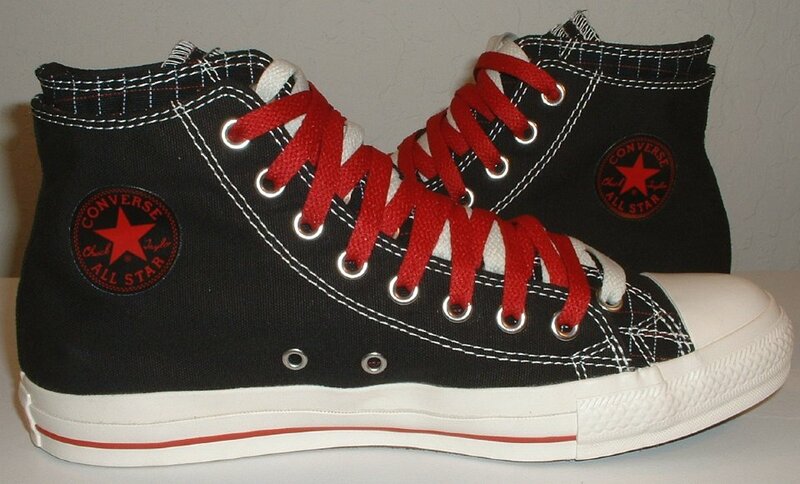 41 Double Upper High Top Chucks Inside patch views of black, red, and milk double upper high tops. 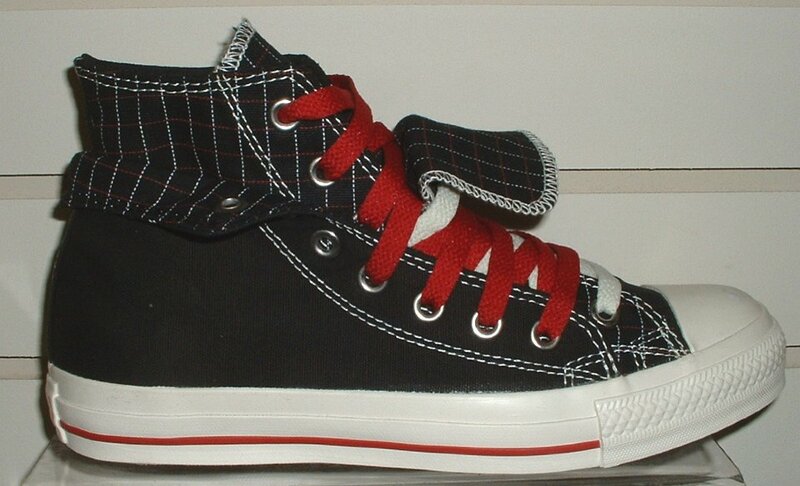 42 Double Upper High Top Chucks Angled side view of black, red, and milk double upper high tops. 43 Double Upper High Top Chucks Rear view of black, red, and milk double upper high tops. 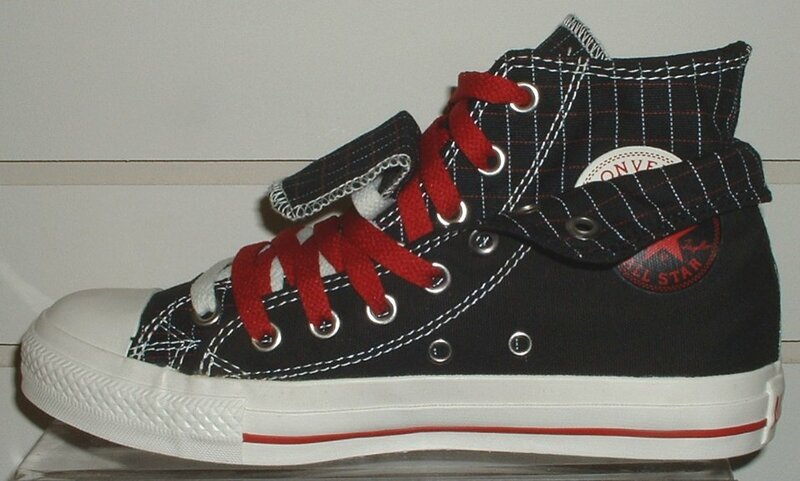 44 Double Upper High Top Chucks Inside patch and sole views of black, red, and milk double upper high tops. 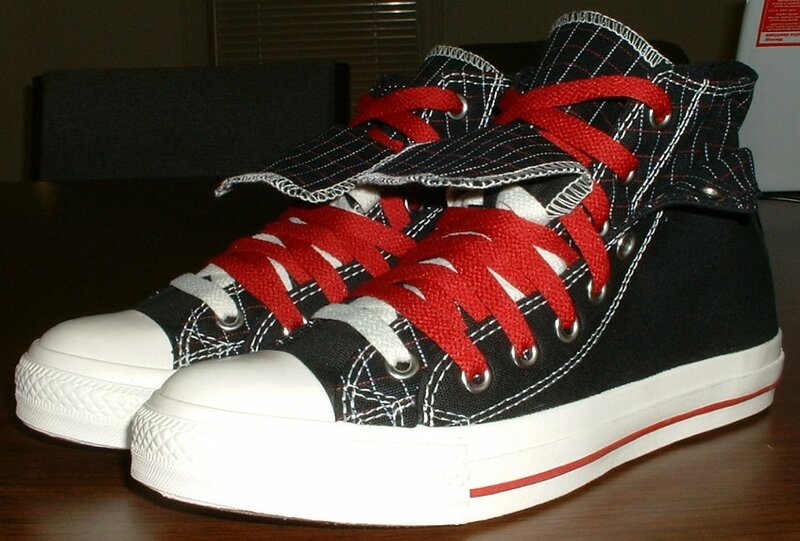 45 Double Upper High Top Chucks Wearing black, red, and milk double upper high tops, with the outer uppers rolled down, front view. 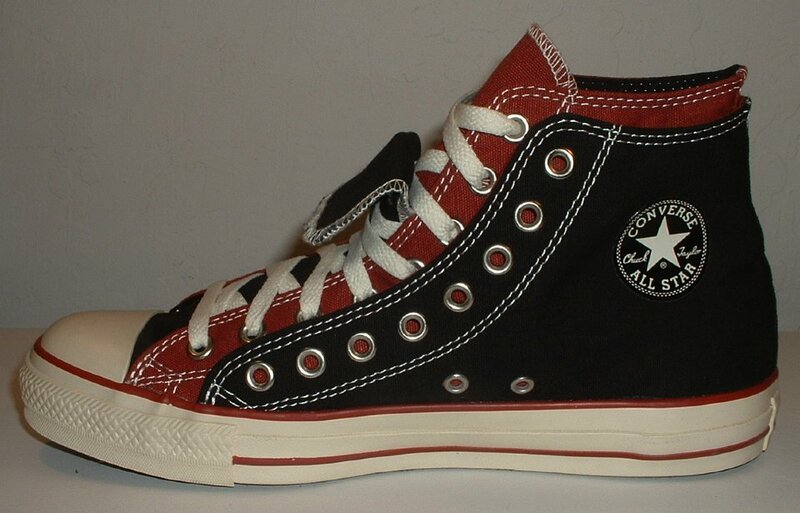 46 Double Upper High Top Chucks Wearing black, red, and milk double upper high tops, with the outer uppers rolled down, side view. 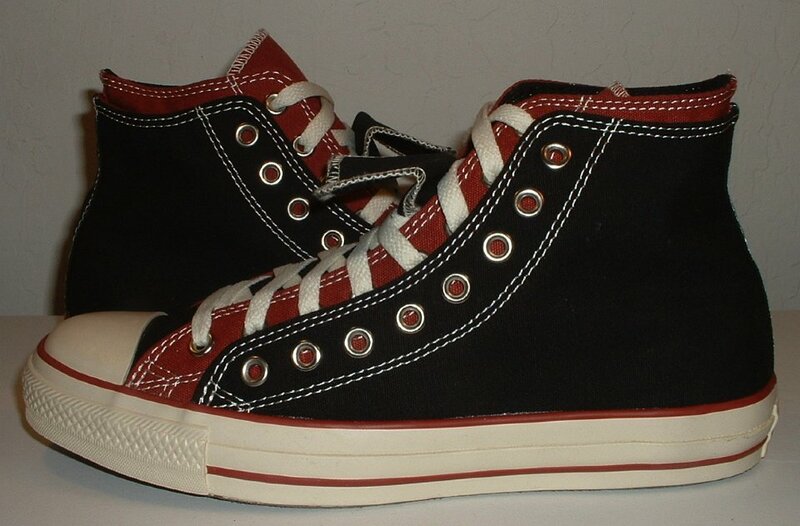 47 Double Upper High Top Chucks Wearing black, red, and milk double upper high tops, with the outer uppers rolled down, side view. 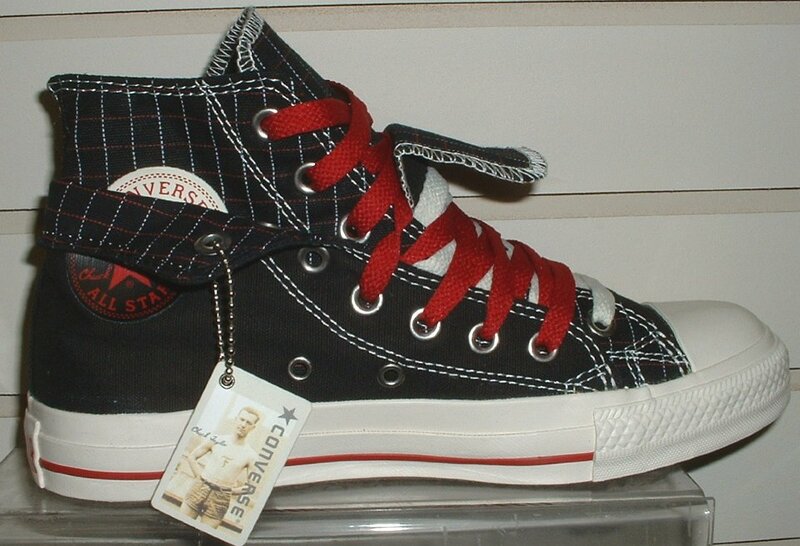 48 Double Upper High Top Chucks Wearing black, red, and milk double upper high tops, with the outer uppers rolled down, rear view. 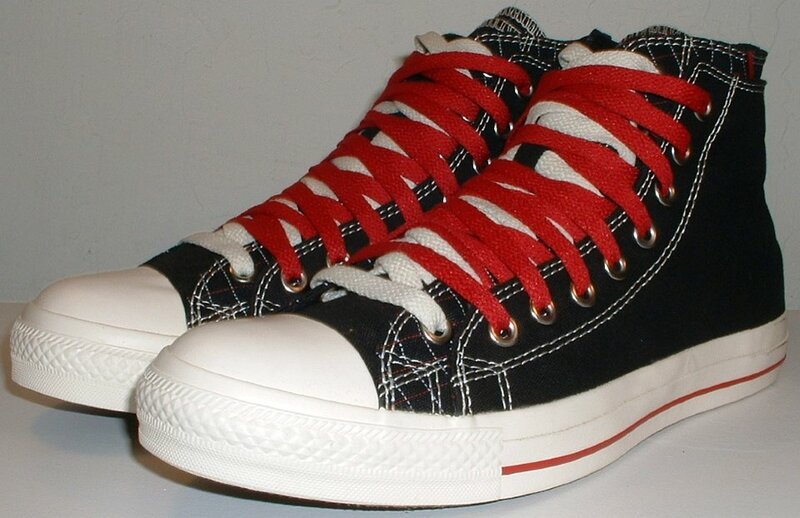 49 Double Upper High Top Chucks Wearing black, red, and milk double upper high tops, with the outer uppers rolled down, front view. 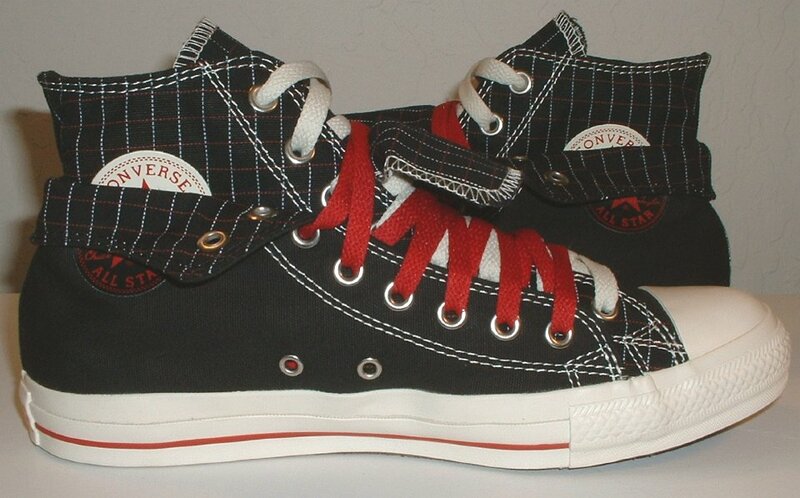 50 Double Upper High Top Chucks Wearing black, red, and milk double upper high tops, with the outer uppers rolled down, rear view. 51 Double Upper High Top Chucks Inside patch view of a right black, red, and milk double upper high top. 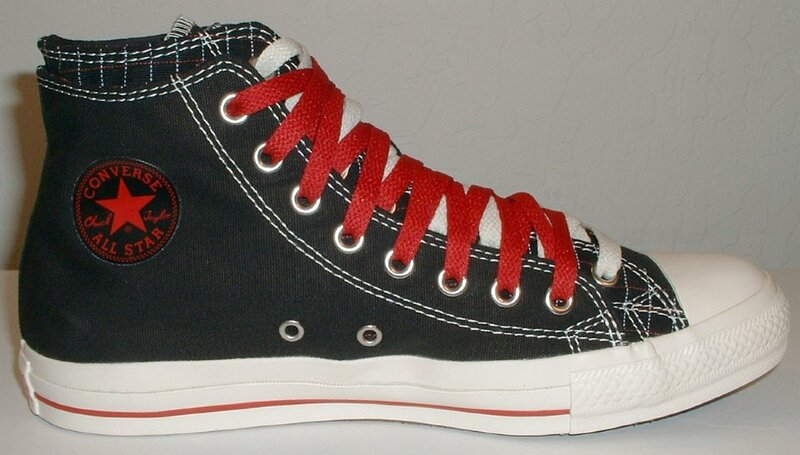 52 Double Upper High Top Chucks Outside view of a right black, red, and white double upper high top. 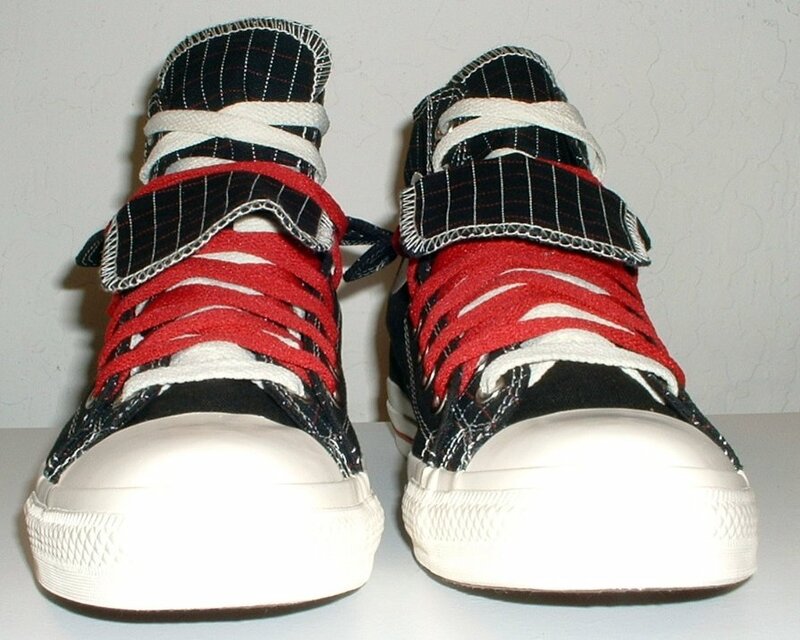 53 Double Upper High Top Chucks Outside view of a left black, red, and white double upper high top. 54 Double Upper High Top Chucks Inside patch view of a left black, red, and milk double upper high top. 55 Double Upper High Top Chucks Rear view of black, red, and milk double upper high tops. 56 Double Upper High Top Chucks Front view of black, red, and milk double upper high tops. 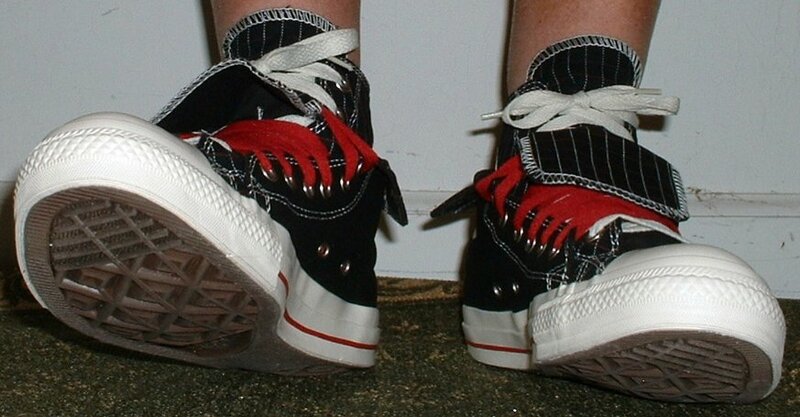 58 Double Upper High Top Chucks Angled front views of black, red, and milk double upper high tops. 59 Double Upper High Top Chucks Top view of black, red, and milk double upper high tops. 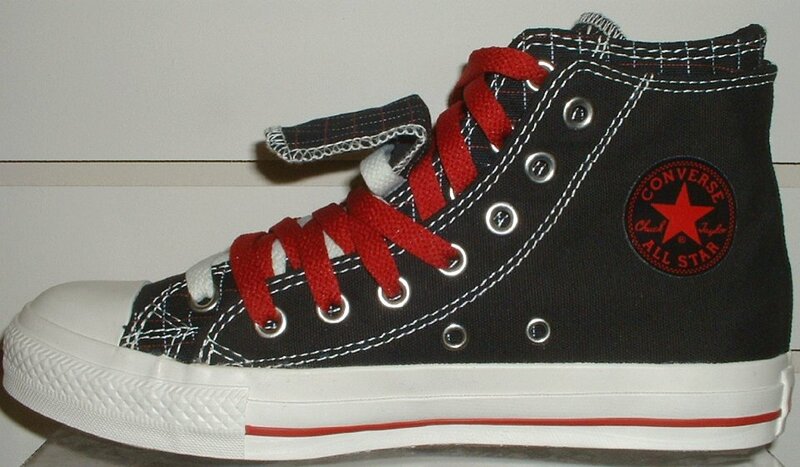 60 Double Upper High Top Chucks Inside patch and sole views of black, red, and milk double upper high tops. 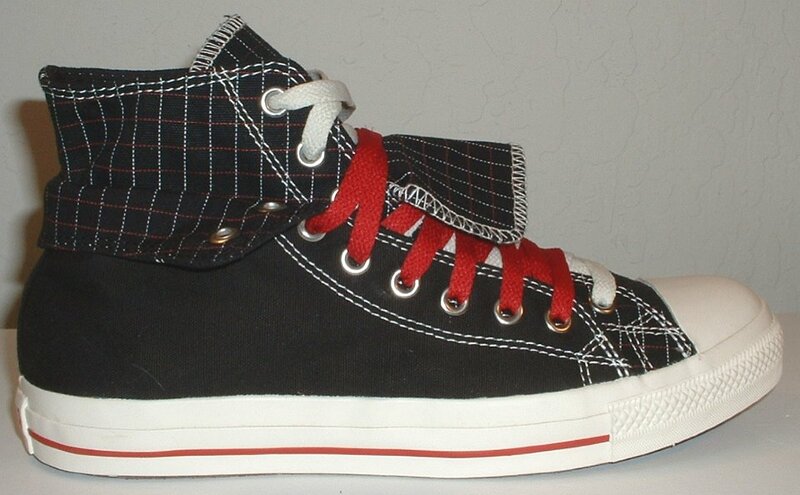 61 Double Upper High Top Chucks Inside patch views of black, red, and milk double upper high tops. 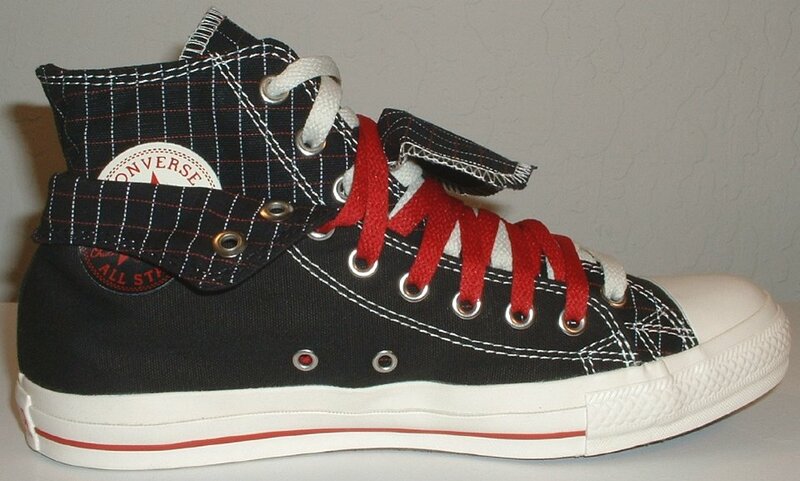 62 Double Upper High Top Chucks Outside view of a right black, red, and white double upper high top, with the outer upper rolled down. 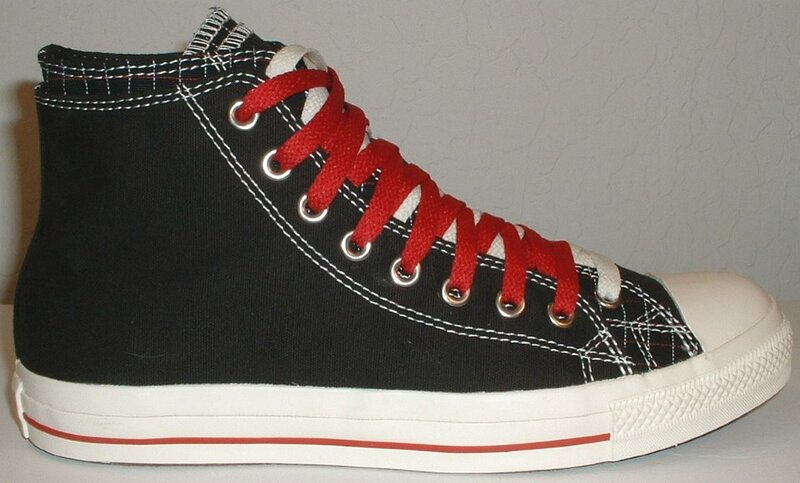 63 Double Upper High Top Chucks Inside patch view of a right black, red, and milk double upper high top, with the outer upper rolled down. 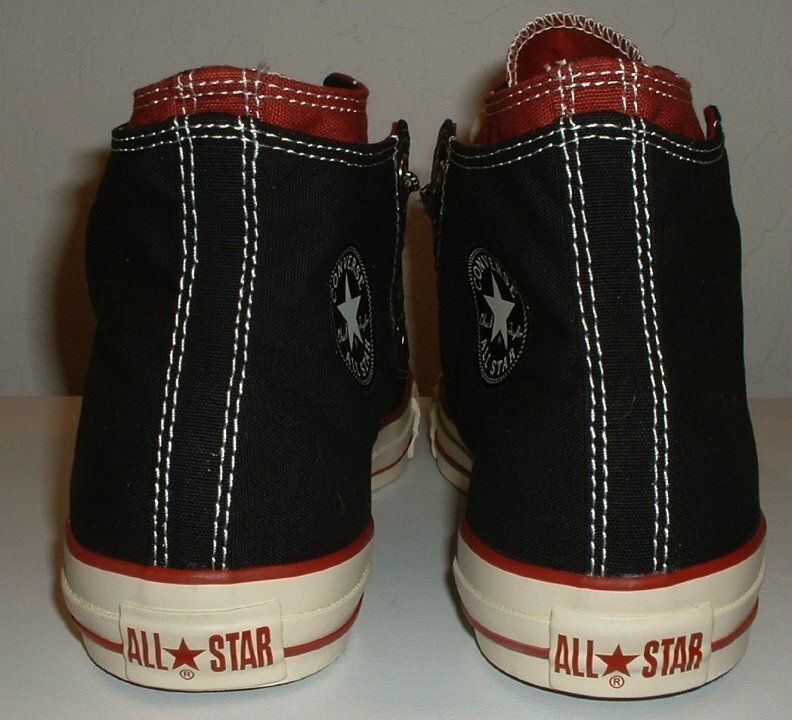 64 Double Upper High Top Chucks Inside patch view of a left black, red, and milk double upper high top, with the outer upper rolled down. 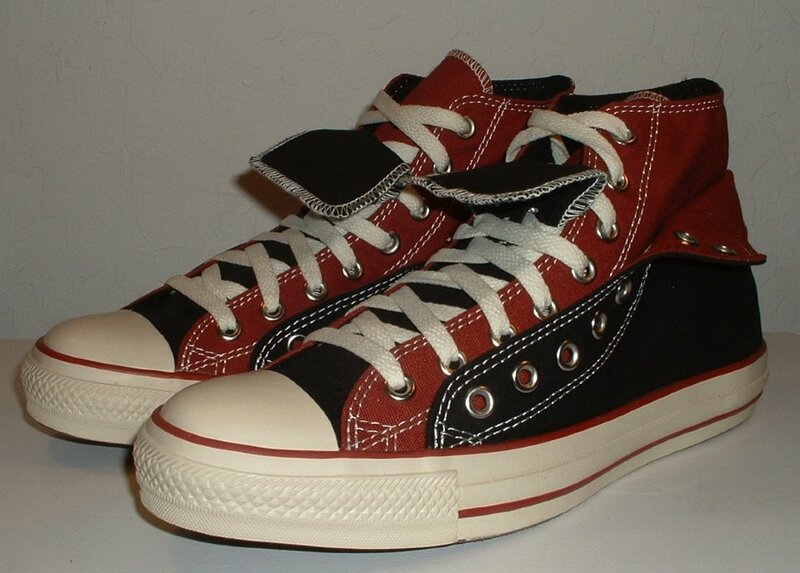 65 Double Upper High Top Chucks Outside view of a left black, red, and white double upper high top, with the outer upper rolled down. 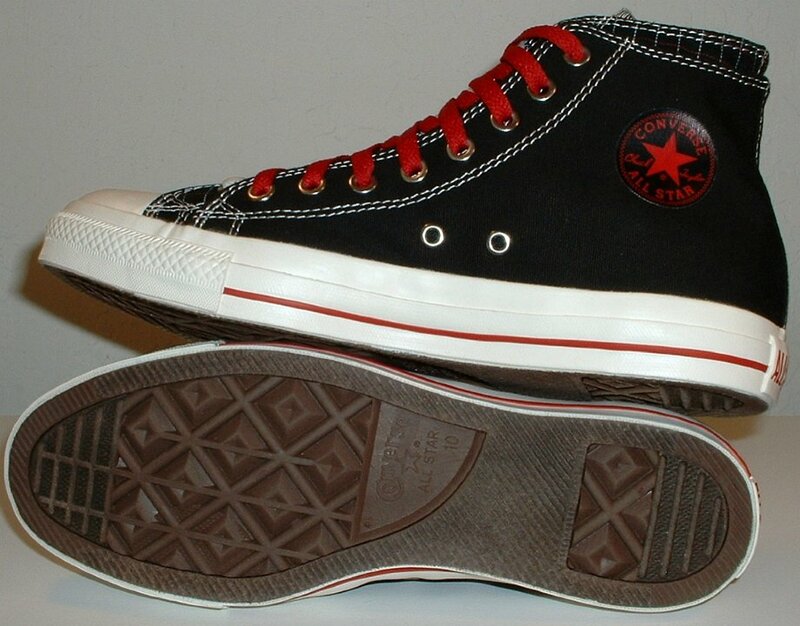 66 Double Upper High Top Chucks Rear view of black, red, and milk double upper high tops, with the outer upper rolled down. 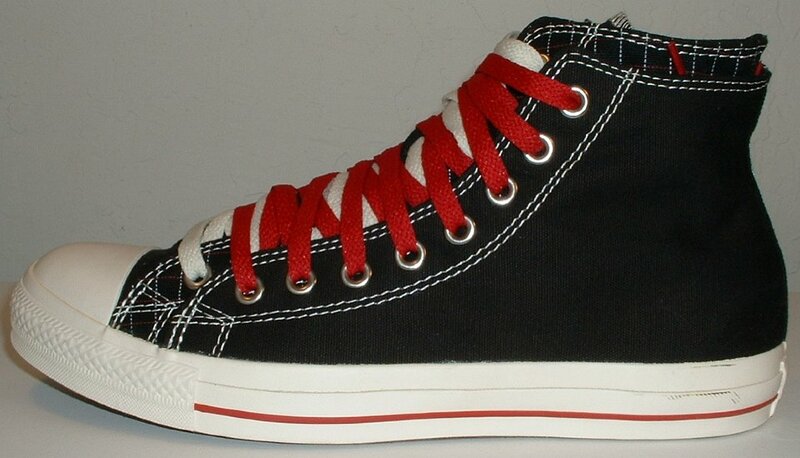 67 Double Upper High Top Chucks Front view of black, red, and milk double upper high tops, with the outer upper rolled down. 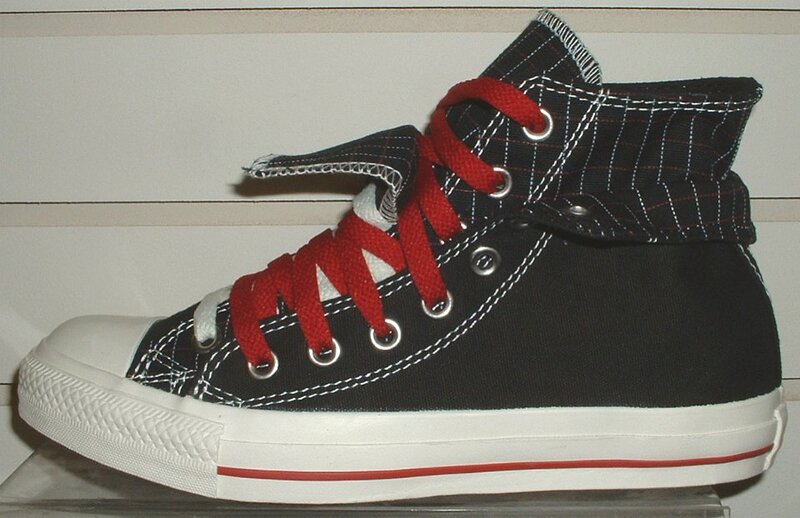 68 Double Upper High Top Chucks Angled side view of black, red, and milk double upper high tops, with the outer upper rolled down. 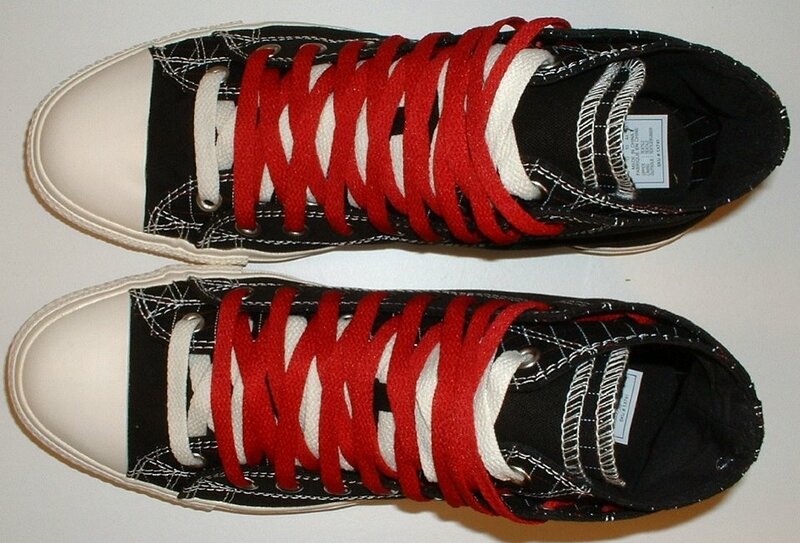 69 Double Upper High Top Chucks Top view of black, red, and milk double upper high tops, with the outer upper rolled down. 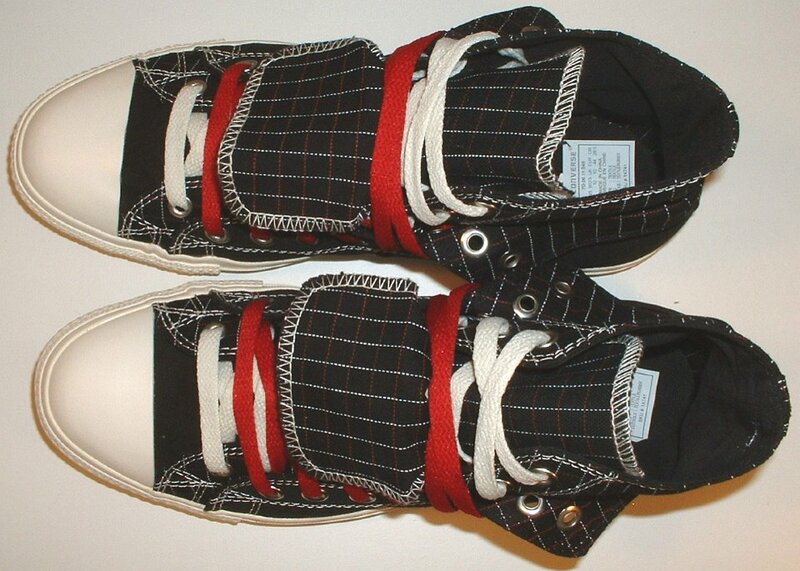 70 Double Upper High Top Chucks Inside patch views of black, red, and milk double upper high tops, with the outer uppers rolled down. 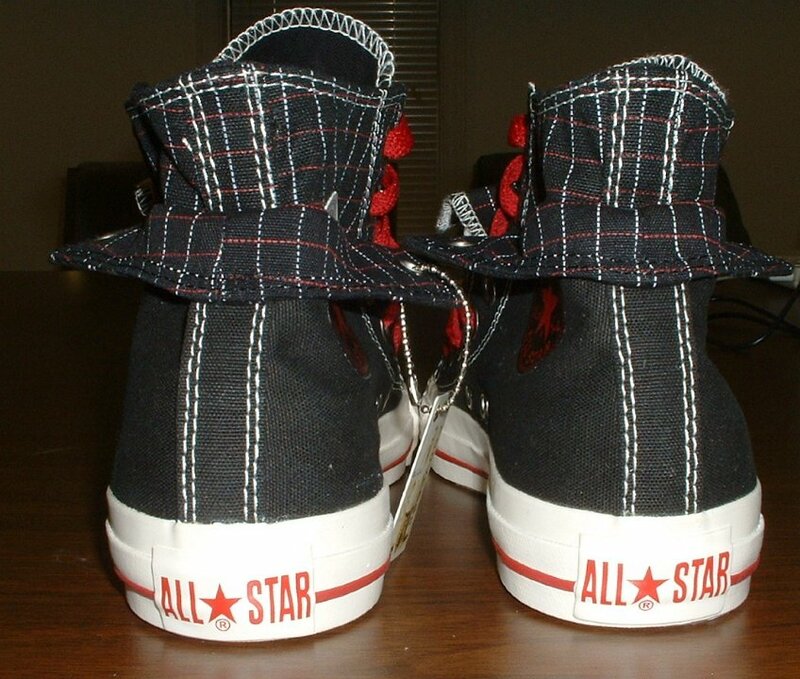 71 Double Upper High Top Chucks Angled front views of black, red, and milk double upper high tops, with the outer uppers rolled down. 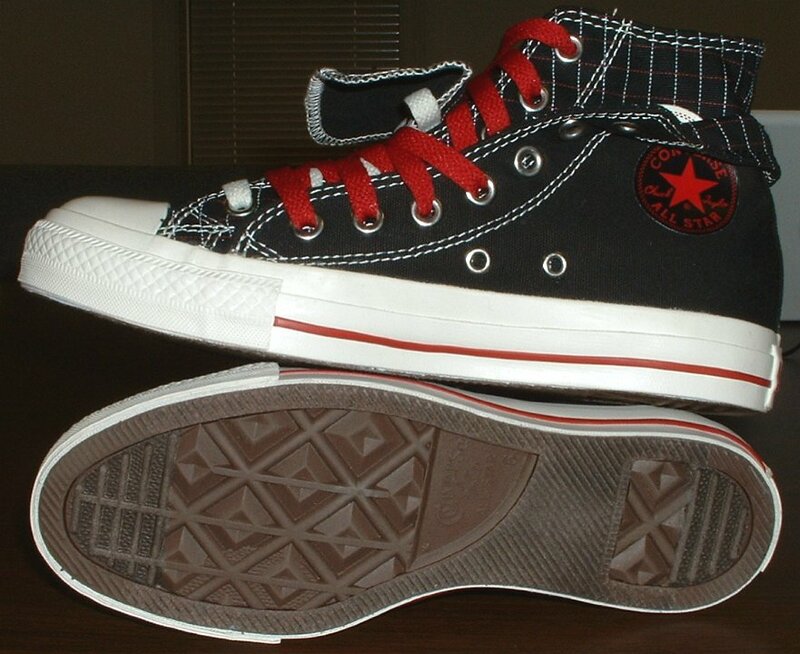 72 Double Upper High Top Chucks Inside patch and sole views of black, red, and milk double upper high tops, with the outer uppers rolled down. 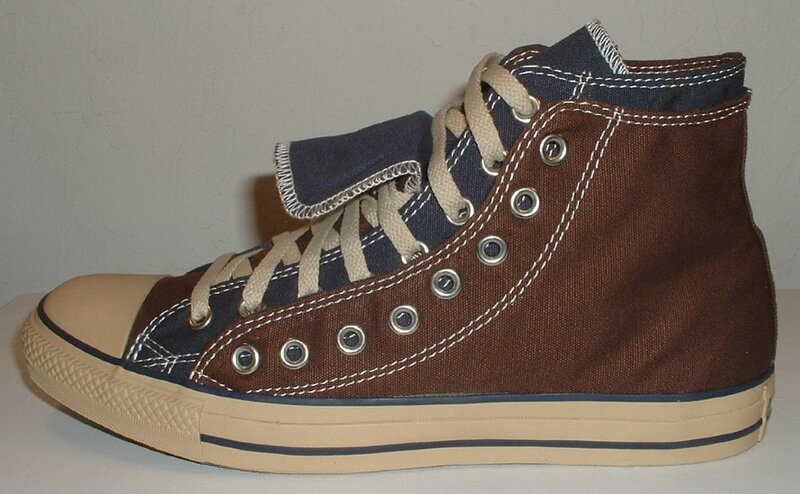 73 Double Upper High Top Chucks Inside patch view of a right brown and navy blue double upper high top. 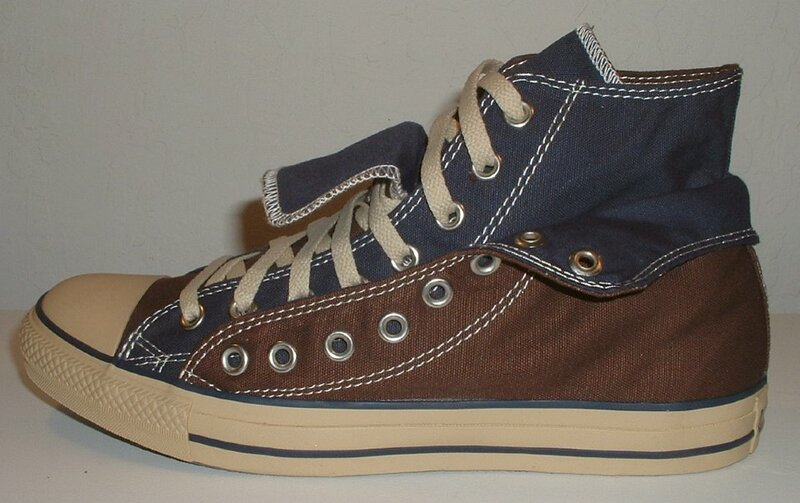 75 Double Upper High Top Chucks Inside patch view of a left brown and navy blue double upper high top. 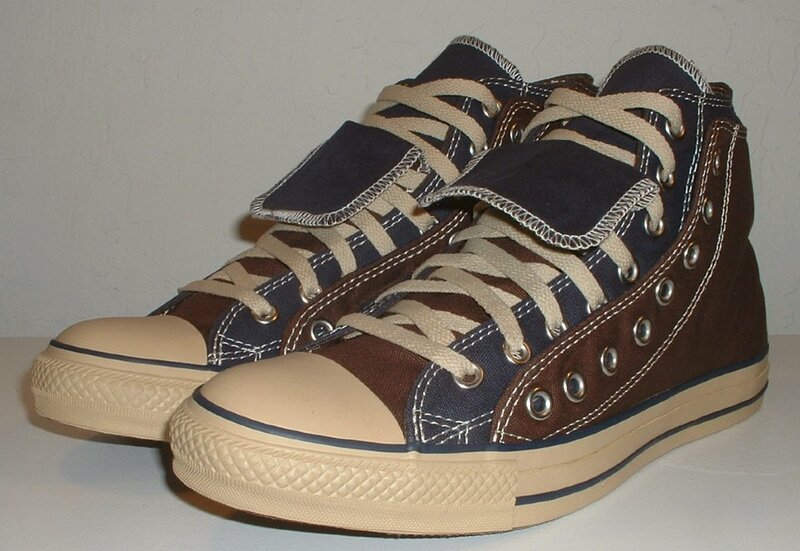 76 Double Upper High Top Chucks Outside view of a left brown and navy blue double upper high top. 77 Double Upper High Top Chucks Rear view of brown and navy blue double upper high tops. 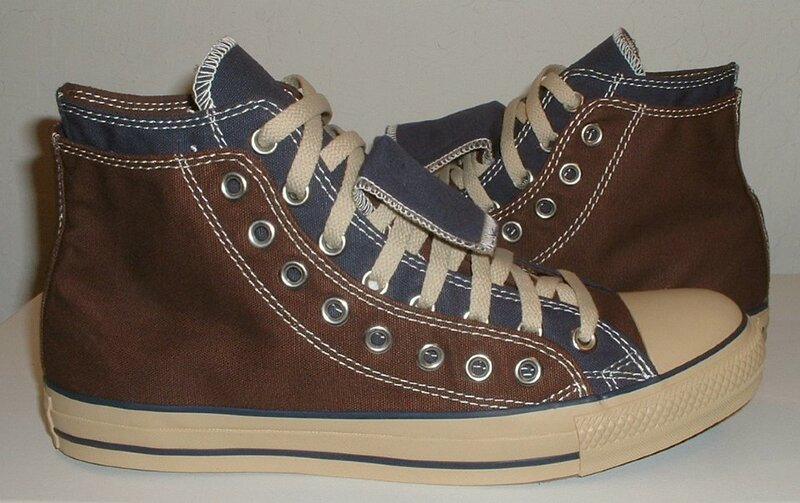 78 Double Upper High Top Chucks Angled side view of brown and navy blue double upper high tops. 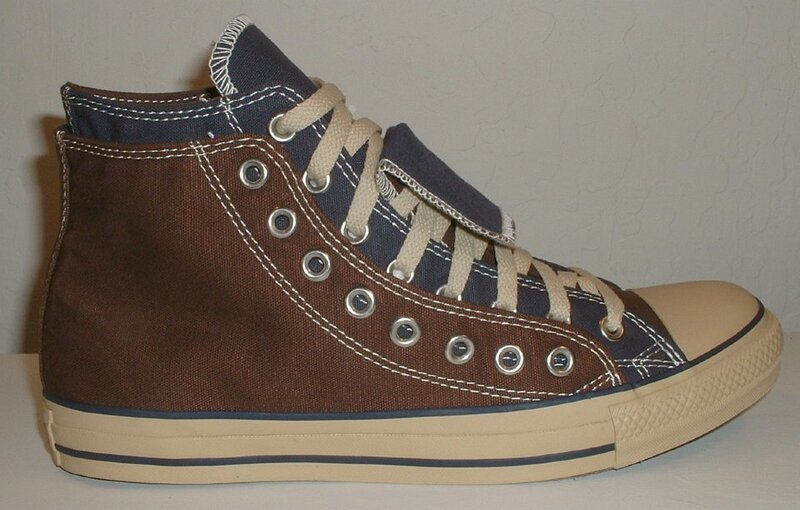 79 Double Upper High Top Chucks Angled front view of brown and navy blue double upper high tops. 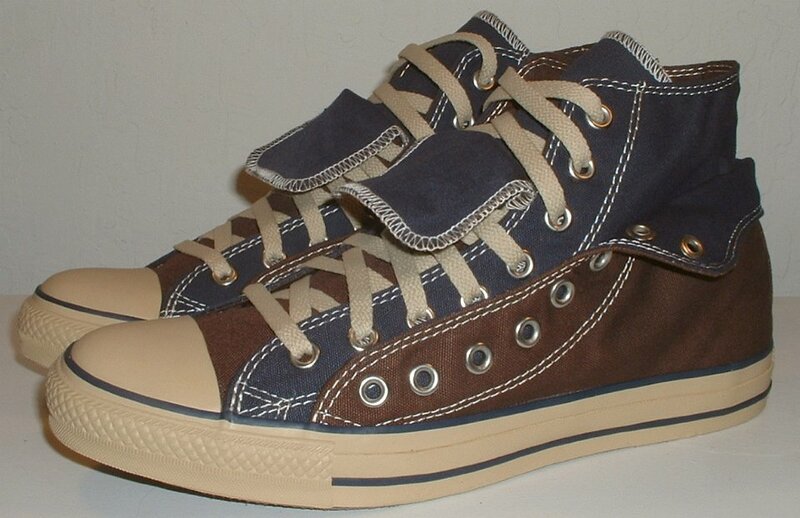 80 Double Upper High Top Chucks Front view of brown and navy blue double upper high tops. 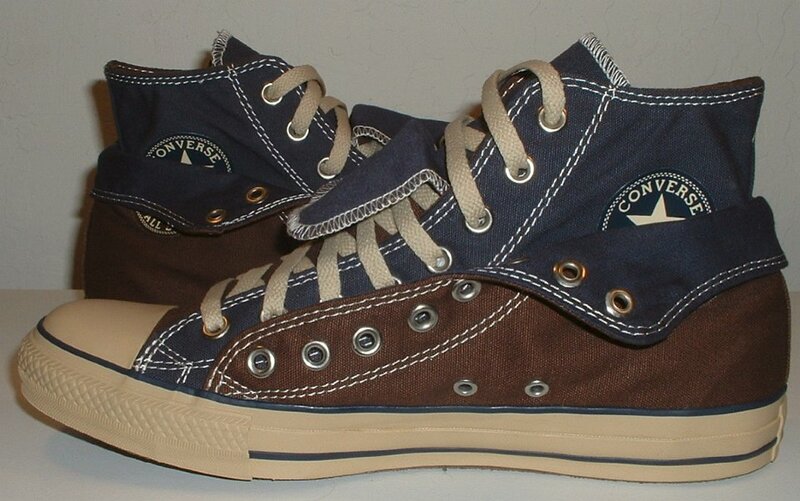 81 Double Upper High Top Chucks Top view of brown and navy blue double upper high tops. 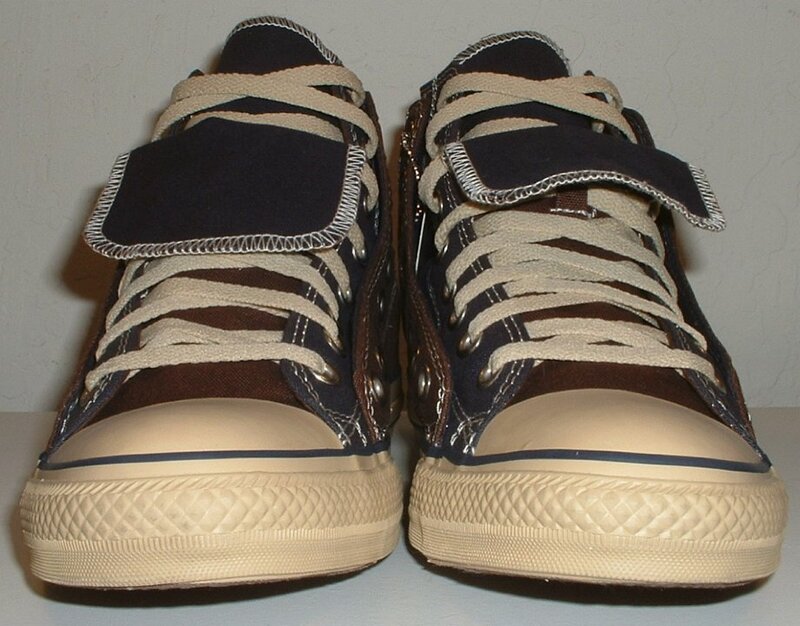 82 Double Upper High Top Chucks Inside patch views of brown and navy blue double upper high tops. 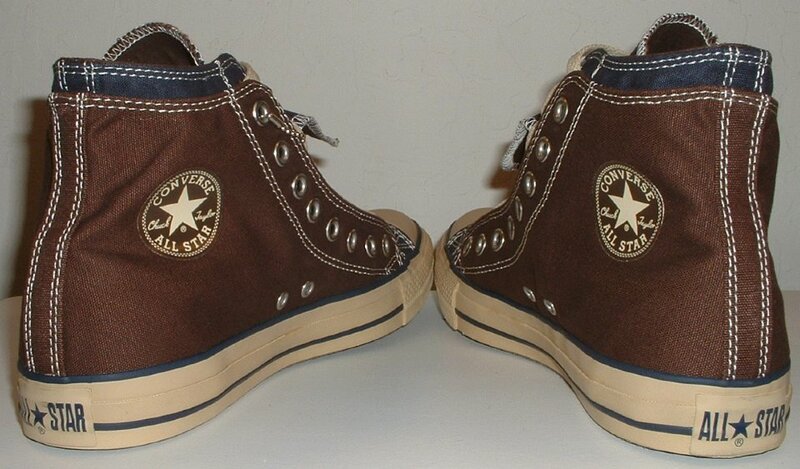 83 Double Upper High Top Chucks Outside views of brown and navy blue double upper high tops. 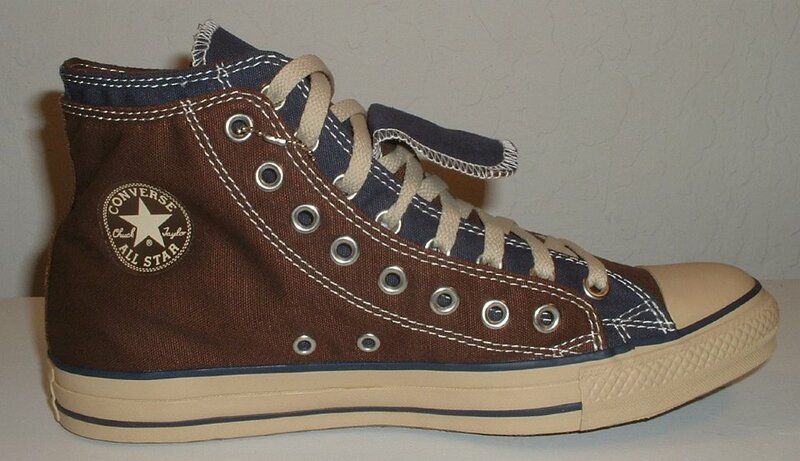 84 Double Upper High Top Chucks Inside patch and sole views of brown and navy blue double upper high tops. 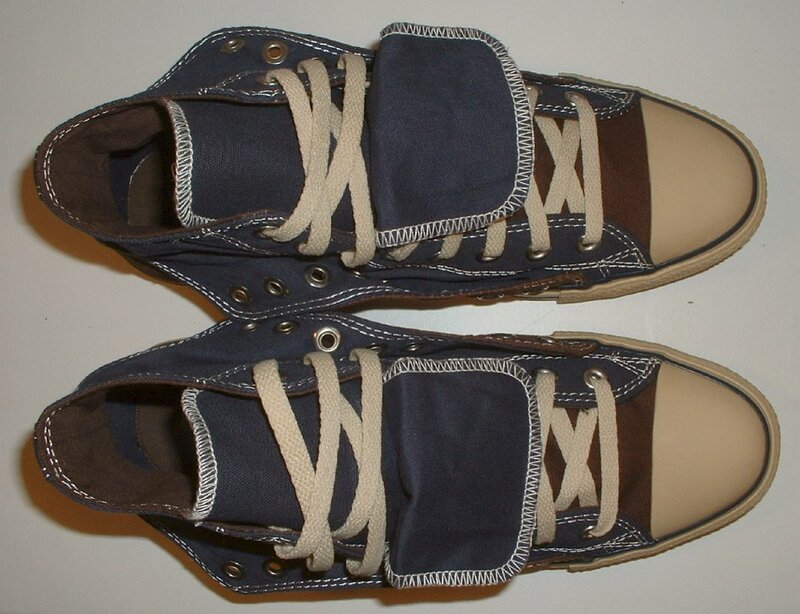 86 Double Upper High Top Chucks Inside patch view of a right folded down brown and navy blue double upper high top. 87 Double Upper High Top Chucks Outside view of a right folded down brown and navy blue double upper high top. 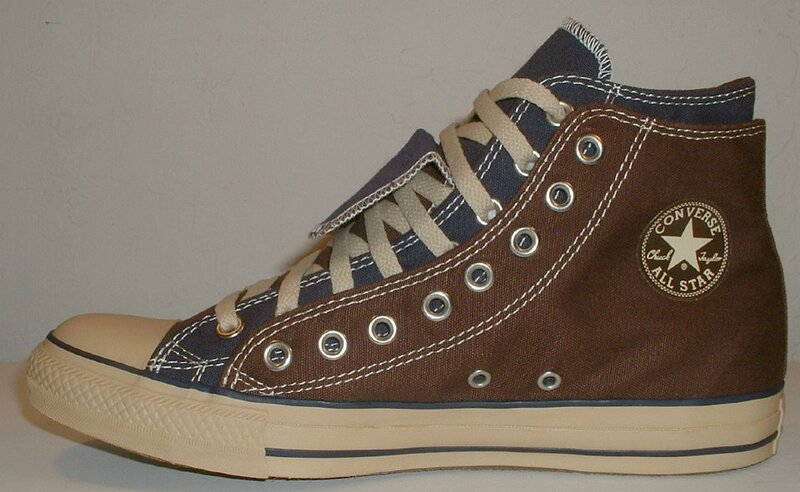 88 Double Upper High Top Chucks Inside patch view of a left folded down brown and navy blue double upper high top. 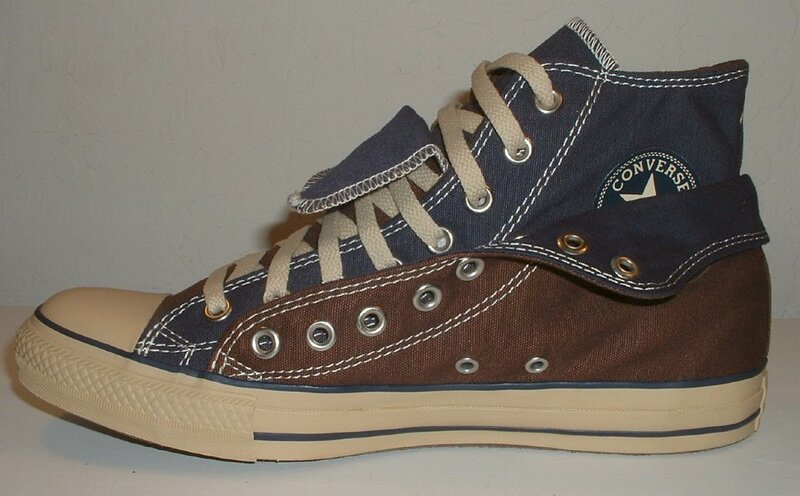 89 Double Upper High Top Chucks Outside view of a left folded down brown and navy blue double upper high top. 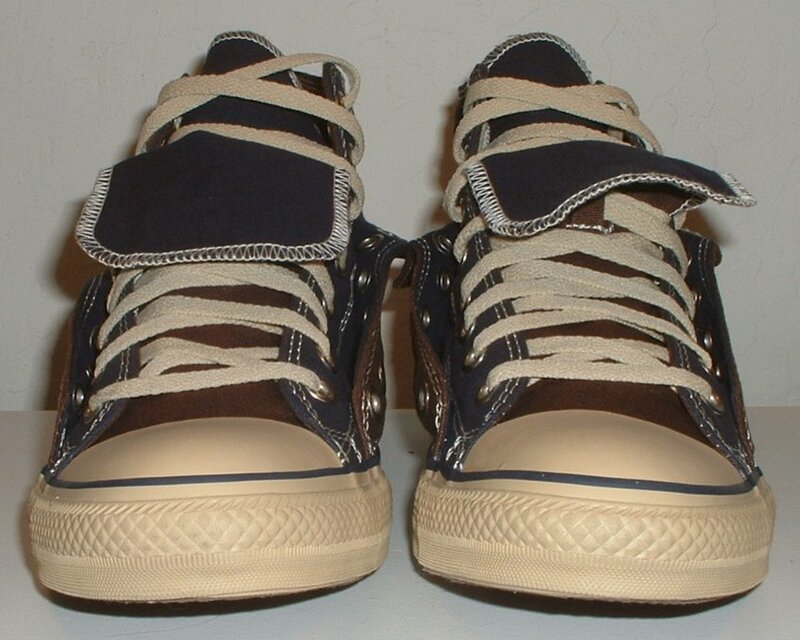 90 Double Upper High Top Chucks Rear view of folded down brown and navy blue double upper high tops. 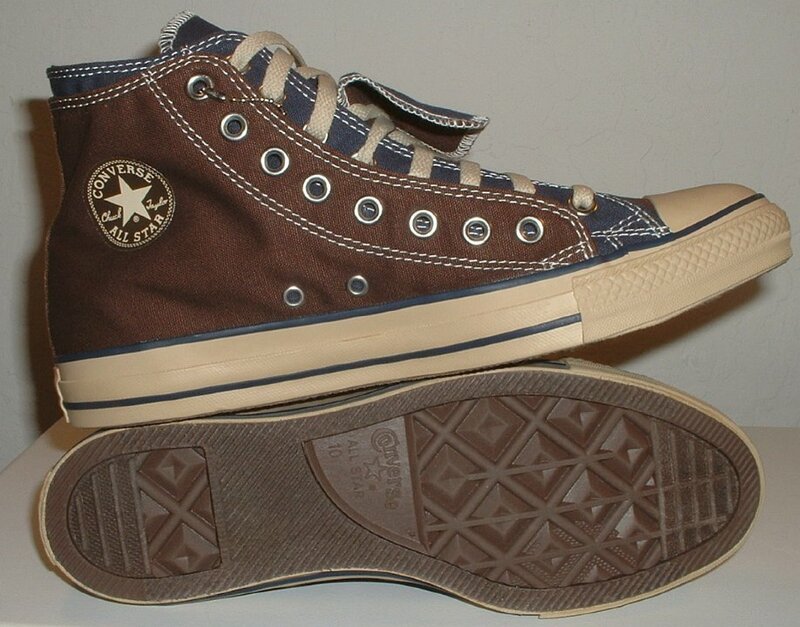 91 Double Upper High Top Chucks Angled rear view of folded down brown and navy blue double upper high tops. 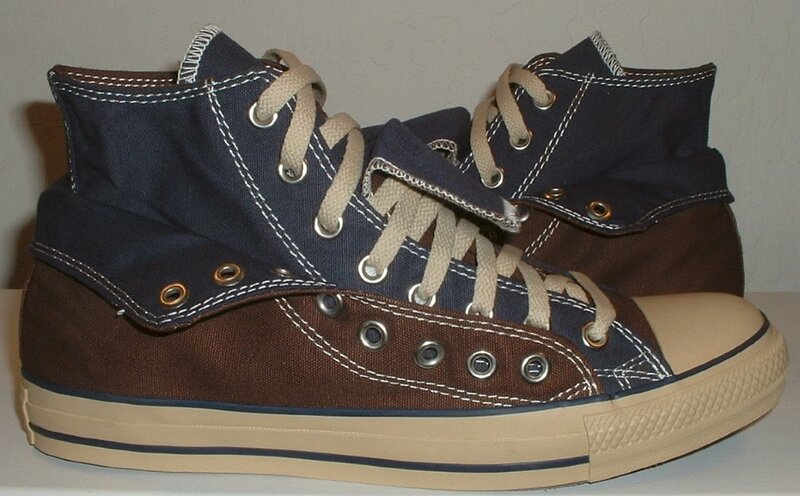 92 Double Upper High Top Chucks Front view of folded down brown and navy blue double upper high tops. 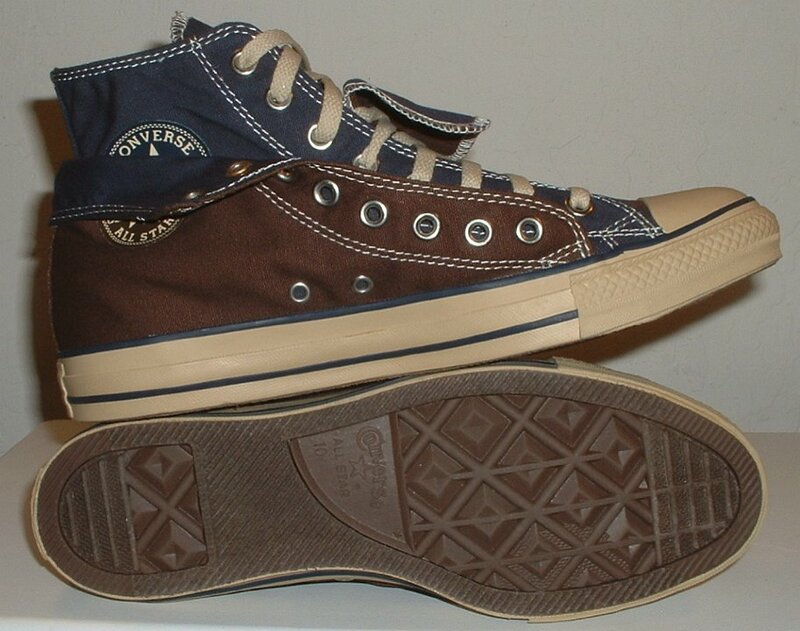 93 Double Upper High Top Chucks Angled front view of folded down brown and navy blue double upper high tops. 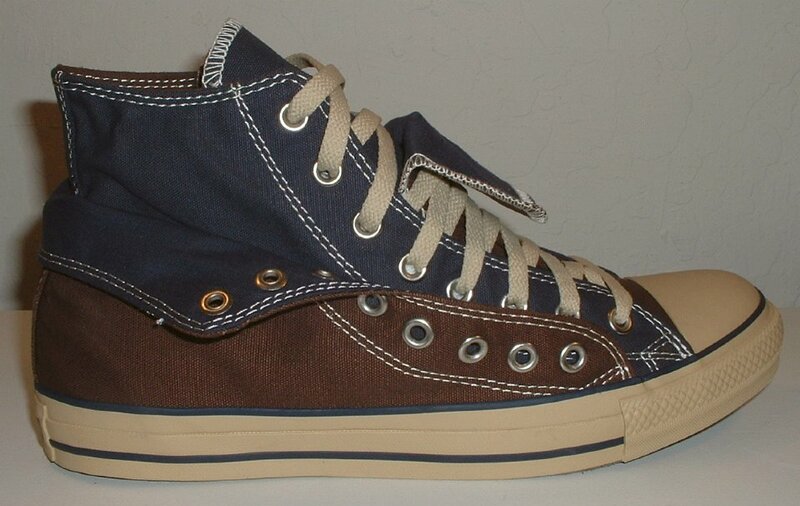 94 Double Upper High Top Chucks Angled side view of folded down brown and navy blue double upper high tops. 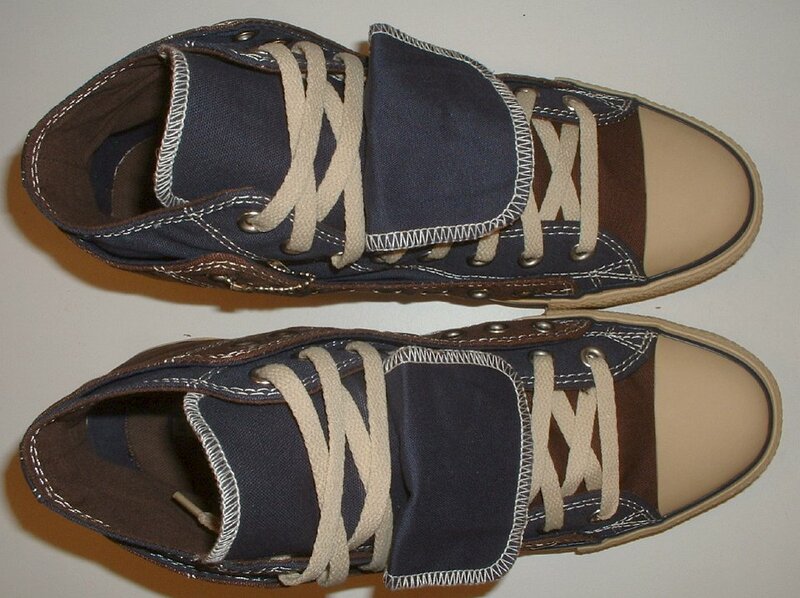 95 Double Upper High Top Chucks Top view of folded down brown and navy blue double upper high tops. 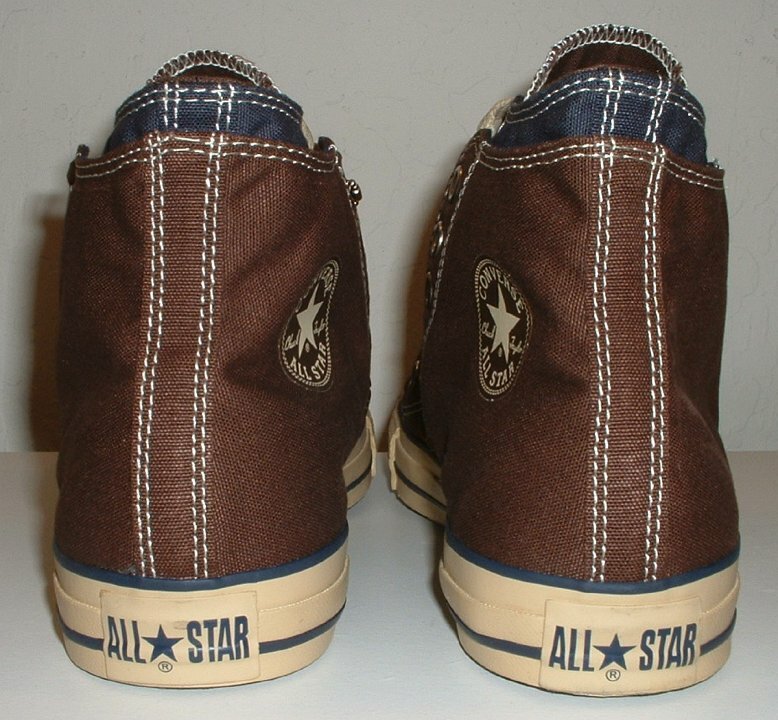 96 Double Upper High Top Chucks Inside patch views of folded down brown and navy blue double upper high tops. 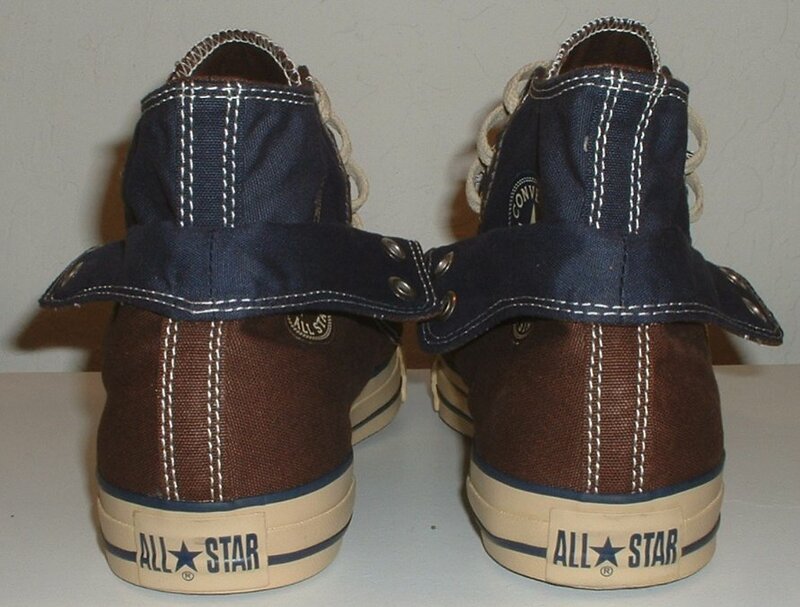 97 Double Upper High Top Chucks Outside views of folded down brown and navy blue double upper high tops. 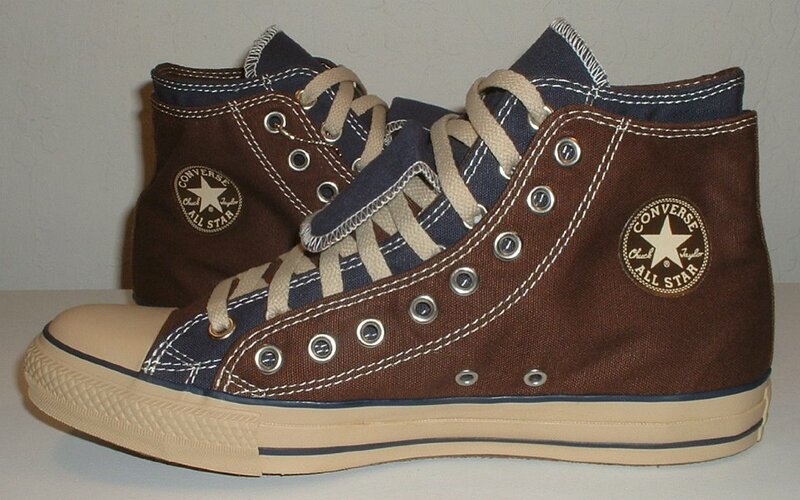 98 Double Upper High Top Chucks Inside patch and sole views of folded down brown and navy blue double upper high tops. 99 Double Upper High Top Chucks Inside patch view of a right chocolate and sienna double upper high top, with the outer upper rolled down. 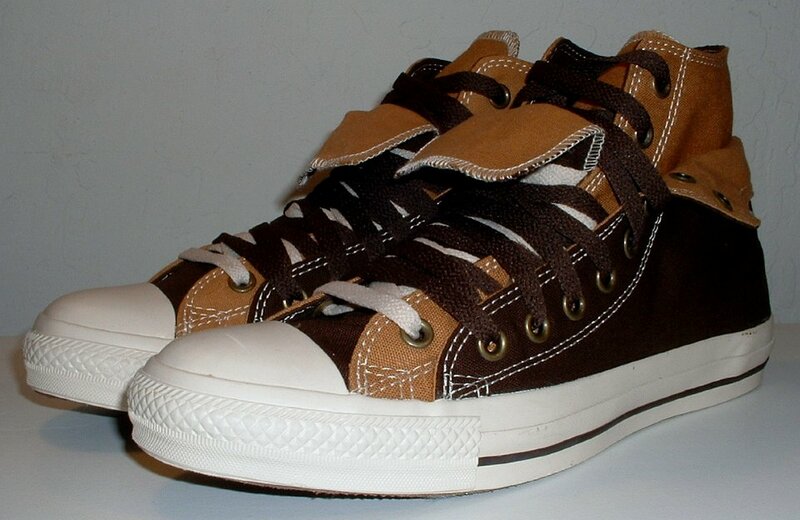 100 Double Upper High Top Chucks Outside view of a right chocolate and sienna double upper high top, with the outer upper rolled down. 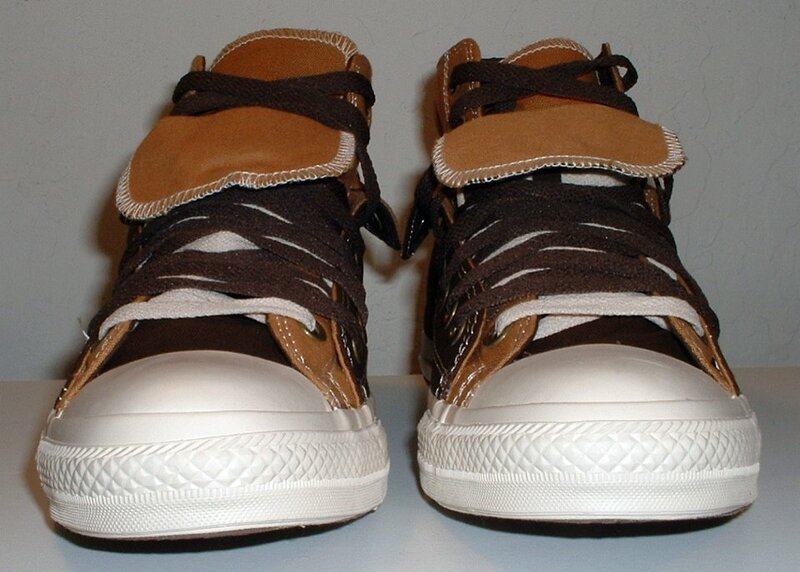 101 Double Upper High Top Chucks Inside patch view of a left chocolate and sienaa double upper high top, with the outer upper rolled down. 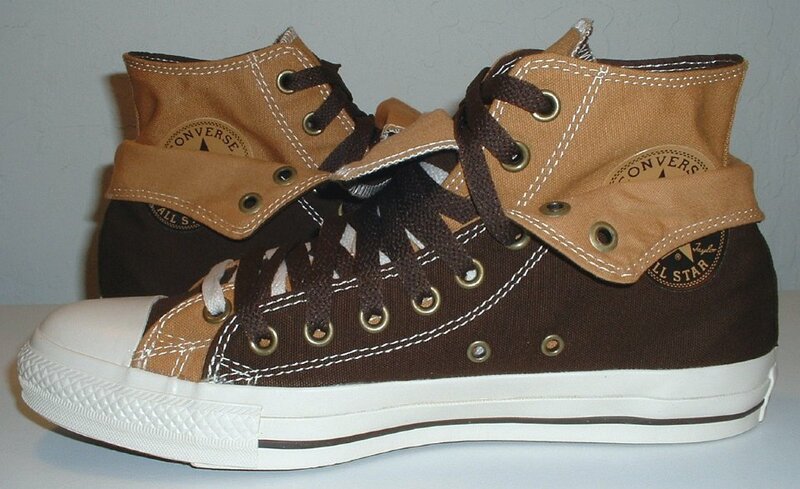 102 Double Upper High Top Chucks Outside view of a left chocolate and sienna double upper high top, with the outer upper rolled down. 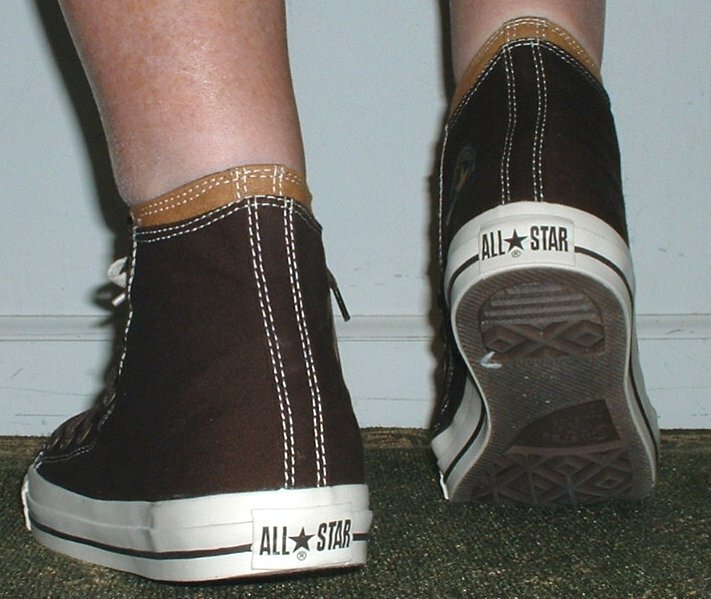 103 Double Upper High Top Chucks Rear view of chocolate and sienna double upper high tops, with the outer upper rolled down. 104 Double Upper High Top Chucks Front view of chocolate and sienna double upper high tops, with the outer upper rolled down. 105 Double Upper High Top Chucks Angled side view of chocolate and sienna double upper high tops, with the outer upper rolled down. 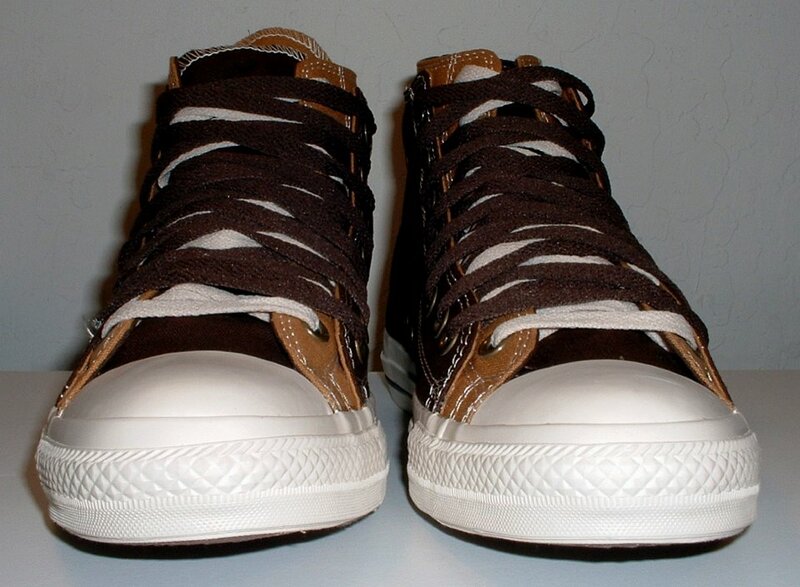 106 Double Upper High Top Chucks Top view of chocolate and sienna double upper high tops, with the outer upper rolled down. 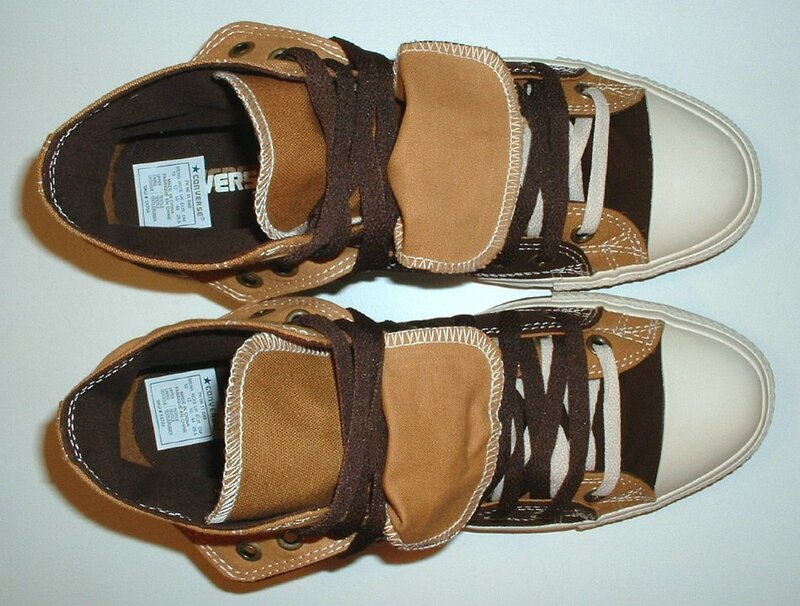 107 Double Upper High Top Chucks Inside patch views of chocolate and sienna double upper high tops, with the outer uppers rolled down. 108 Double Upper High Top Chucks Angled front views of chocolate and sienna double upper high tops, with the outer uppers rolled down. 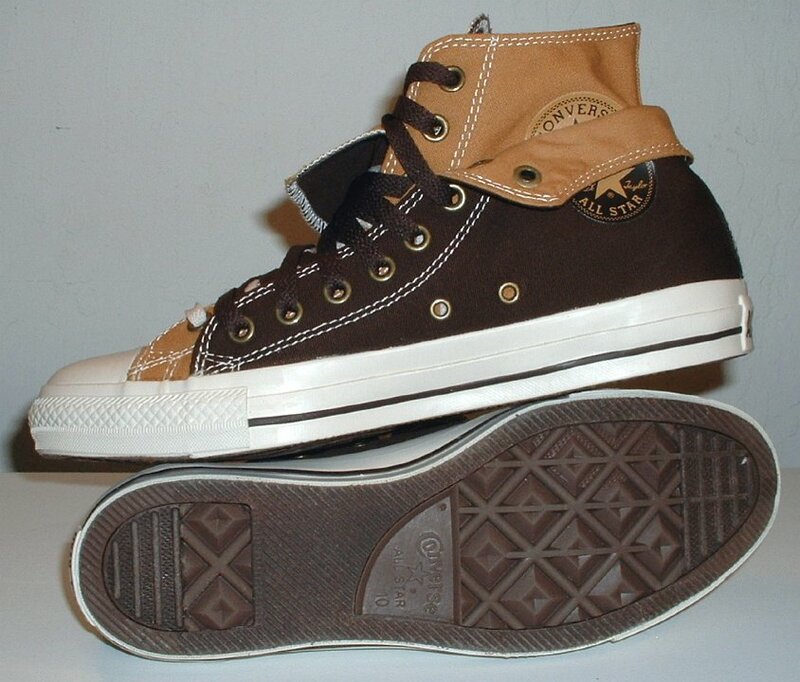 109 Double Upper High Top Chucks Inside patch and sole views of chocolate and sienna double upper high tops, with the outer uppers rolled down. 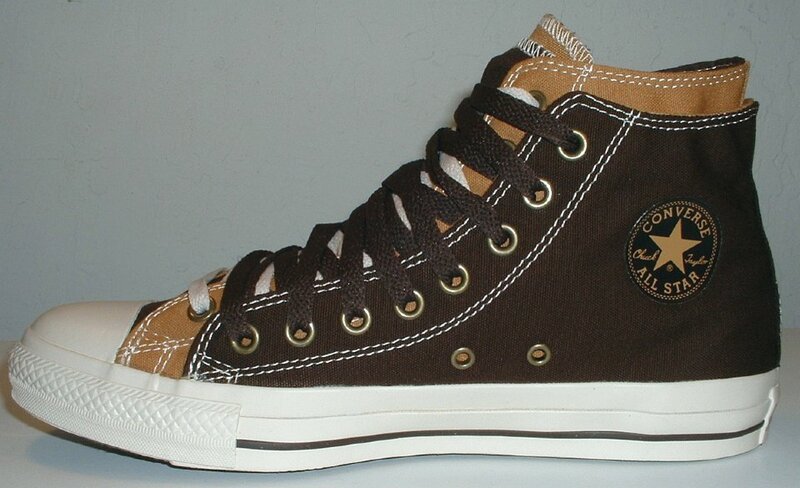 110 Double Upper High Top Chucks Inside patch view of a right chocolate and sienna double upper high top. 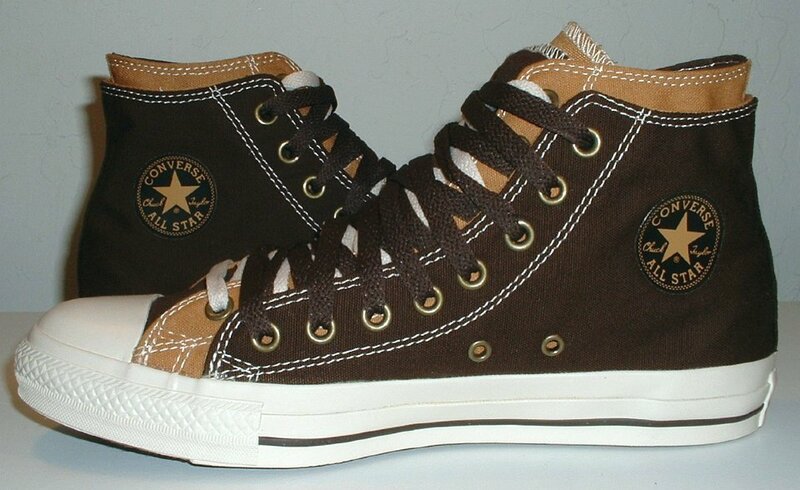 111 Double Upper High Top Chucks Outside view of a right chocolate and sienna double upper high top. 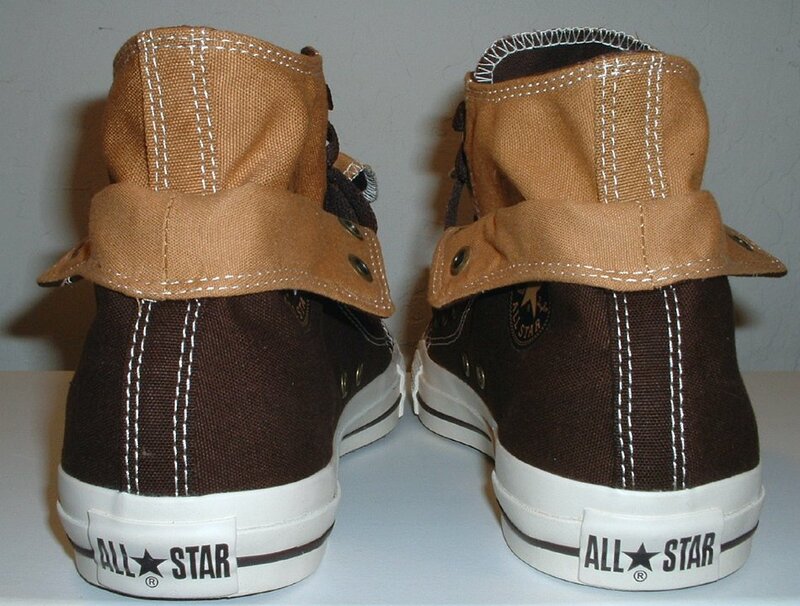 112 Double Upper High Top Chucks Inside patch view of a left chocolate and sienaa double upper high top. 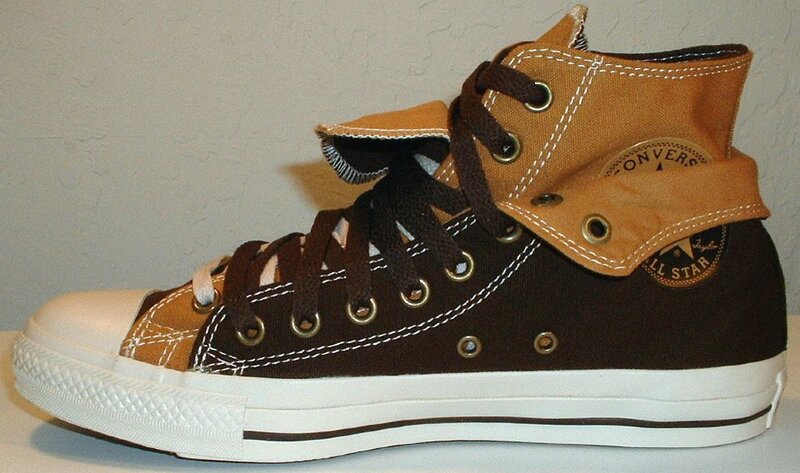 113 Double Upper High Top Chucks Outside view of a left chocolate and sienna double upper high top. 114 Double Upper High Top Chucks Rear view of chocolate and sienna double upper high tops. 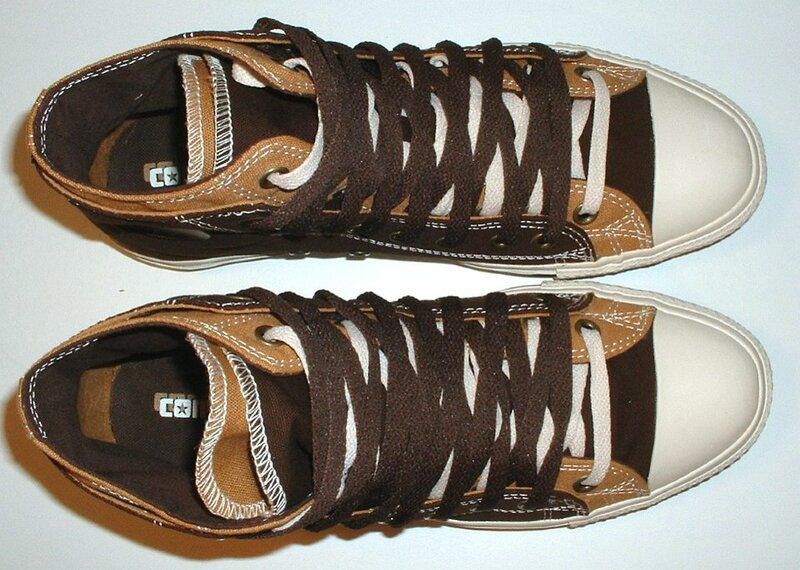 115 Double Upper High Top Chucks Angled side view of chocolate and sienna double upper high tops. 116 Double Upper High Top Chucks Front view of chocolate and sienna double upper high tops. 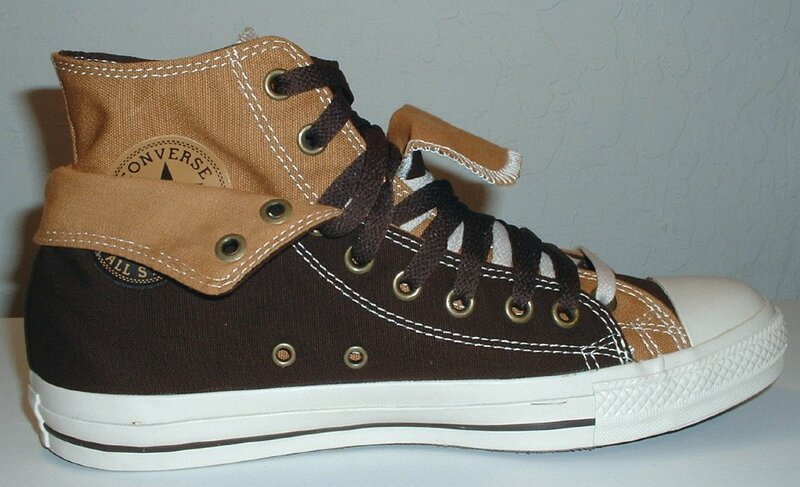 117 Double Upper High Top Chucks Angled front views of chocolate and sienna double upper high tops. 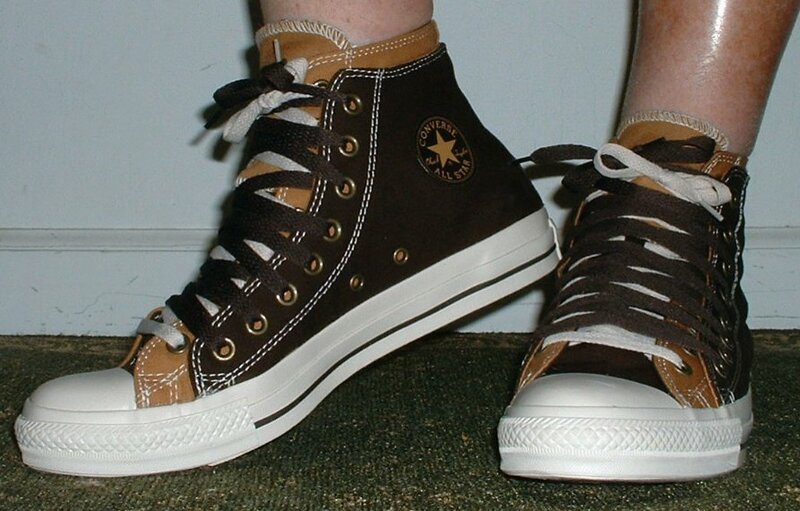 118 Double Upper High Top Chucks Top view of chocolate and sienna double upper high tops. 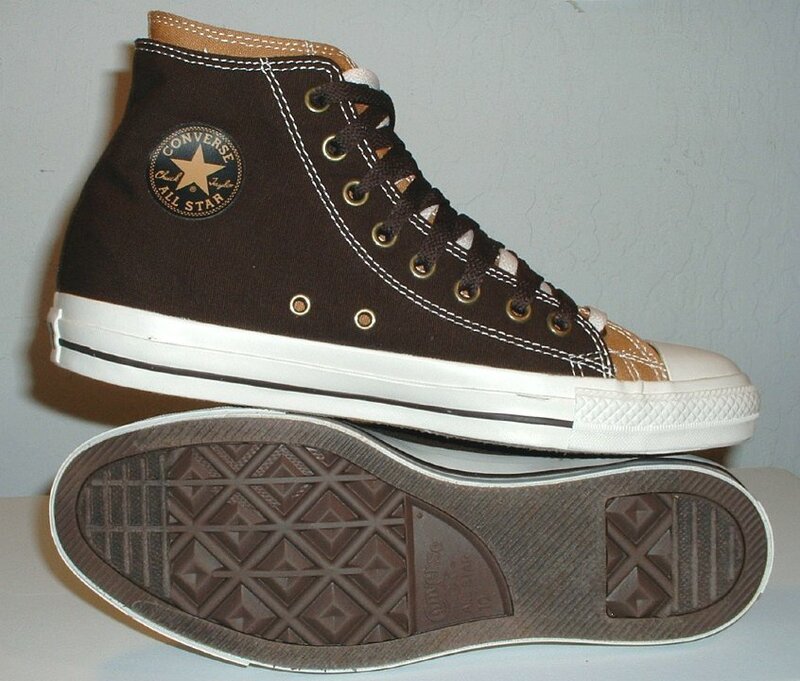 119 Double Upper High Top Chucks Inside patch views of chocolate and sienna double upper high tops. 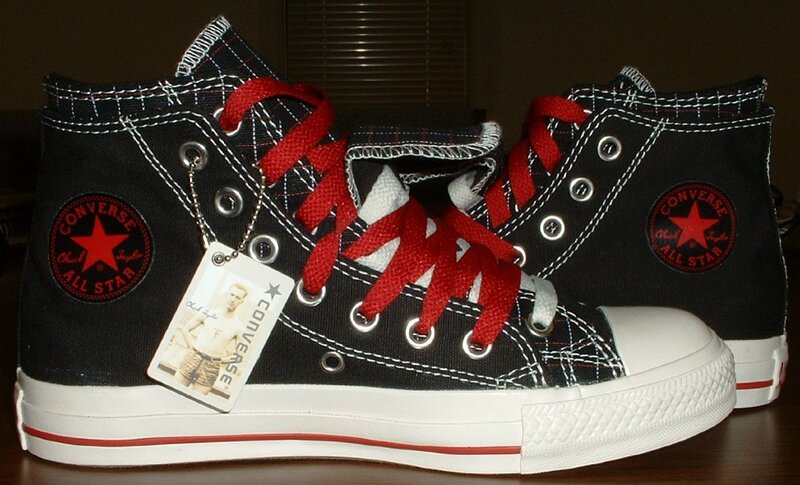 120 Double Upper High Top Chucks Inside patch and sole views of black, red, and milk double upper high tops. 121 Double Upper High Top Chucks Inner sole closeup view of a chocolate and sienna double upper high top. 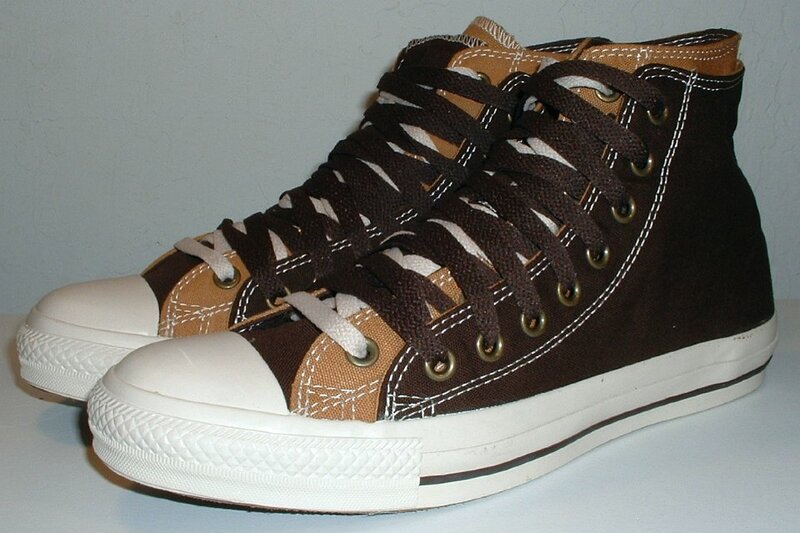 122 Double Upper High Top Chucks Wearing chocolate and sienna double upper high tops, front view. 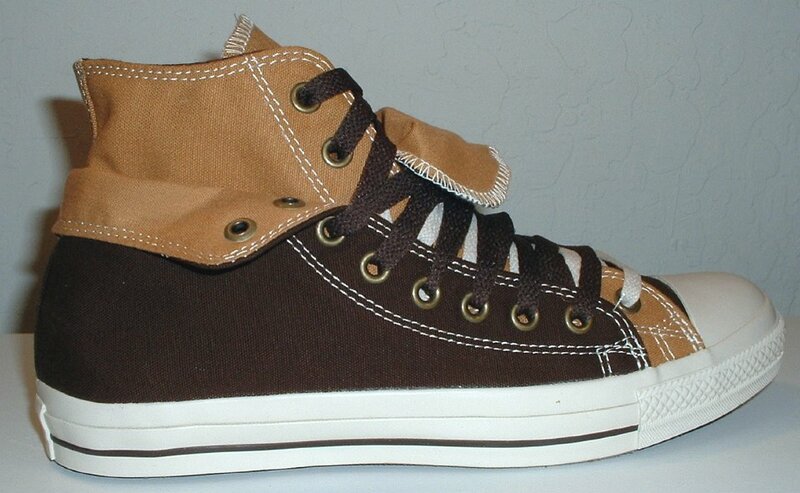 123 Double Upper High Top Chucks Wearing chocolate and sienna double upper high tops, side view. 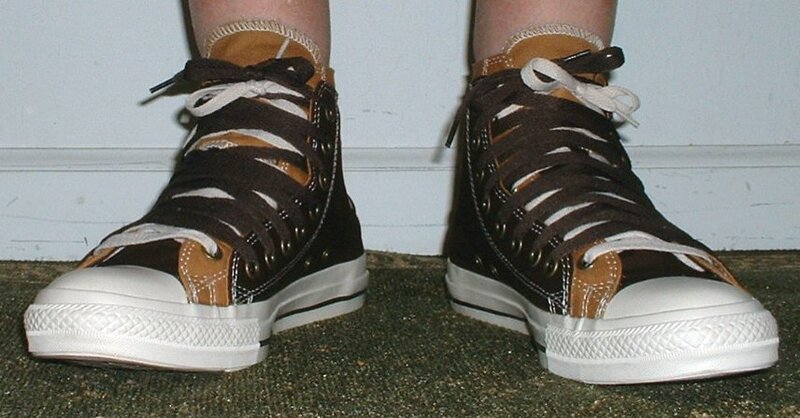 124 Double Upper High Top Chucks Wearing chocolate and sienna double upper high tops, front view. 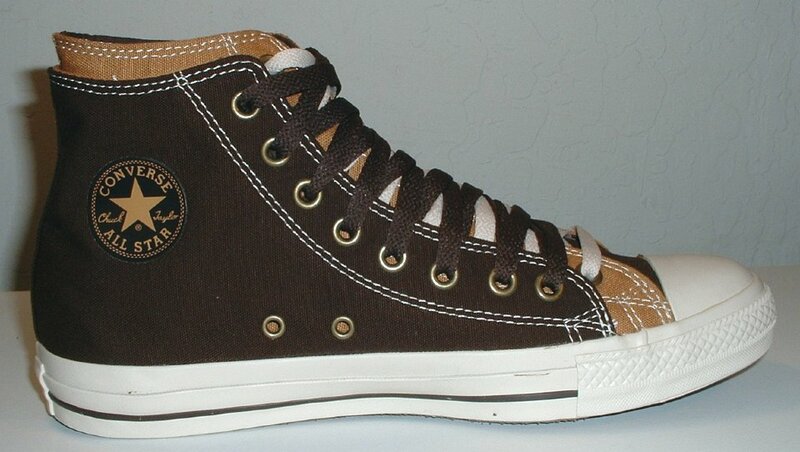 125 Double Upper High Top Chucks Wearing chocolate and sienna double upper high tops, front view. 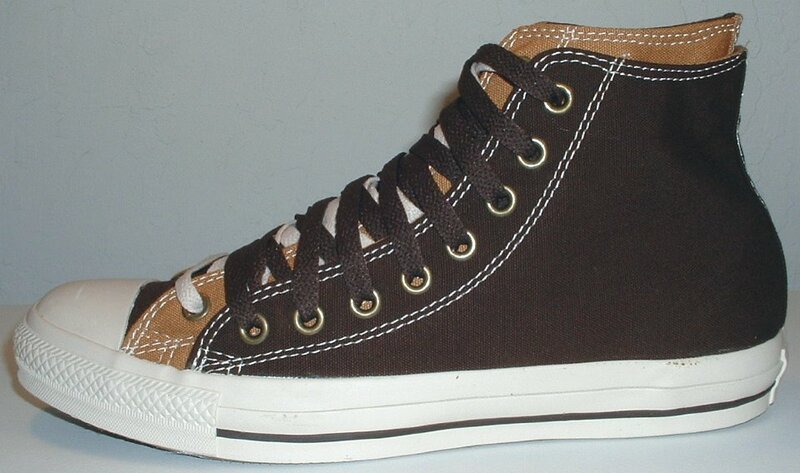 126 Double Upper High Top Chucks Wearing chocolate and sienna double upper high tops, side view. 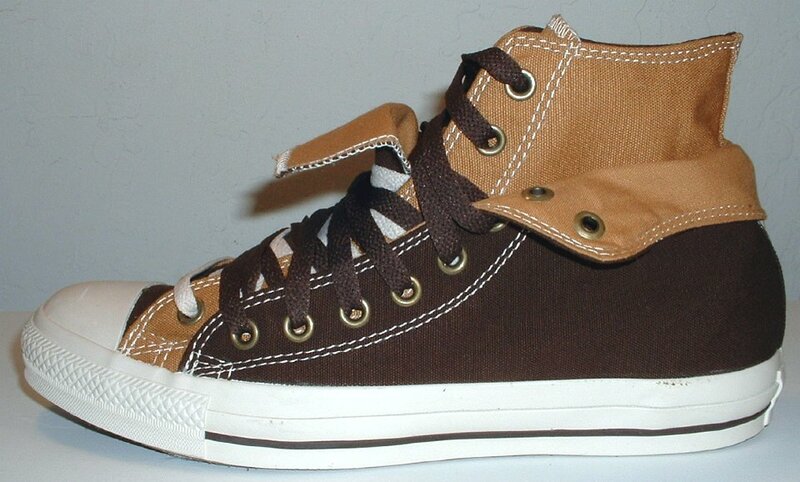 127 Double Upper High Top Chucks Wearing chocolate and sienna double upper high tops, side view. 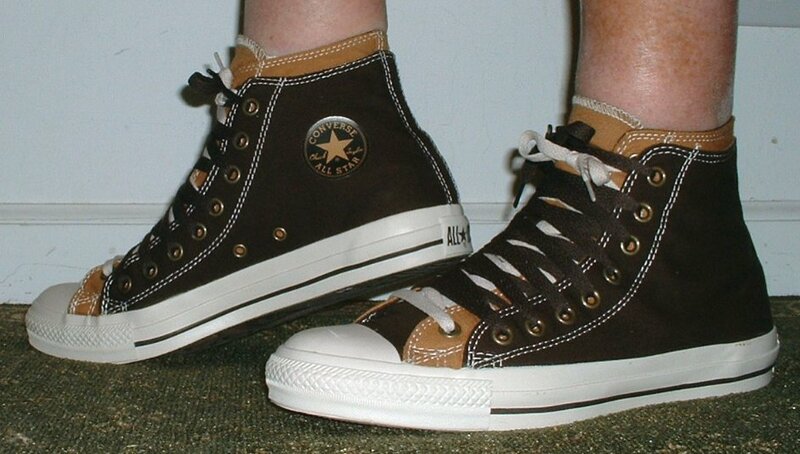 128 Double Upper High Top Chucks Wearing chocolate and sienna double upper high tops, rear view. 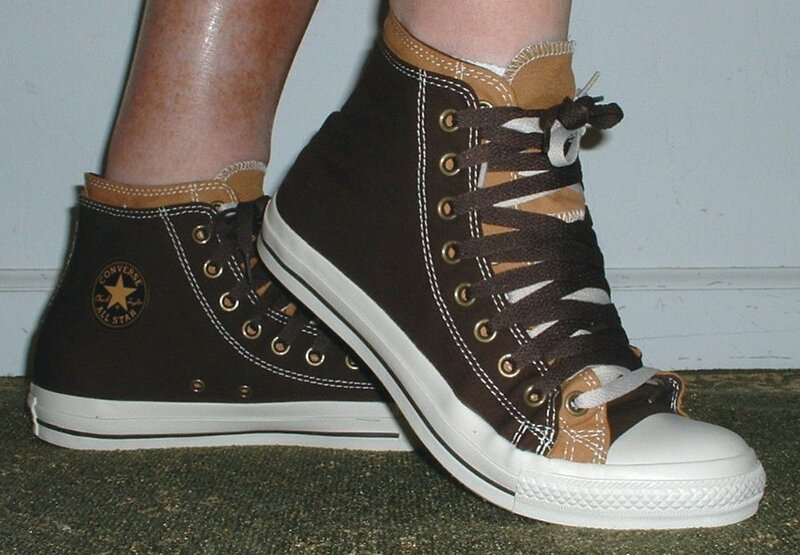 129 Double Upper High Top Chucks Wearing chocolate and sienna double upper high tops, front view. 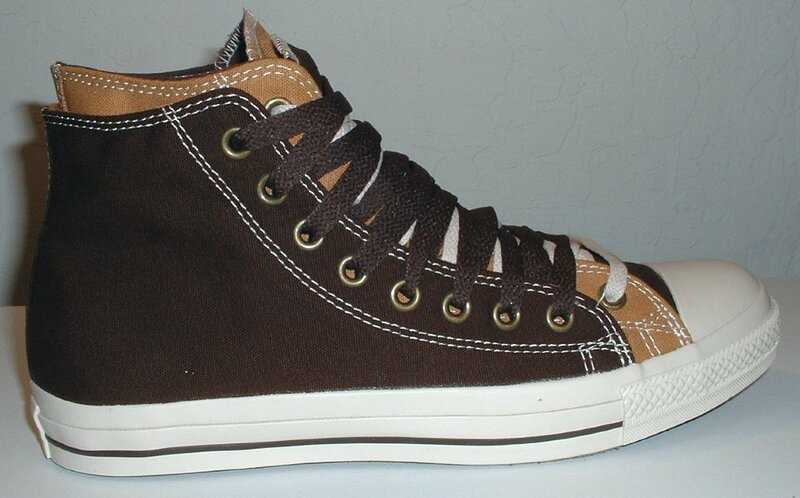 130 Double Upper High Top Chucks Wearing chocolate and sienna double upper high tops, side view. 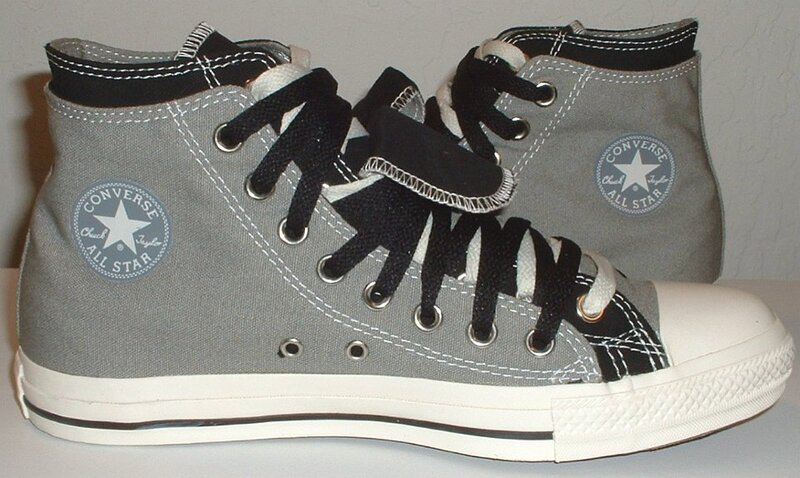 131 Double Upper High Top Chucks Inside patch view of a left gray and black double upper high top, with the outer upper rolled down. 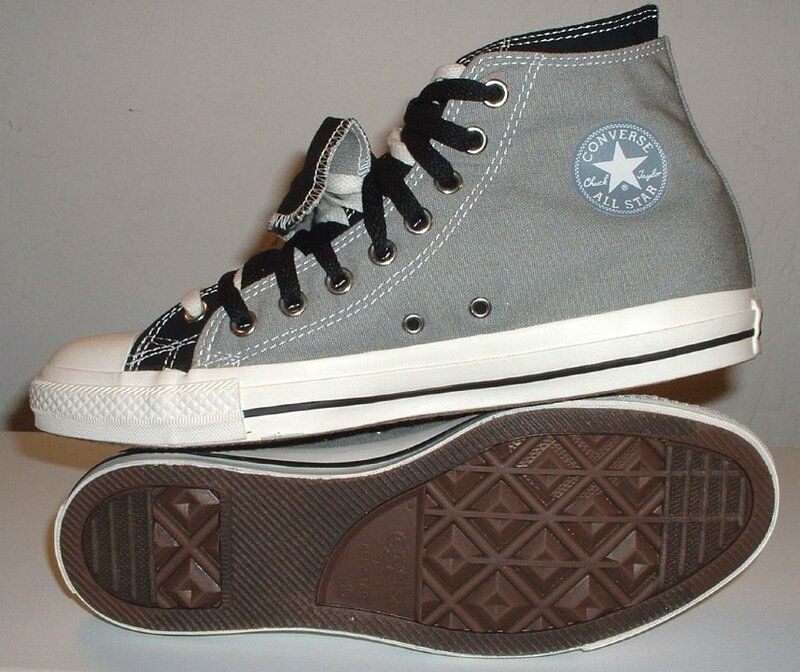 132 Double Upper High Top Chucks Outside view of a left gray and black double upper high top, with the outer upper rolled down. 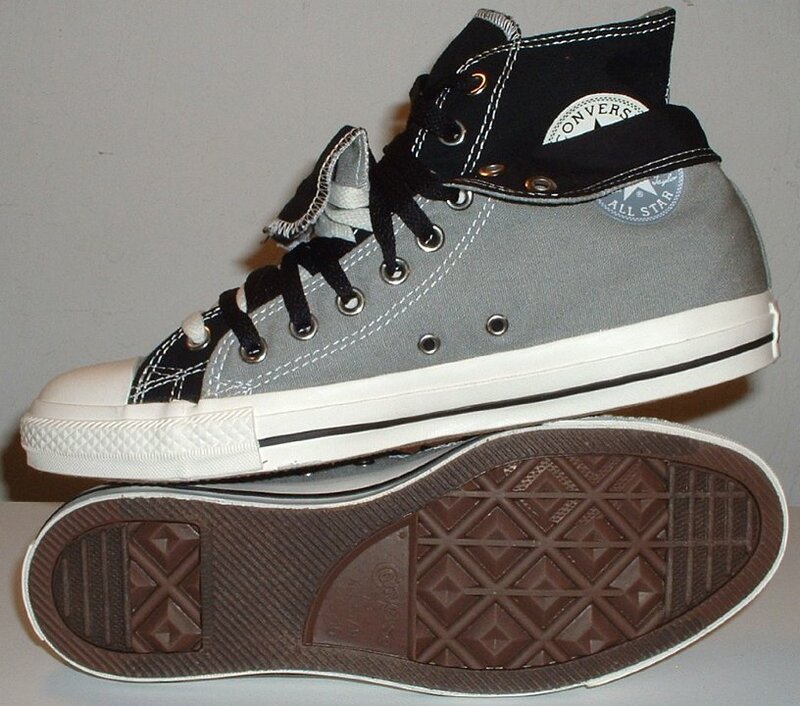 133 Double Upper High Top Chucks Outside view of a right gray and black double upper high top, with the outer upper rolled down. 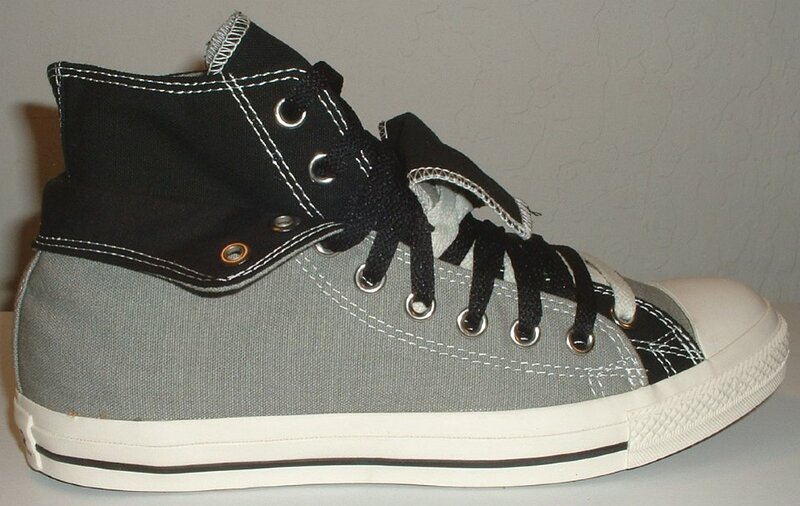 134 Double Upper High Top Chucks Inside patch view of a right gray and black double upper high top, with the outer upper rolled down. 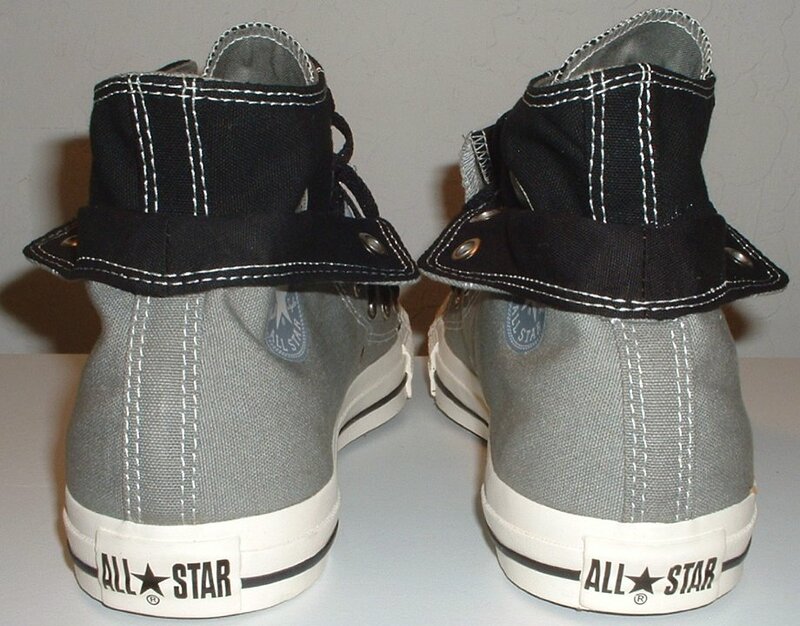 135 Double Upper High Top Chucks Rear view of gray and black double upper high tops, with the outer upper rolled down. 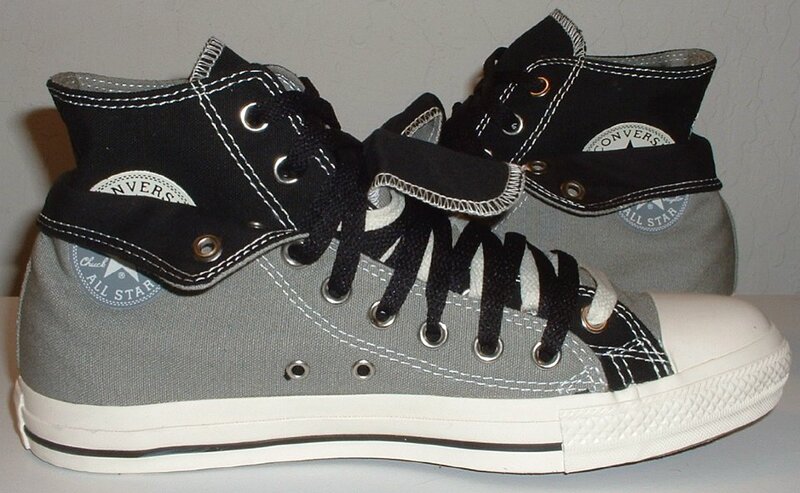 136 Double Upper High Top Chucks Front view of gray and black double upper high tops, with the outer upper rolled down. 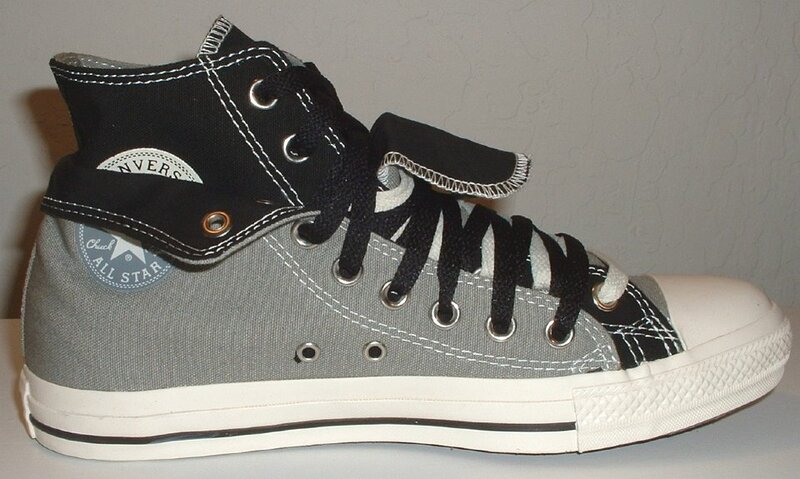 138 Double Upper High Top Chucks Angled side view of gray and black double upper high tops, with the outer upper rolled down. 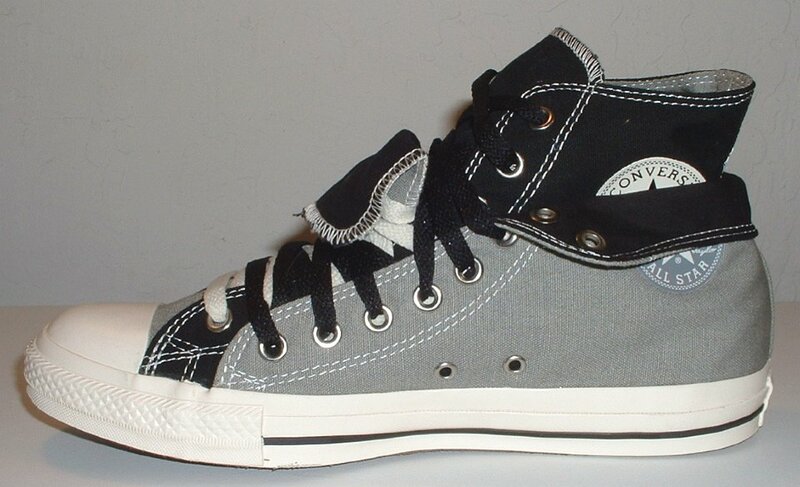 139 Double Upper High Top Chucks Top view of gray and black double upper high tops, with the outer upper rolled down. 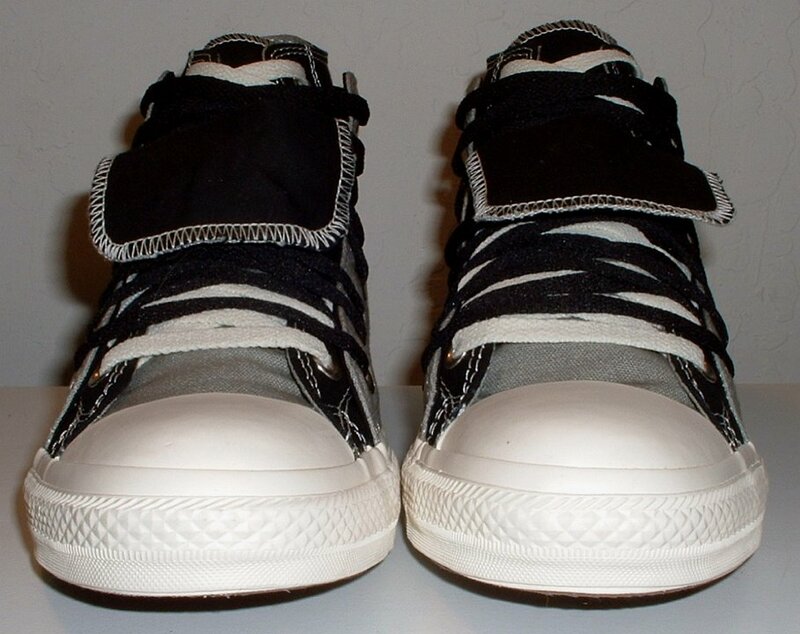 140 Double Upper High Top Chucks Inside patch views of gray and black double upper high tops, with the outer uppers rolled down. 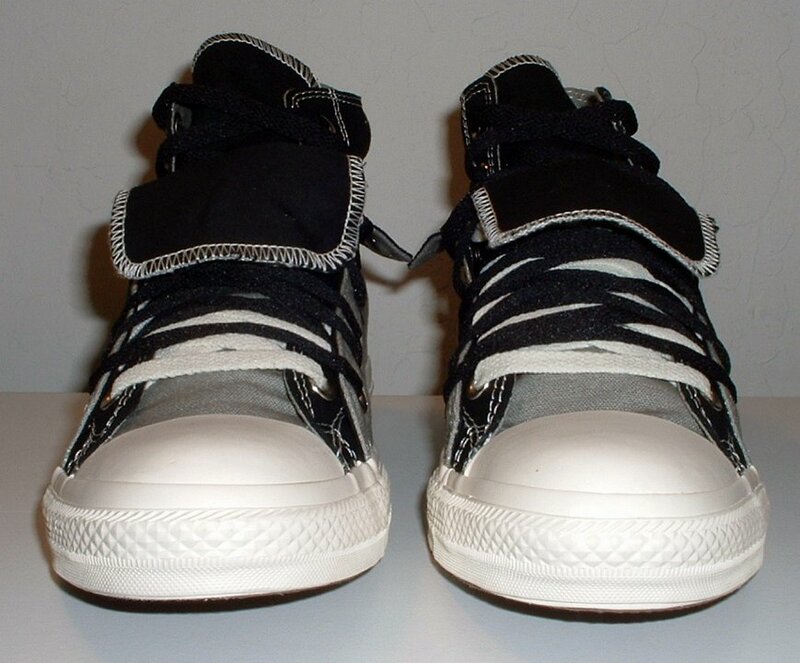 141 Double Upper High Top Chucks Inside patch and sole views of gray and black double upper high tops, with the outer uppers rolled down. 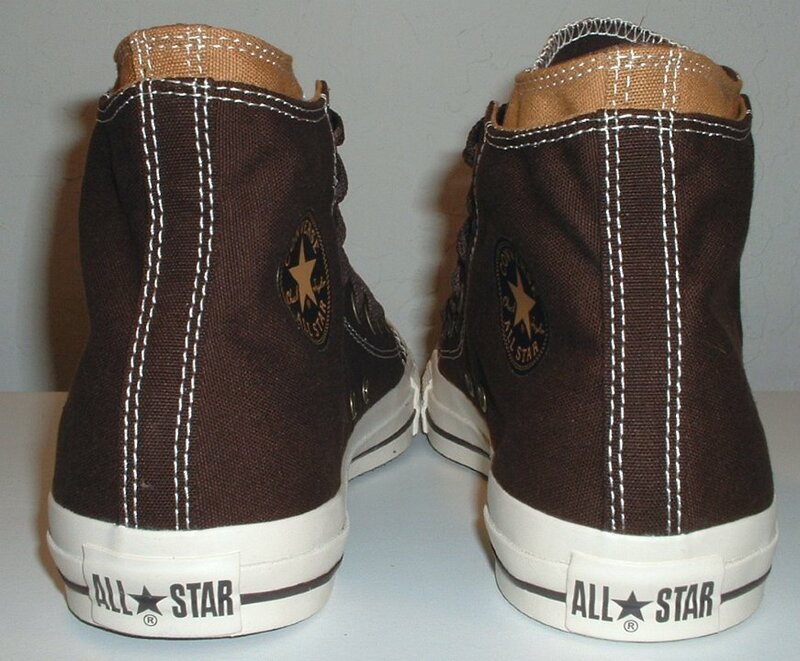 142 Double Upper High Top Chucks Inside patch view of a right chocolate and sienna double upper high top. 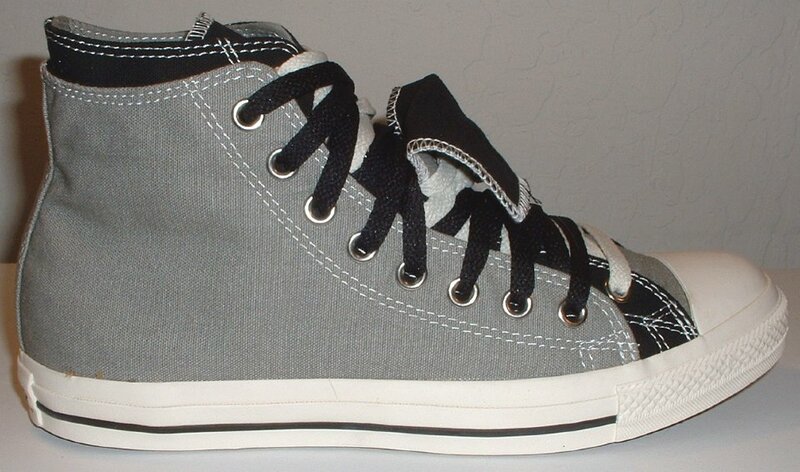 143 Double Upper High Top Chucks Outside view of a right gray and black double upper high top. 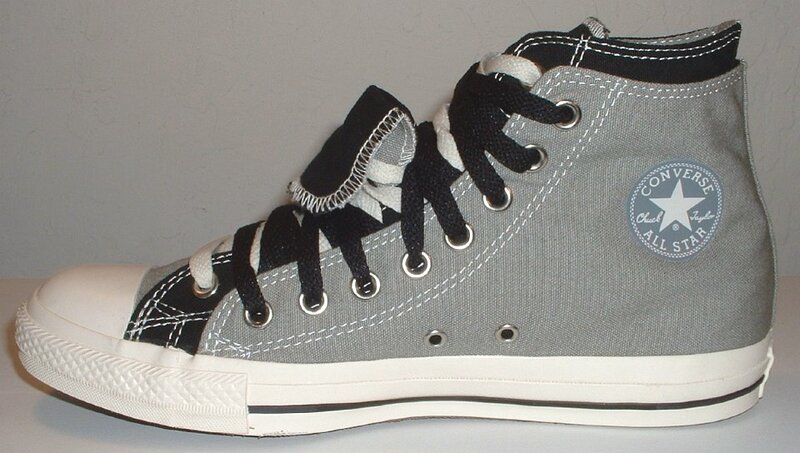 144 Double Upper High Top Chucks Inside patch view of a left gray and black double upper high top. 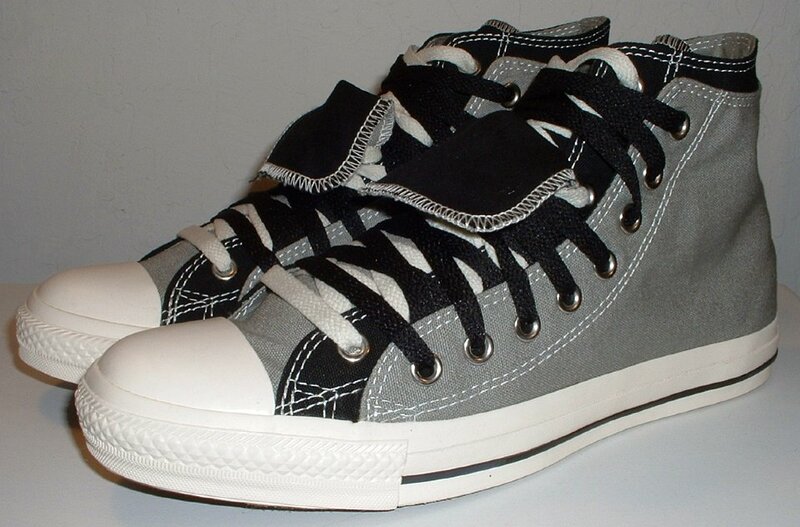 145 Double Upper High Top Chucks Outside view of a left gray and black double upper high top. 146 Double Upper High Top Chucks Rear view of gray and black double upper high tops. 147 Double Upper High Top Chucks Angled side view of gray and black double upper high tops. 148 Double Upper High Top Chucks Front view of gray and black double upper high tops. 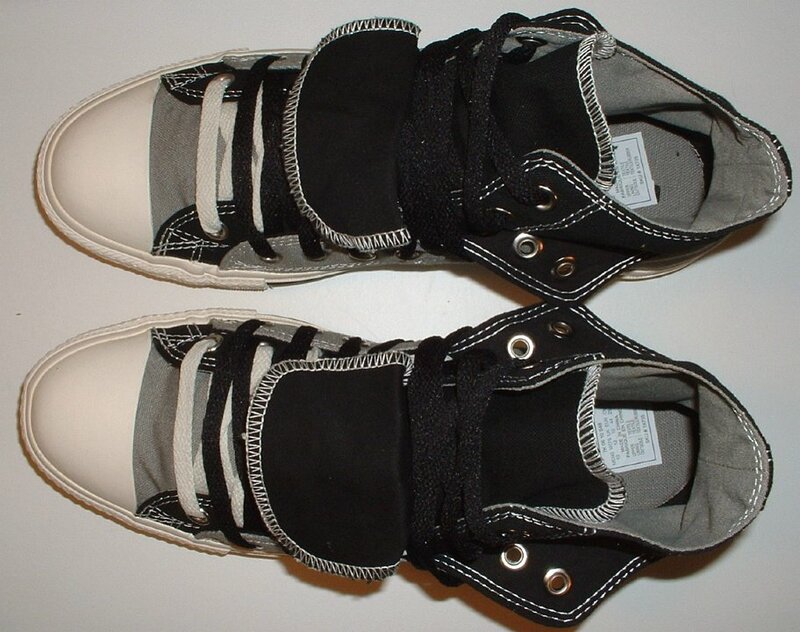 149 Double Upper High Top Chucks Angled front views of gray and black double upper high tops. 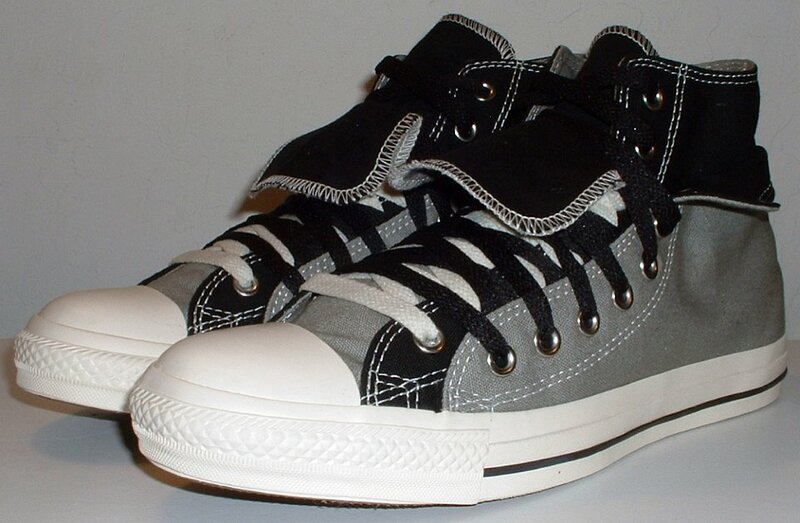 150 Double Upper High Top Chucks Top view of gray and black double upper high tops. 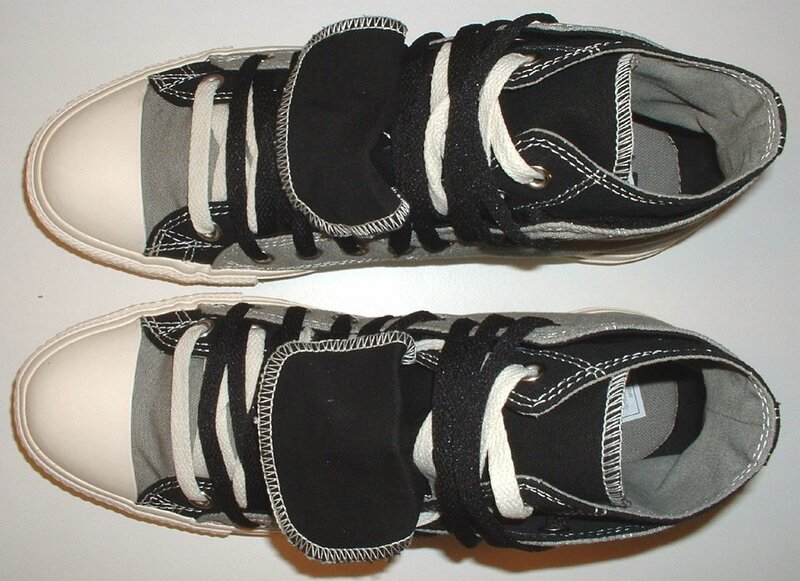 151 Double Upper High Top Chucks Inside patch views of gray and black double upper high tops. 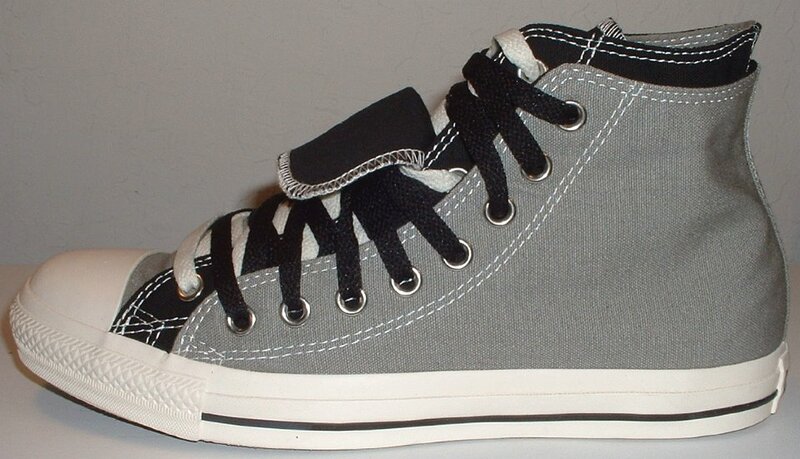 152 Double Upper High Top Chucks Inside patch and sole views of gray and black double upper high tops. 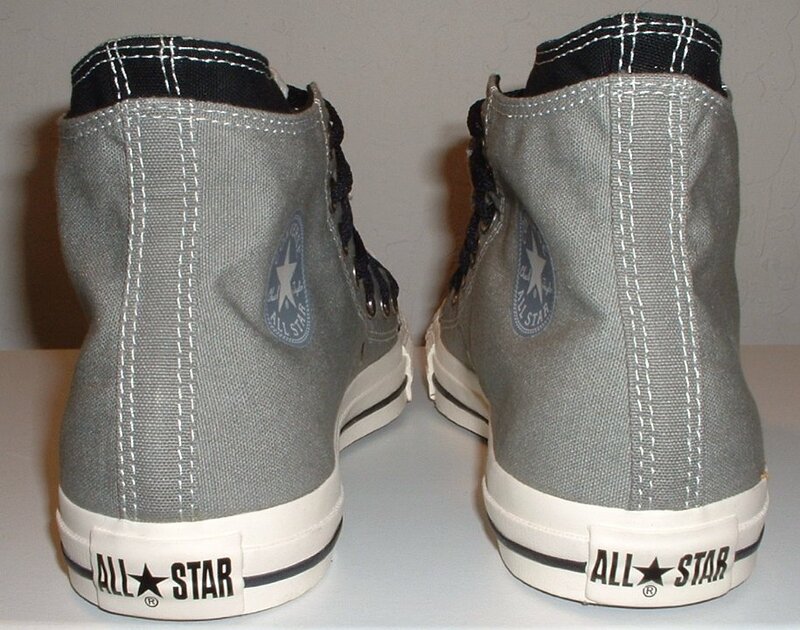 153 Double Upper High Top Chucks Grey and plaid double upper high top chucks, angled side view. 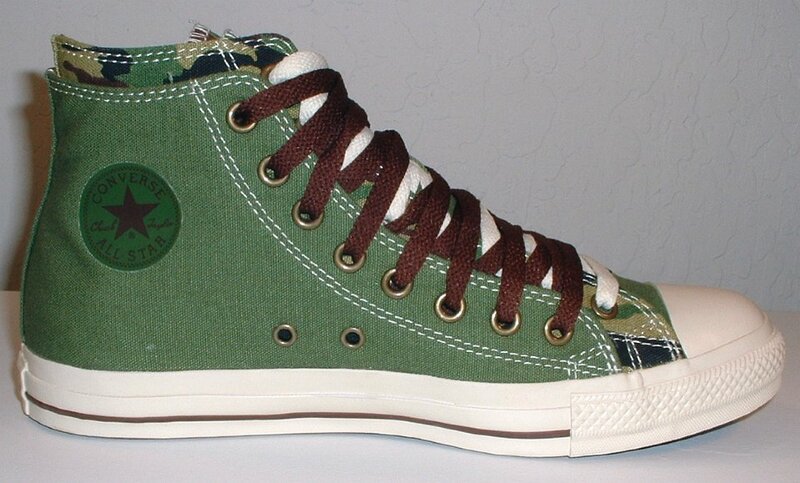 154 Double Upper High Top Chucks Inside patch view of a left olive, brown, and camouflage double upper high top. 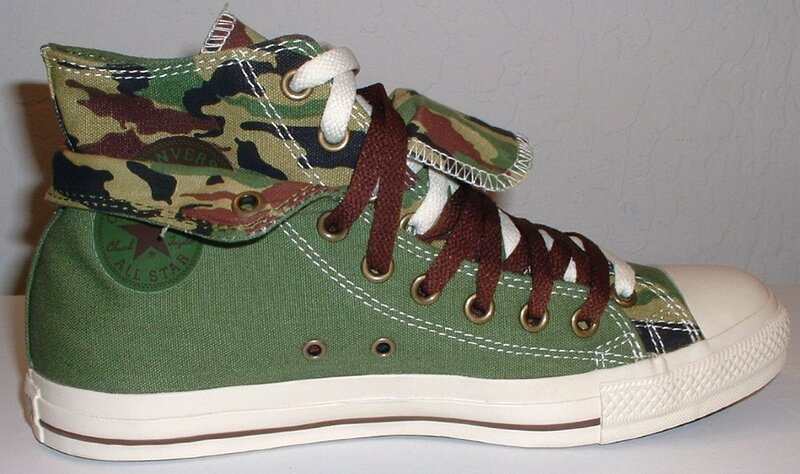 155 Double Upper High Top Chucks Outside view of a left olive, brown, and camouflage double upper high top. 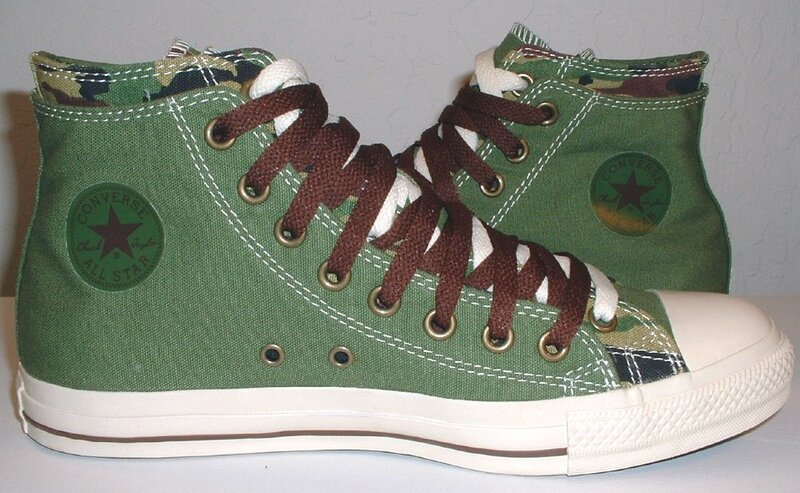 156 Double Upper High Top Chucks Inside patch view of a right olive, brown, and camouflage double upper high top. 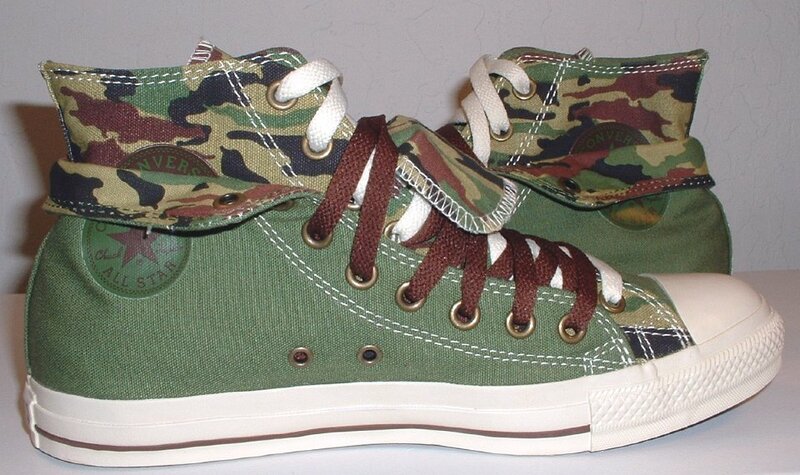 157 Double Upper High Top Chucks Outside view of a right olive, brown, and camouflage double upper high top. 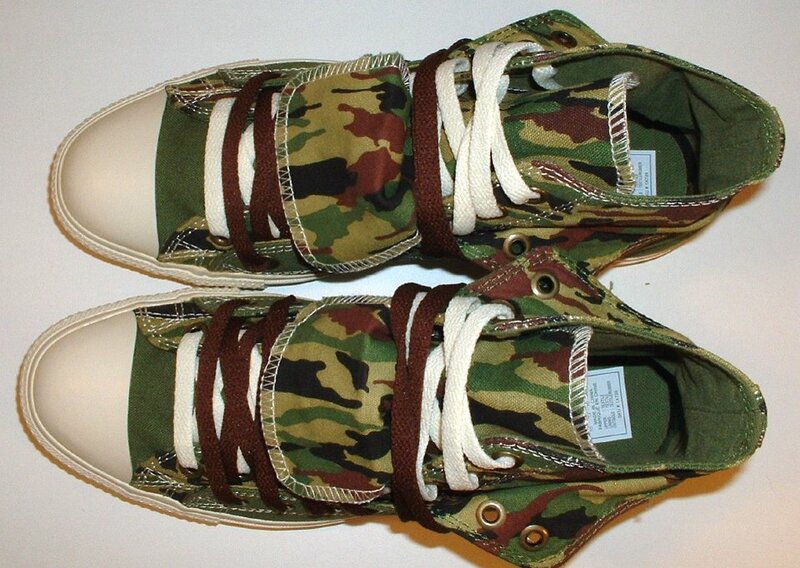 158 Double Upper High Top Chucks Rear view of olive, brown, and camouflage double upper high tops. 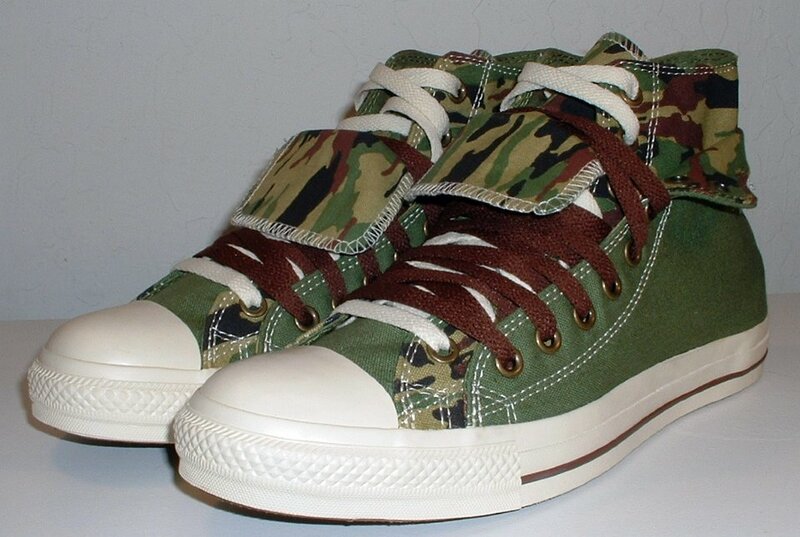 159 Double Upper High Top Chucks Front view of olive, brown, and camouflage double upper high tops. 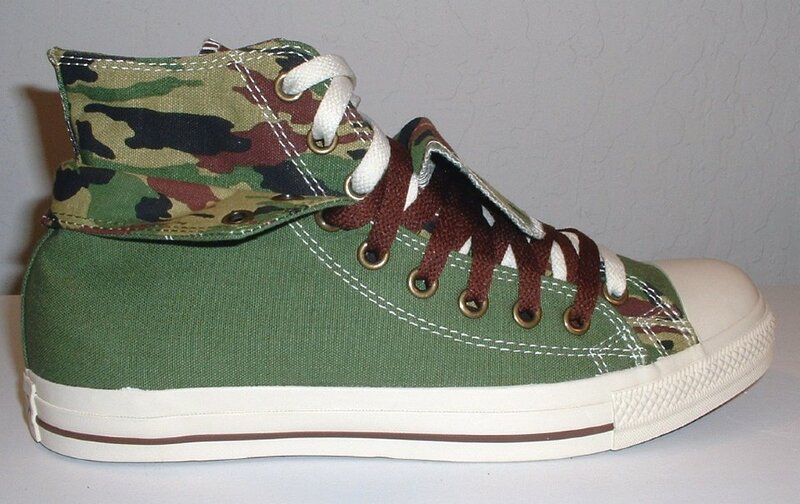 160 Double Upper High Top Chucks Angled side view of olive, brown, and camouflage double upper high tops. 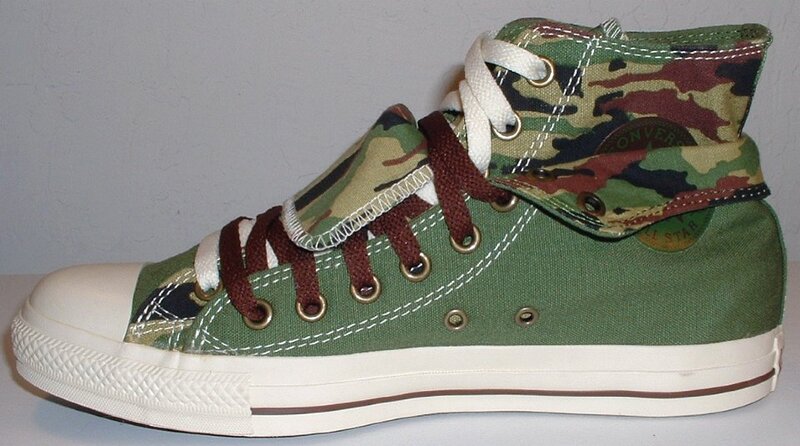 161 Double Upper High Top Chucks Angled front views of olive, brown, and camouflage double upper high tops. 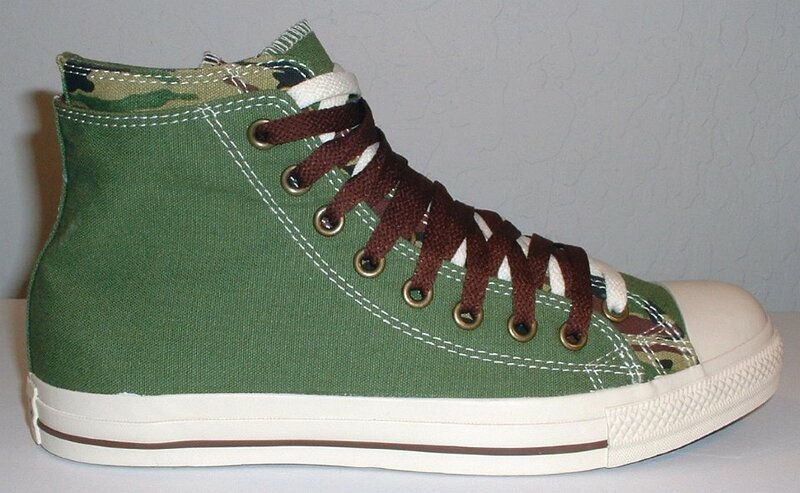 162 Double Upper High Top Chucks Top view of olive, brown, and camouflage double upper high tops. 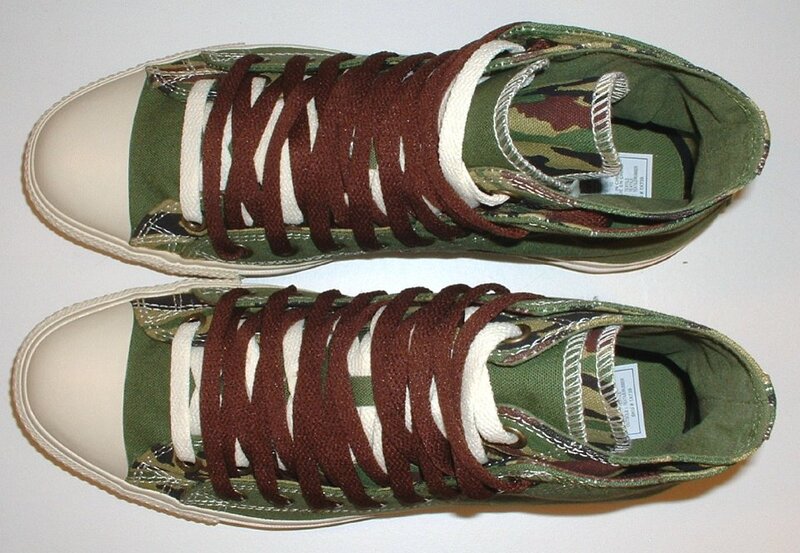 163 Double Upper High Top Chucks Inside patch views of olive, brown, and camouflage double upper high tops. 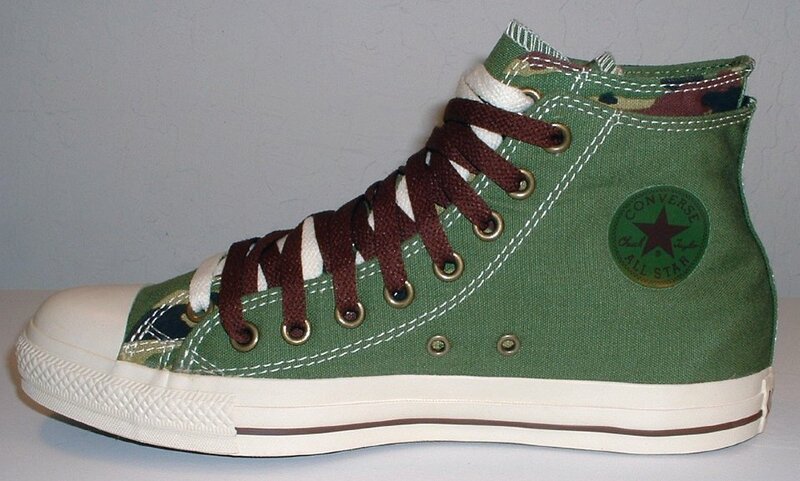 164 Double Upper High Top Chucks Inside patch and sole views of olive, brown, and camouflage double upper high tops. 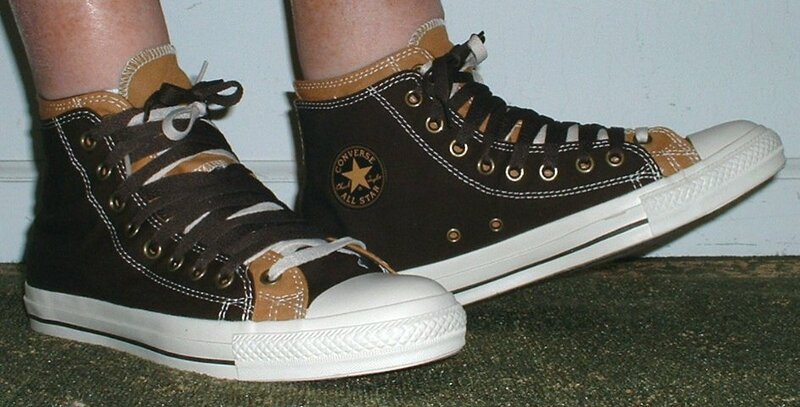 165 Double Upper High Top Chucks Outside view of a right olive, brown, and camouflage double upper high top, with the outer upper rolled down. 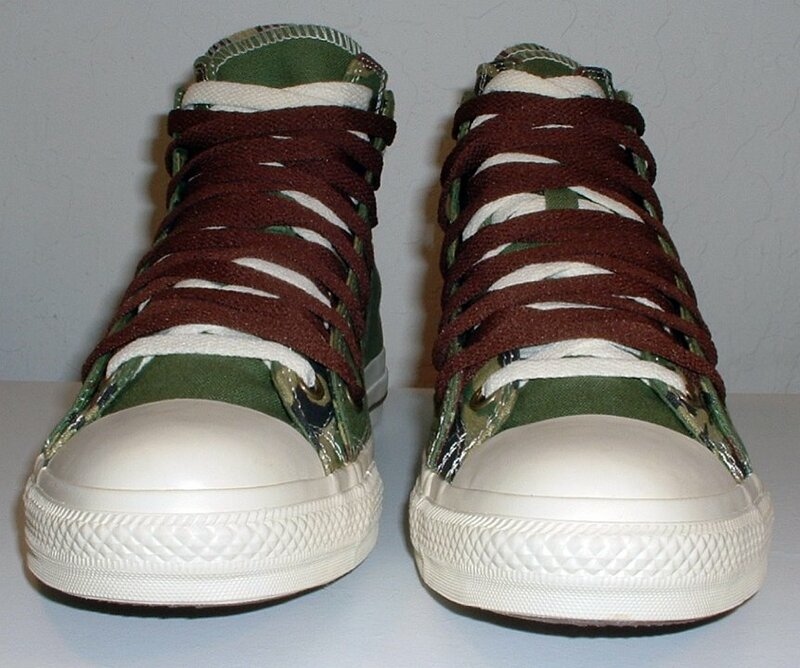 166 Double Upper High Top Chucks Inside patch view of a right olive, brown, and camouflage double upper high top, with the outer upper rolled down. 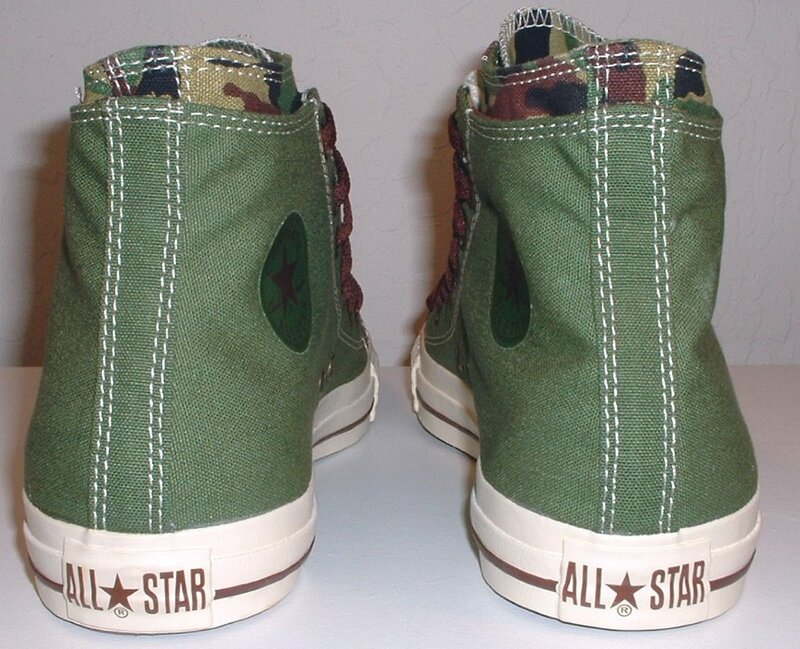 167 Double Upper High Top Chucks Inside patch view of a left olive, brown, and camouflage double upper high top, with the outer upper rolled down. 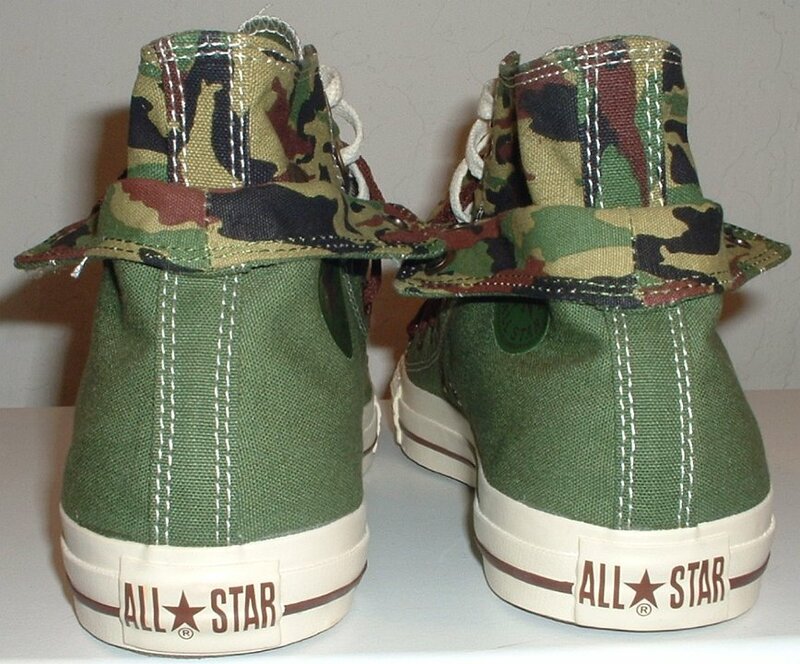 169 Double Upper High Top Chucks Rear view of olive, brown, and camouflage double upper high tops, with the outer upper rolled down. 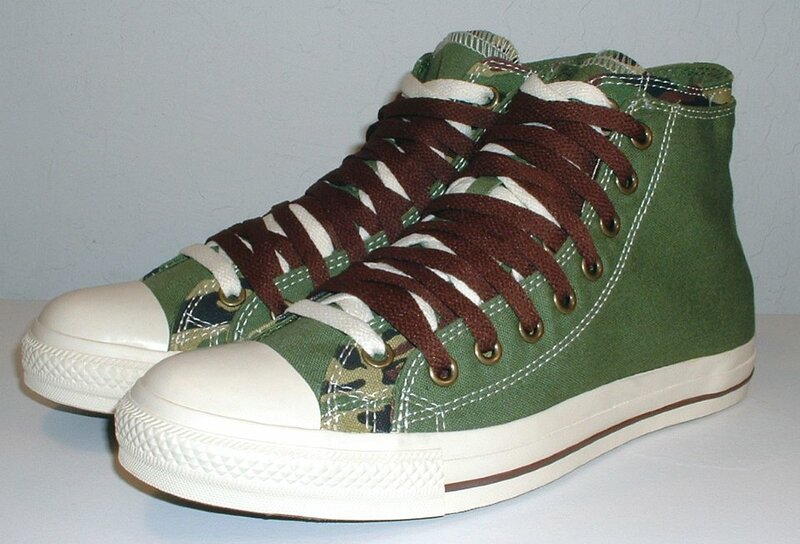 170 Double Upper High Top Chucks Angled side view of olive, brown, and camouflage double upper high tops, with the outer upper rolled down. 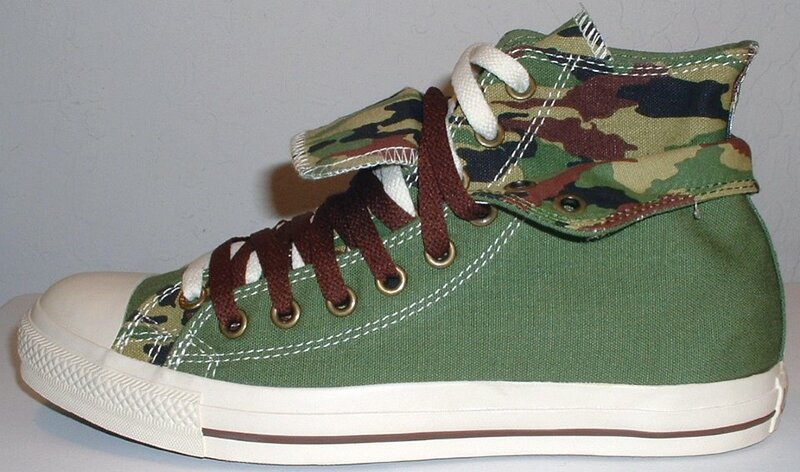 171 Double Upper High Top Chucks Front view of olive, brown, and camouflage double upper high tops, with the outer upper rolled down. 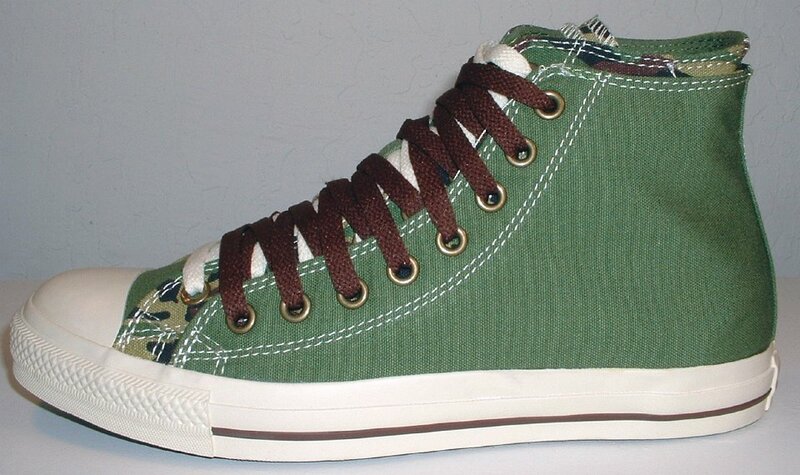 172 Double Upper High Top Chucks Inside patch views of olive, brown, and camouflage double upper high tops, with the outer uppers rolled down. 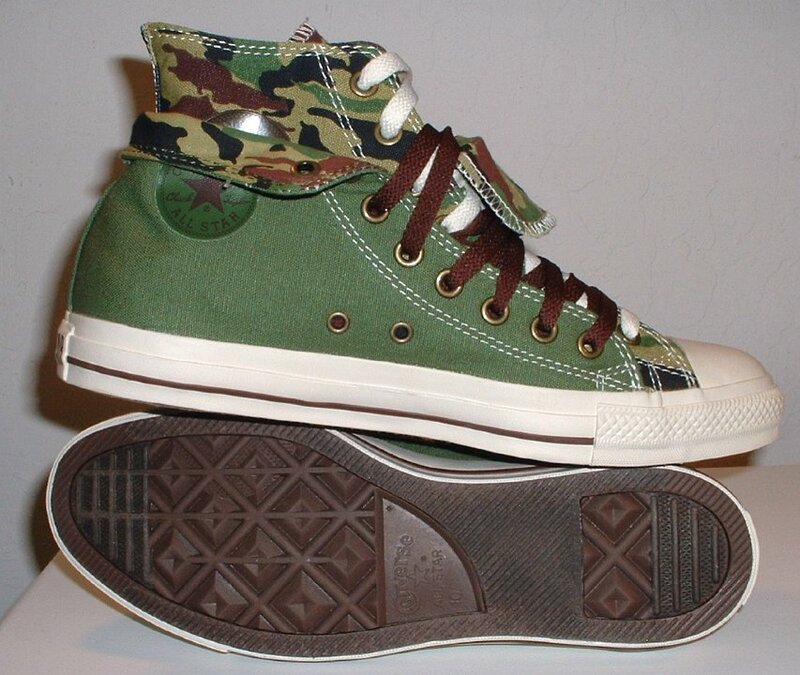 173 Double Upper High Top Chucks Top view of olive, brown, and camouflage double upper high tops, with the outer upper rolled down. 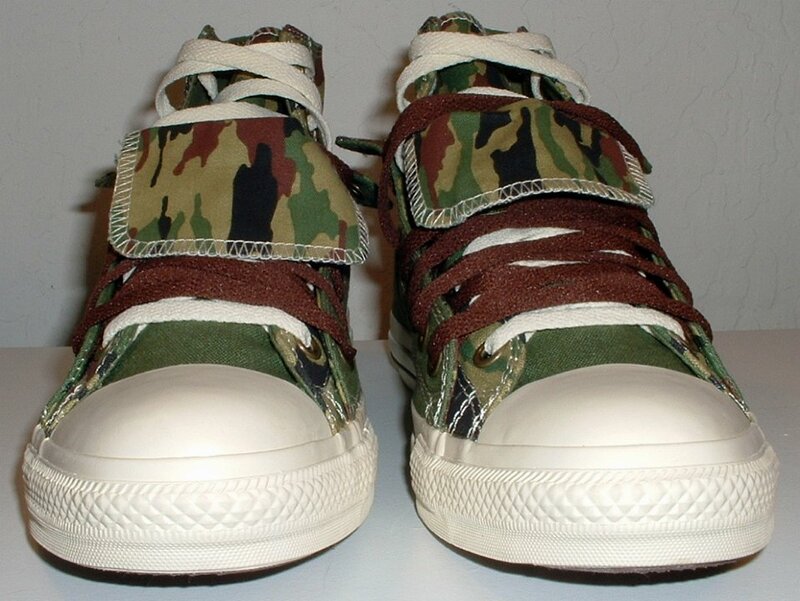 174 Double Upper High Top Chucks Angled front views of olive, brown, and camouflage double upper high tops, with the outer uppers rolled down. 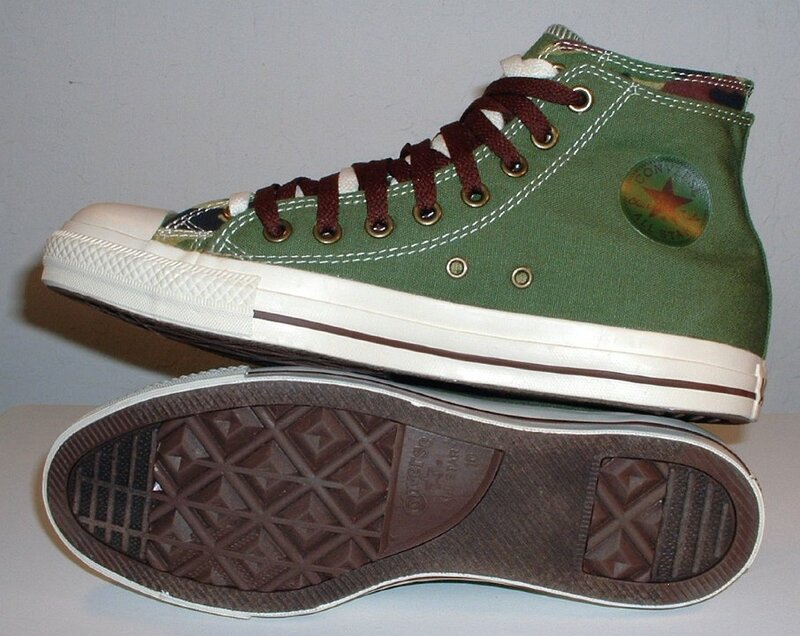 175 Double Upper High Top Chucks Inside patch and sole views of olive, brown, and camouflage double upper high tops, with the outer uppers rolled down. 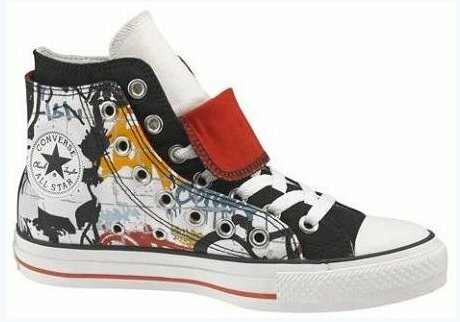 176 Double Upper High Top Chucks Urban print and black double upper high top chuck. 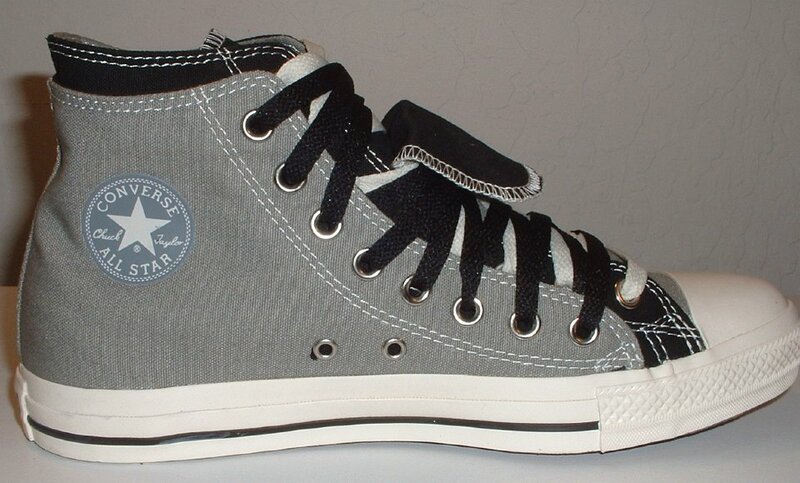 177 Double Upper High Top Chucks Wearing grey and black double upper low cut chucks. 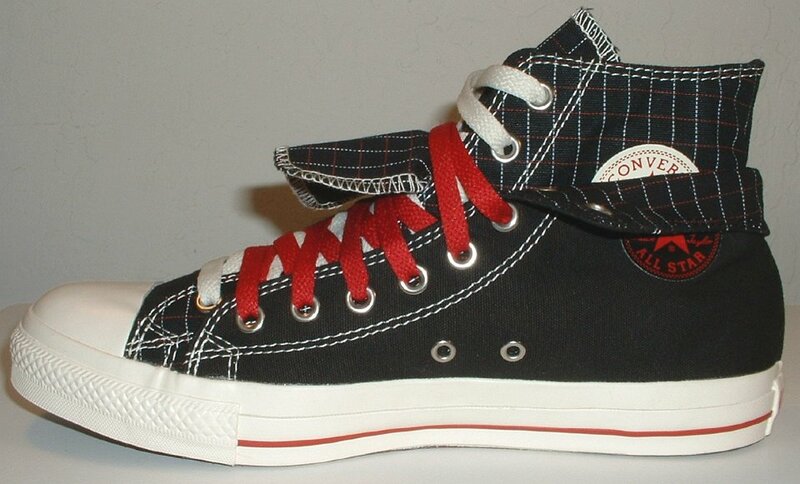 178 Double Upper High Top Chucks Wearing black and print double upper high top chucks, shot 1. 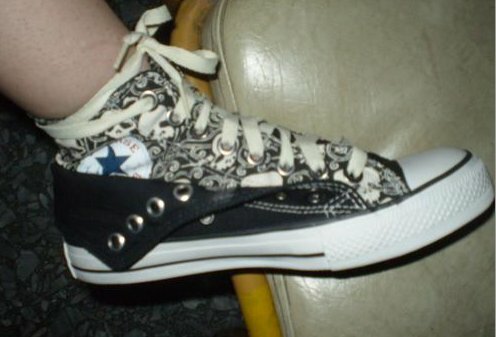 179 Double Upper High Top Chucks Wearing black and print double upper high top chucks, shot 2. 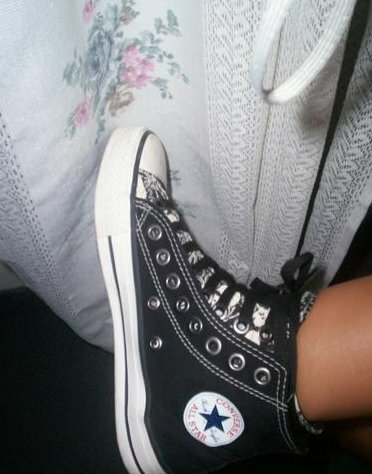 180 Double Upper High Top Chucks Wearing black and print double upper high top chucks, shot 3. 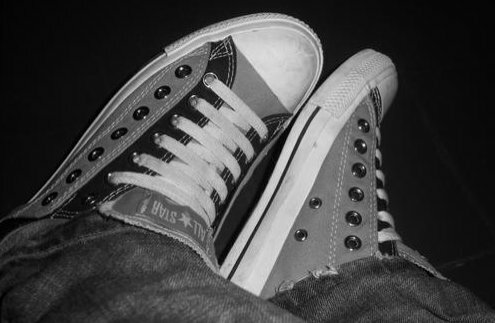 Double upper high tops were first released in 2007. 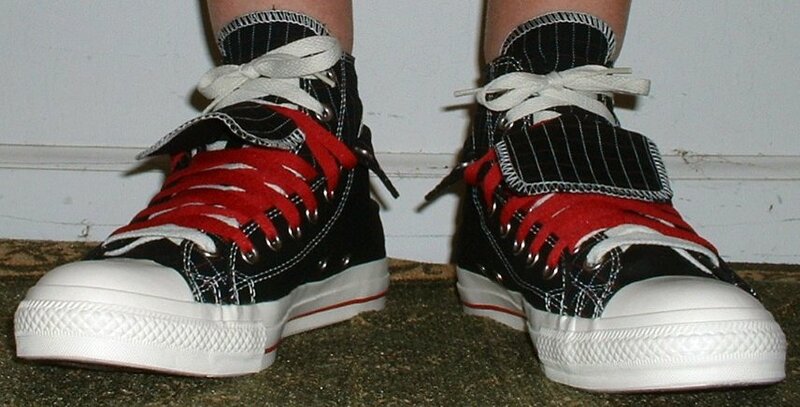 Each shoe has two sets of uppers, one within the other, that are the reverse of each other in color or pattern. 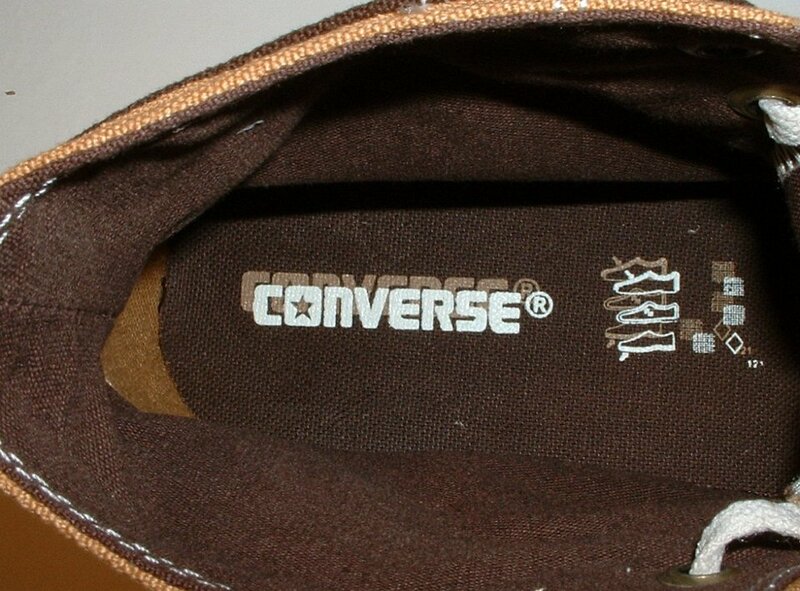 The shoes also have double tongues. 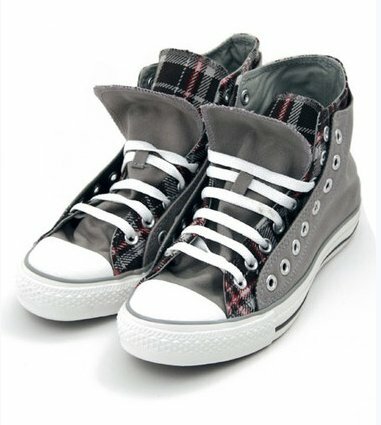 Each pair of shoes comes with two sets of shoelaces and there is a lace notch on the upper tongue to hold help position and hold the tongues in place. 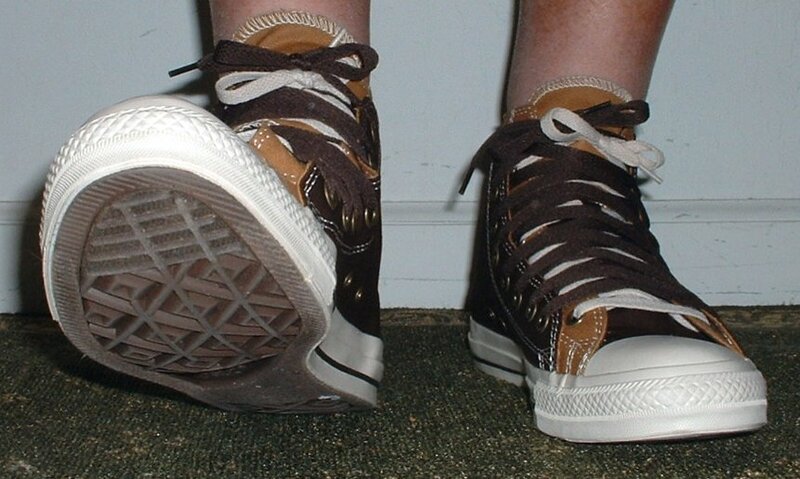 They can be worn with the outer upper folded down, or left in the upright position. 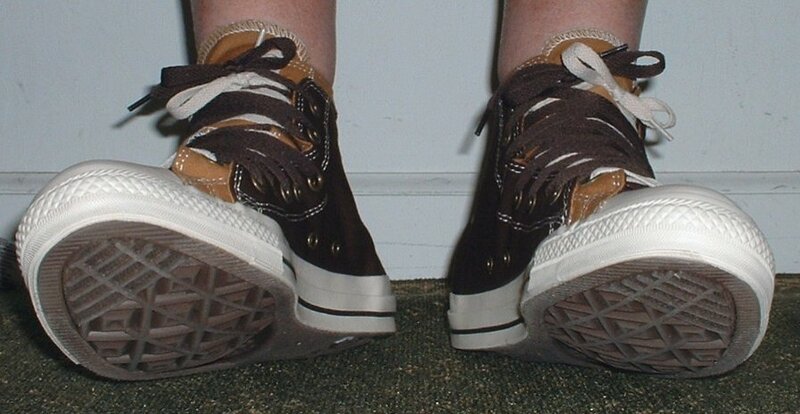 Some of the models do not have a rubber piping strip that encircles the toe caps and connects the outer foxing to the uppers.